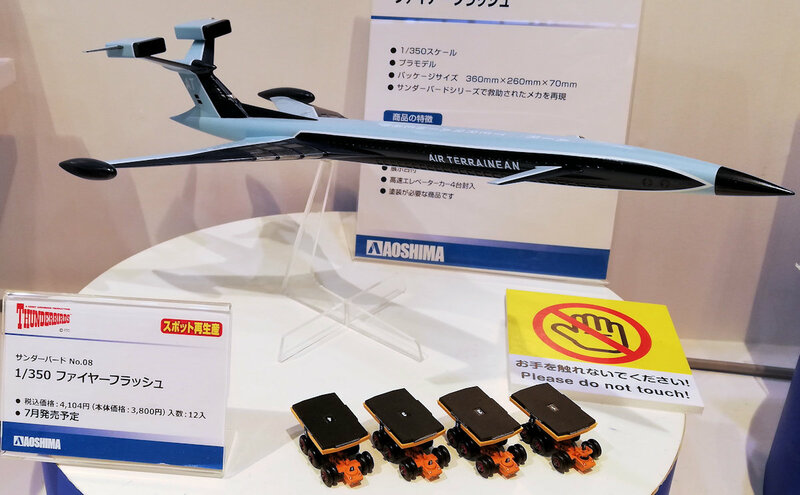 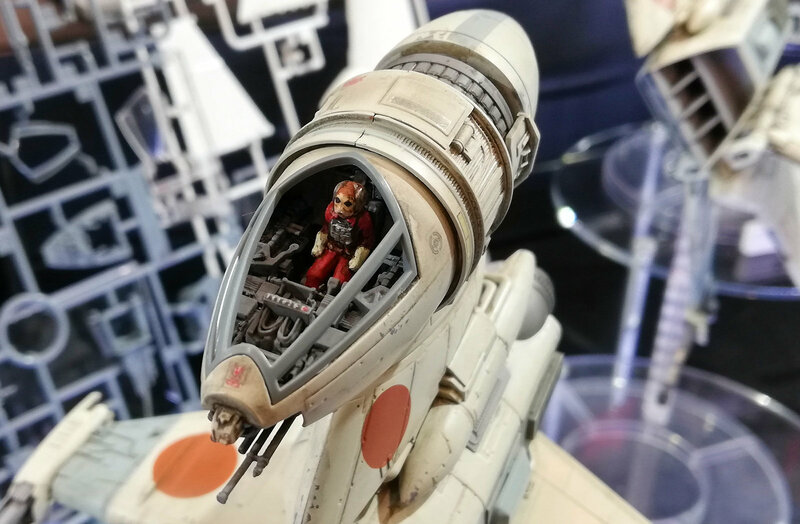 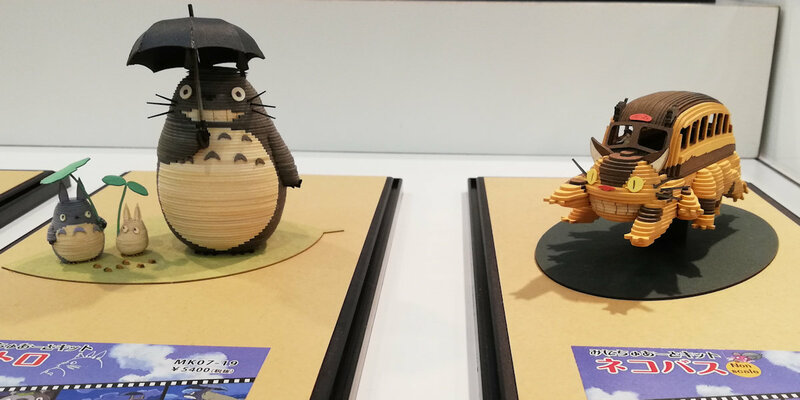 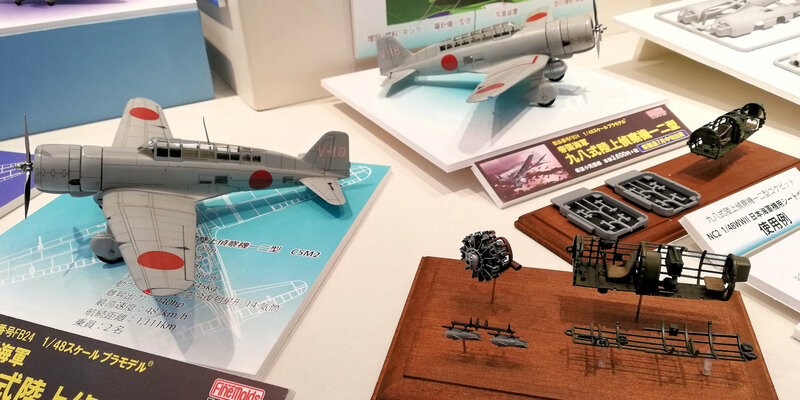 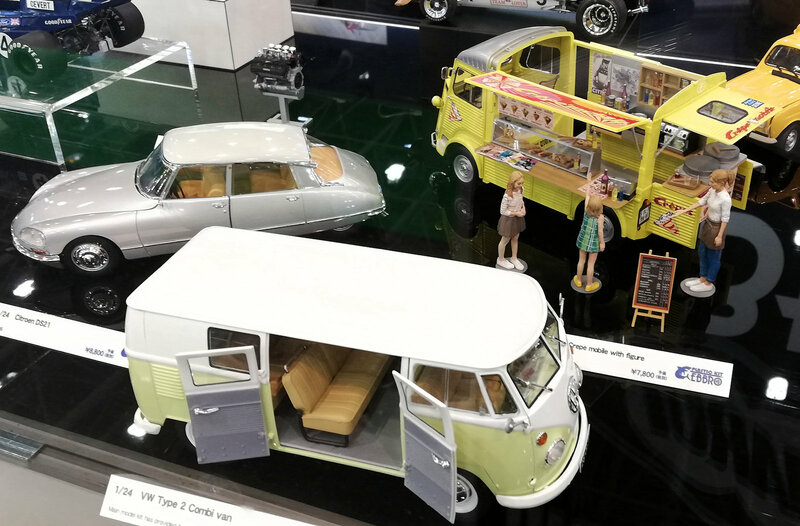 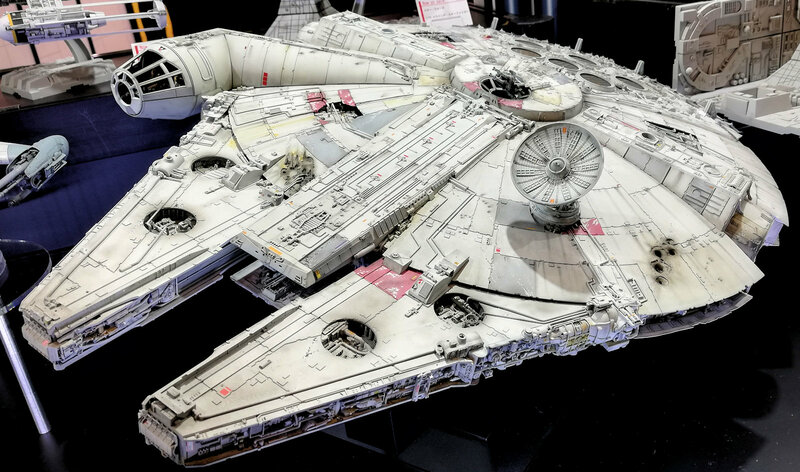 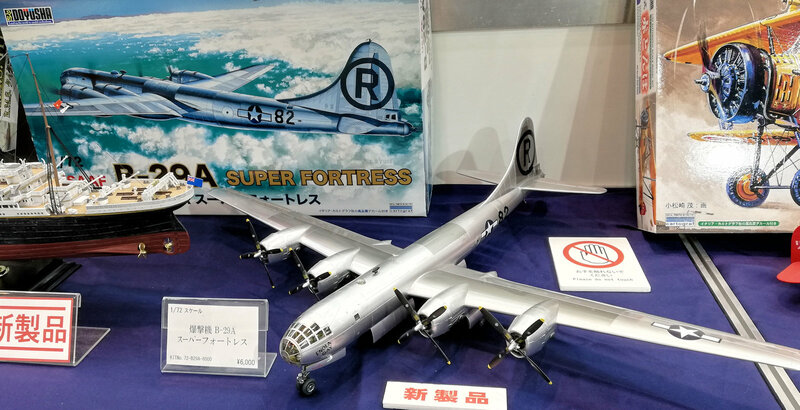 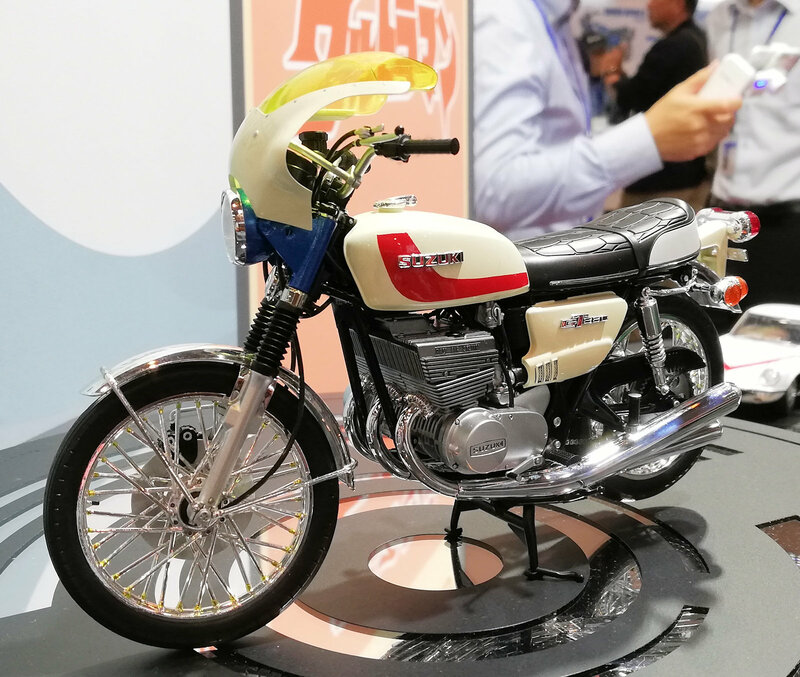 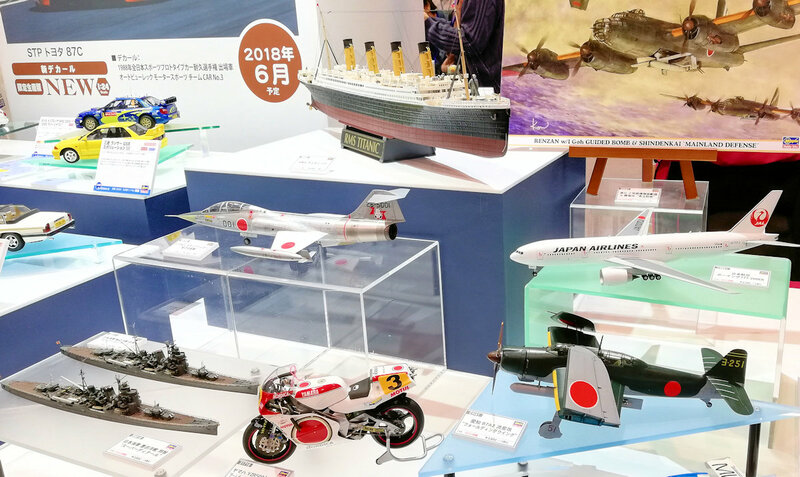 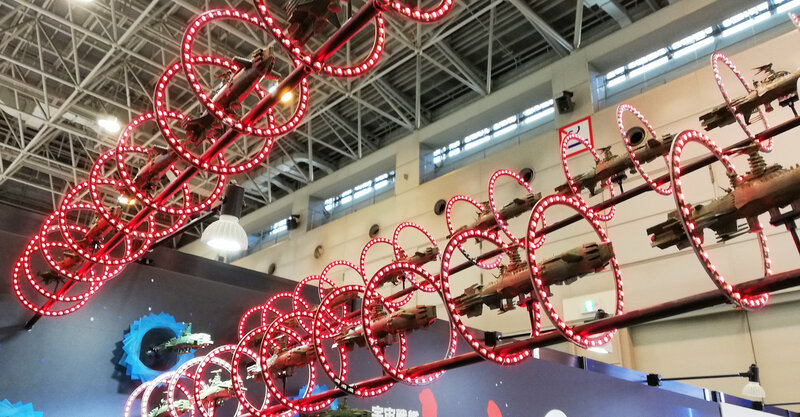 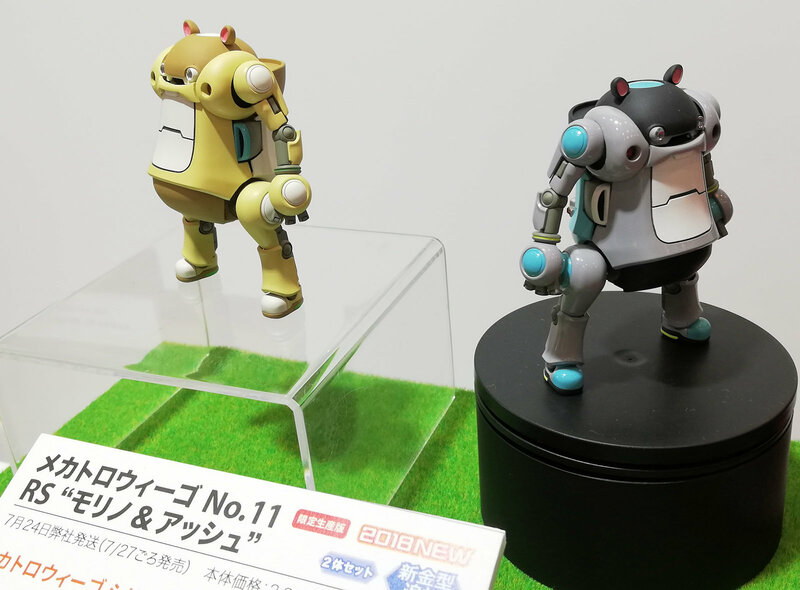 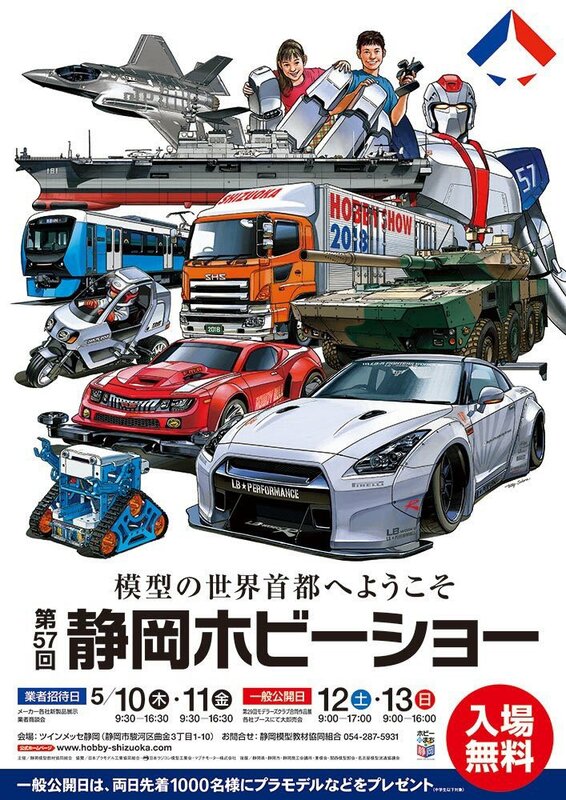 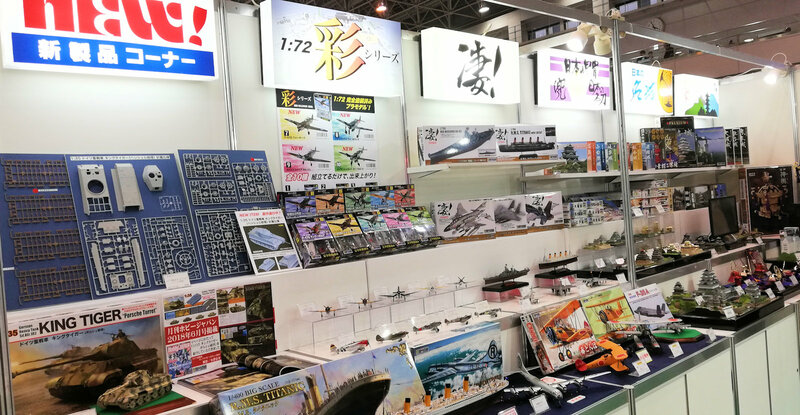 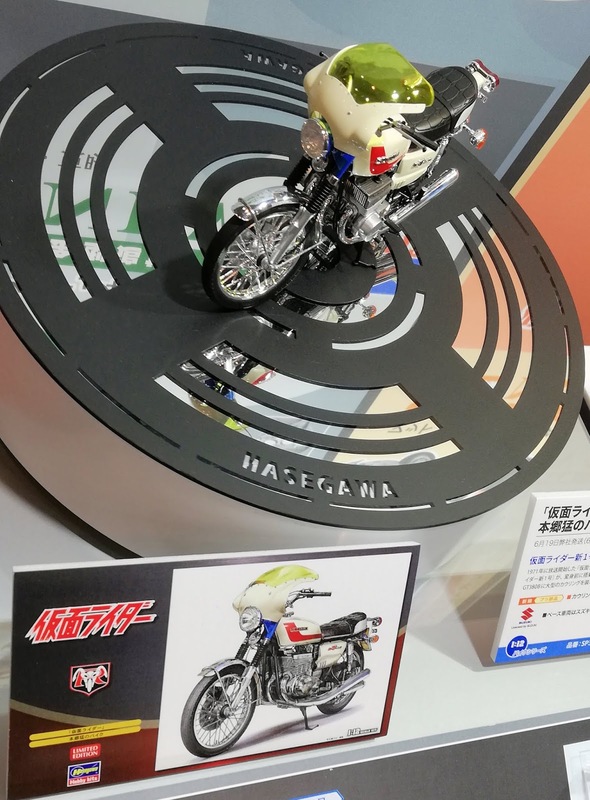 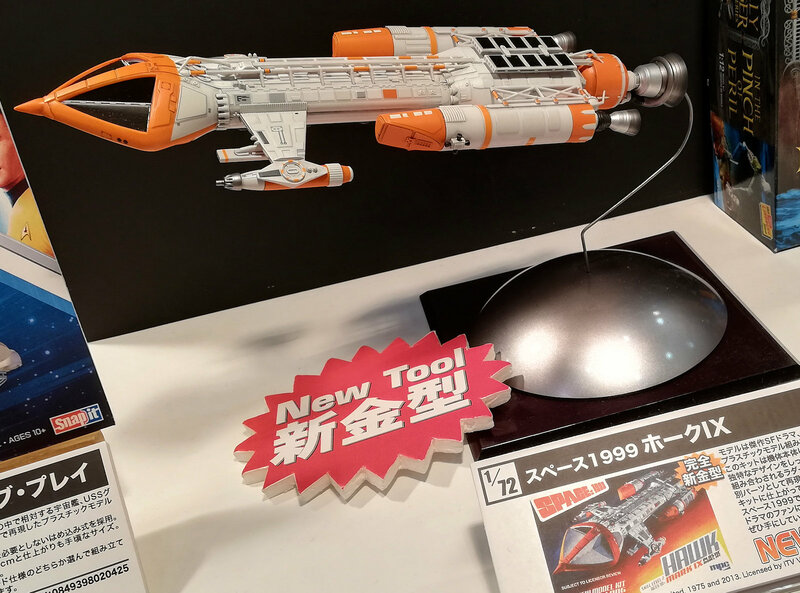 In reality, anyone can enter the Shizuoka Hobby show on the Thursday and Friday “Business Days,” although you will need to hand over your business card before you enter. 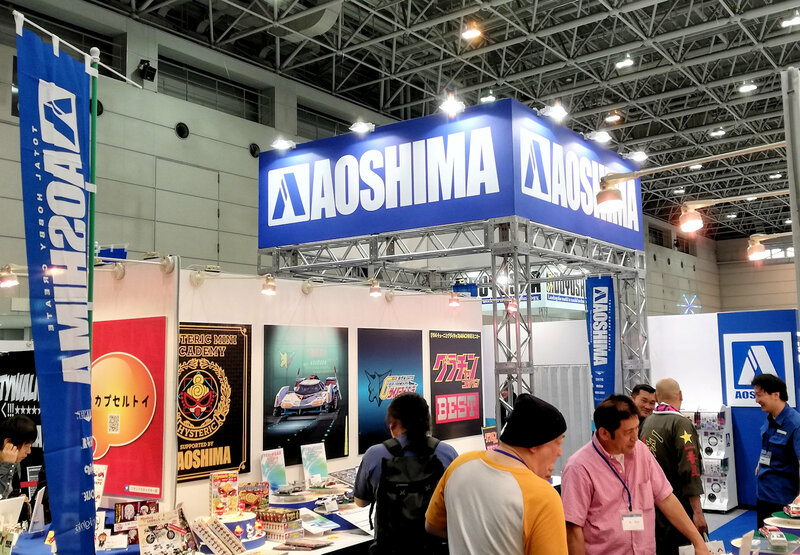 We found ourselves at the show on this, the quieter of days, and then later on the Saturday and Sunday busier show weekend days. 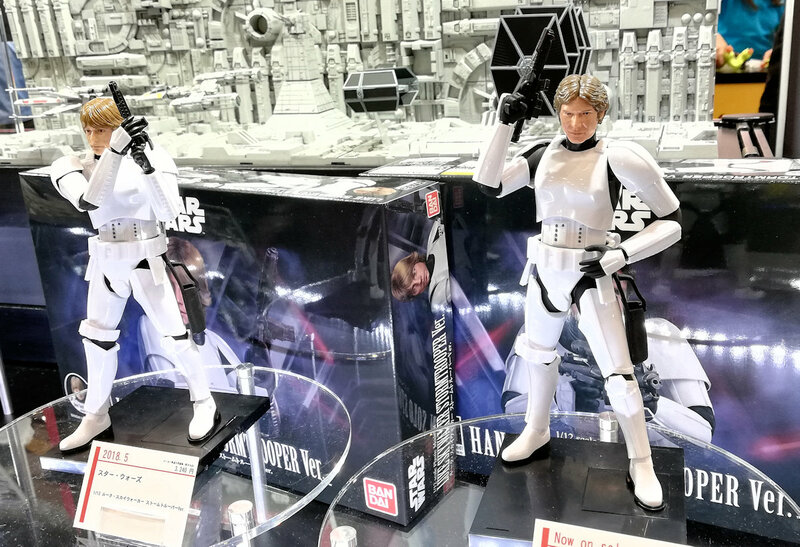 Both were just as interesting to us for two different reasons. 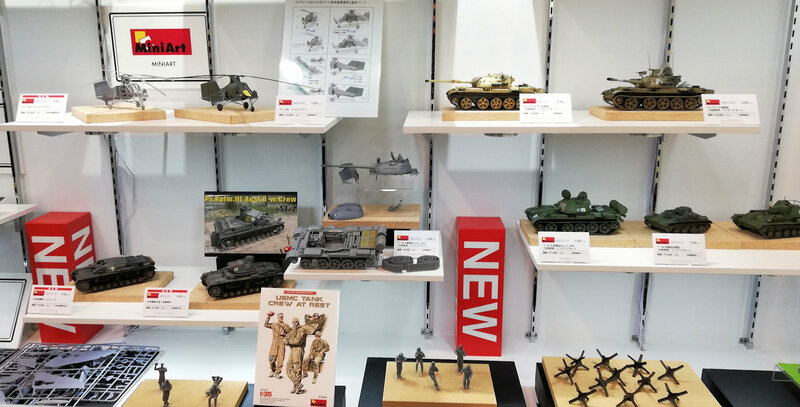 Plastic models, radio control cars, domestic famous manufacturers of railroad models come together to announce the new product of attention! 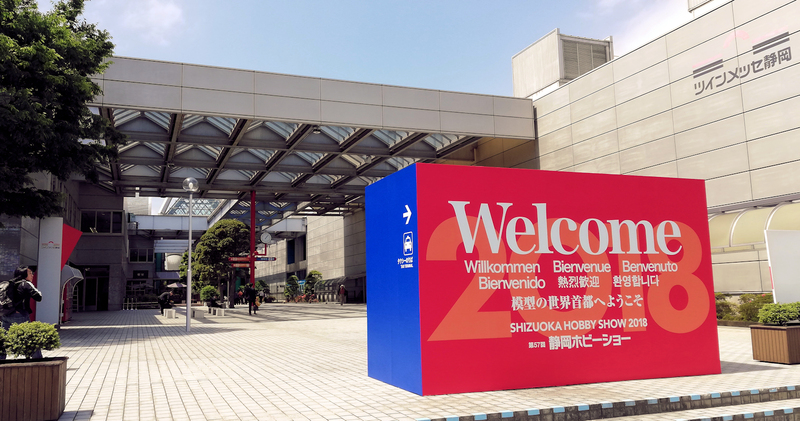 For the first two days, buyers from all over the world gather together as an agent invitation day, active negotiations will be held. 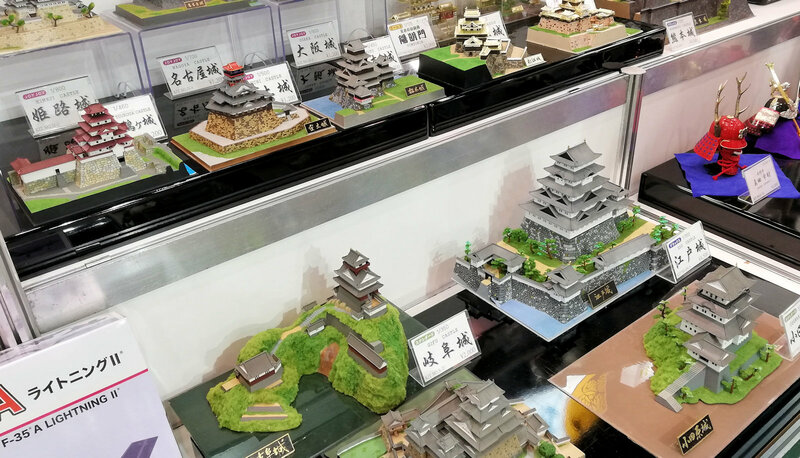 For the latter two days, it is a big event of open to the public as a public release date, a hobby big event where more than 70,000 visitors from all over the country get together. 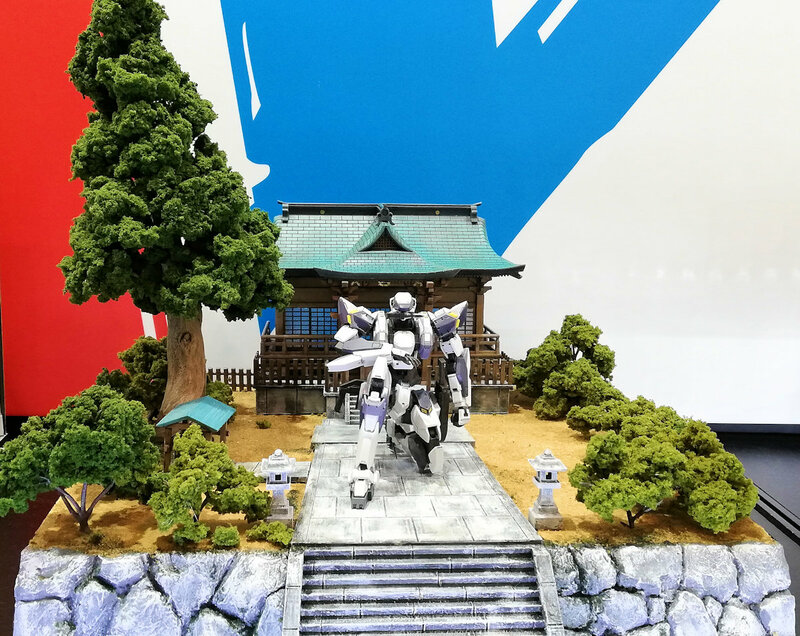 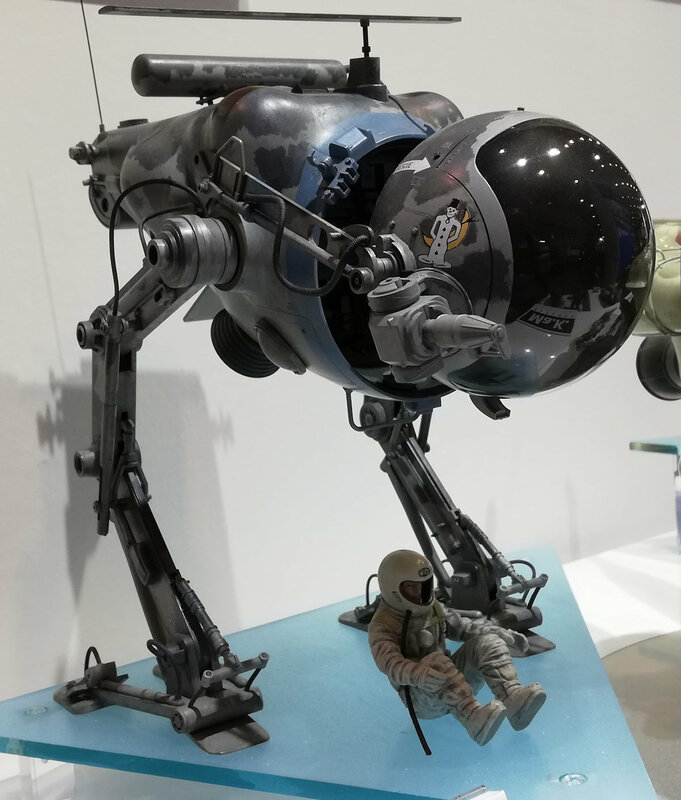 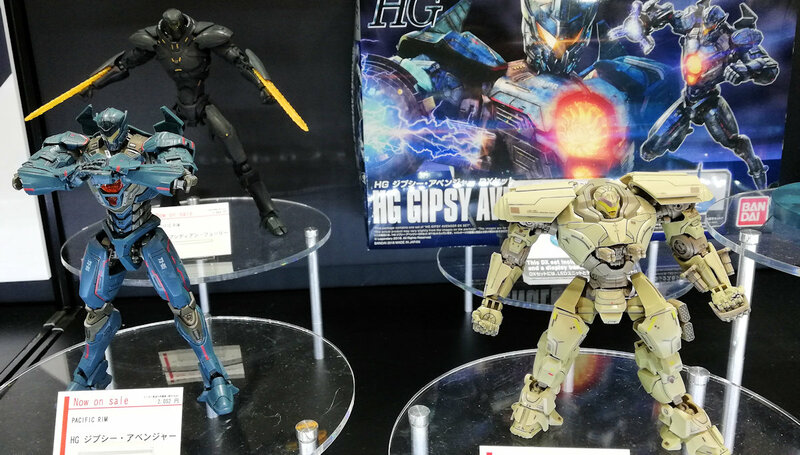 Bandai's booth had a mix of the usual mechas and Star Wars kits with a few Pacific Rim kits in there also. 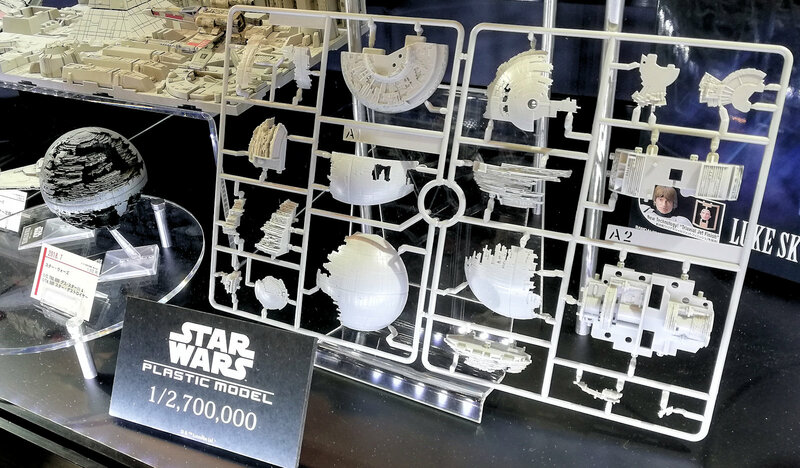 The new B-Wing in 72nd has a lot of people excited - waiting for release will be some tedium! 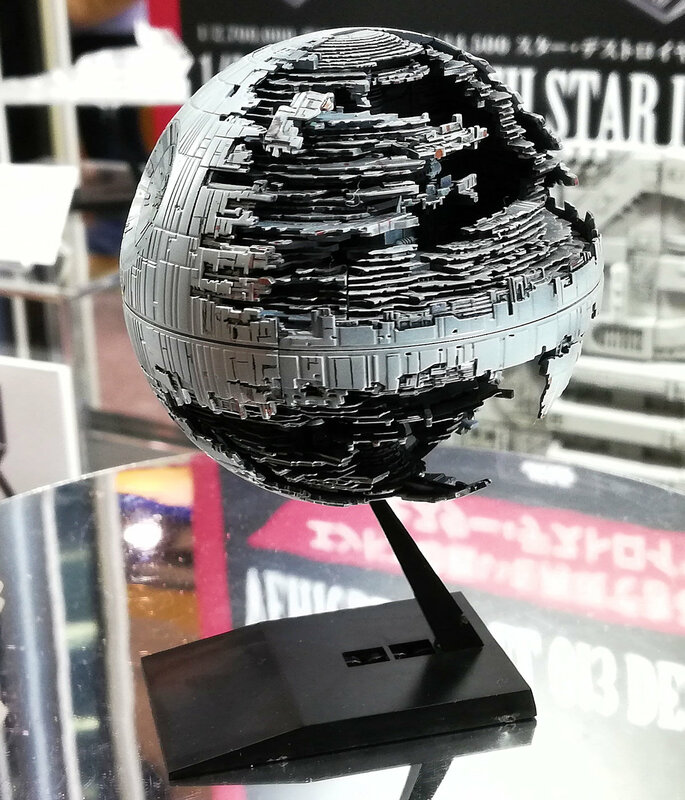 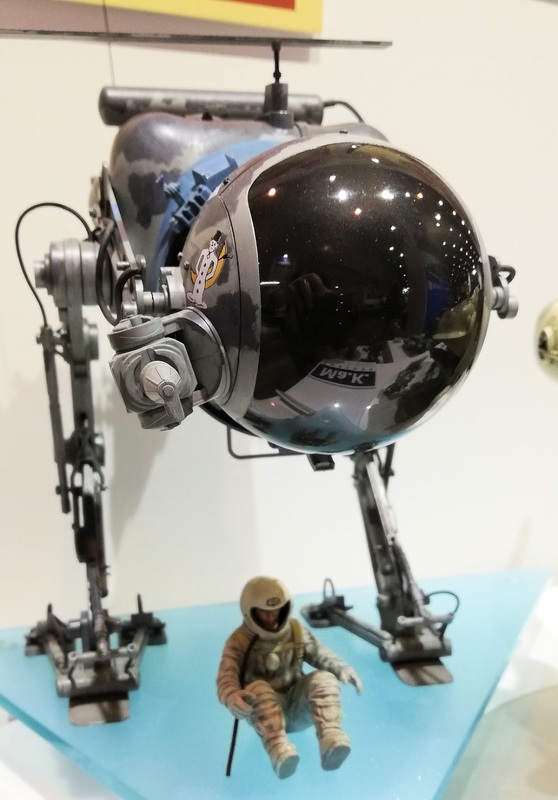 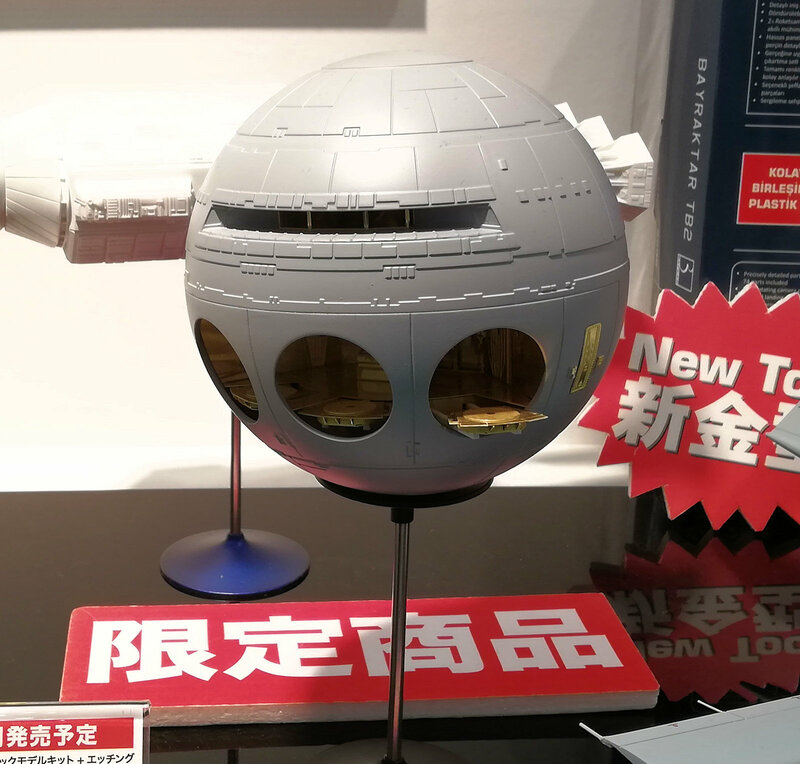 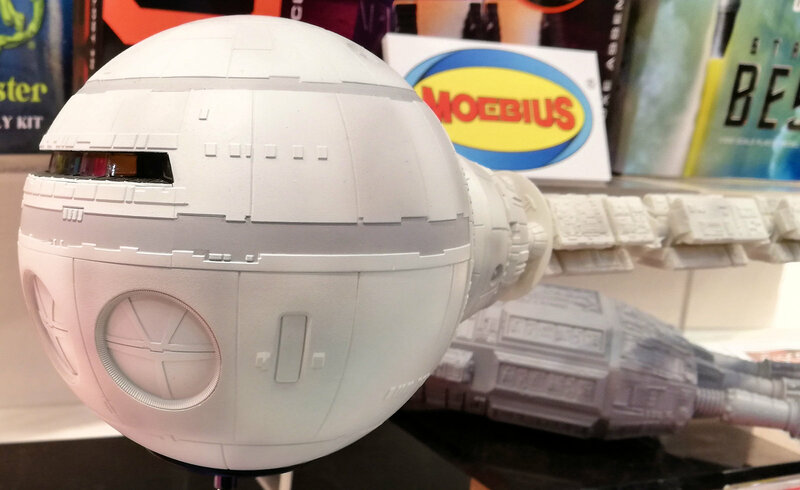 The new Death star in scale was on display with the parts and the kit (it's a little small, a little large to be a moon - it's no moon - it's a space station! 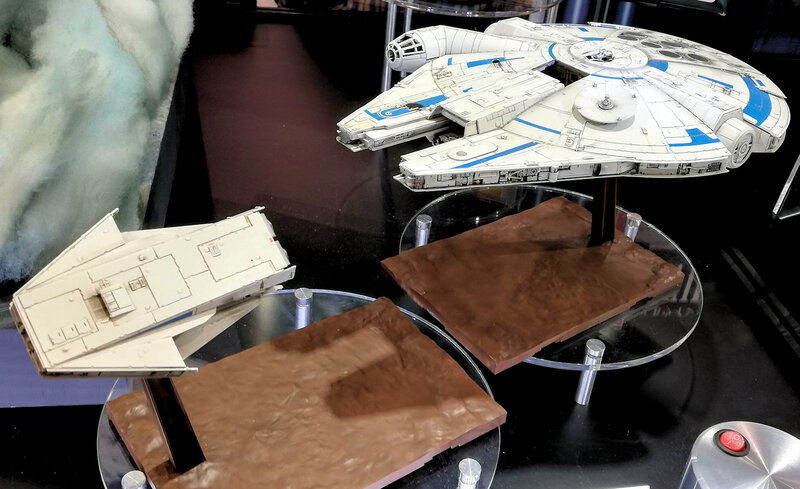 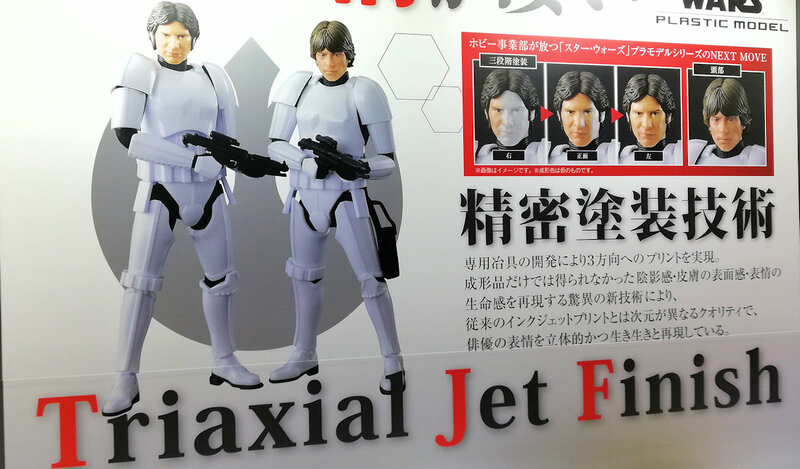 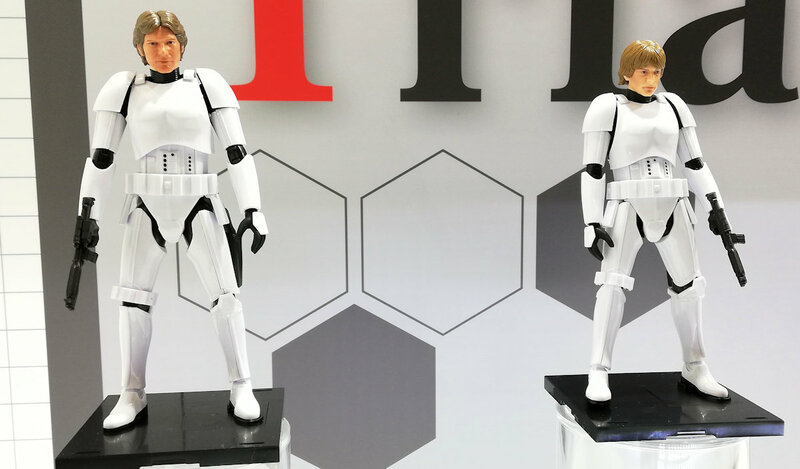 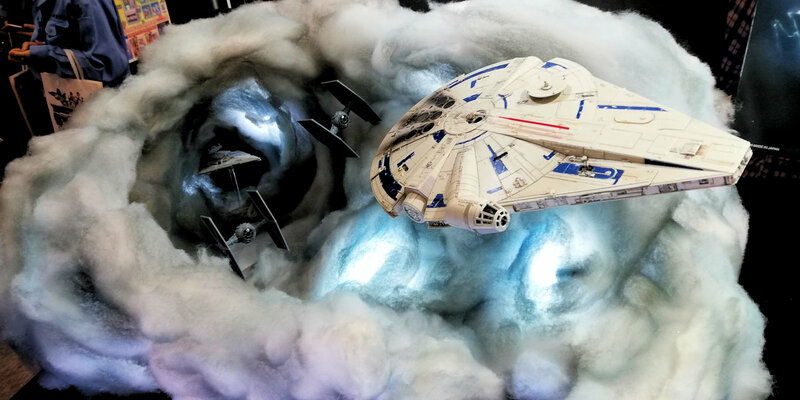 The new Han and Luke Stormtrooper disguise fit with the "Tri-axial Jet Finish" - still has not convinced me, the making of these kits was explained at the show. 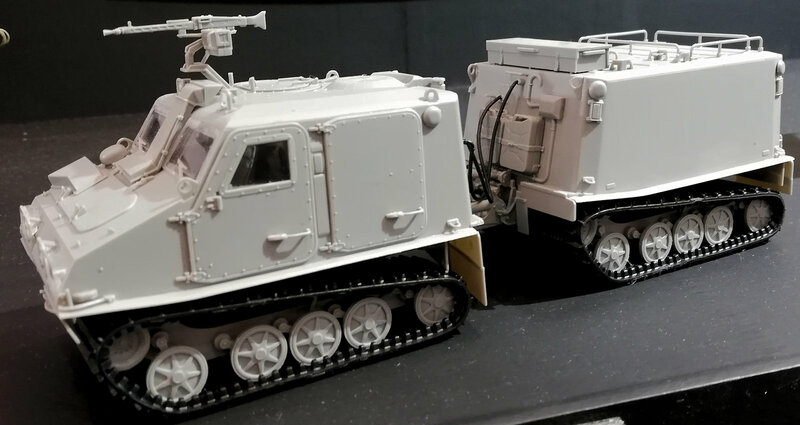 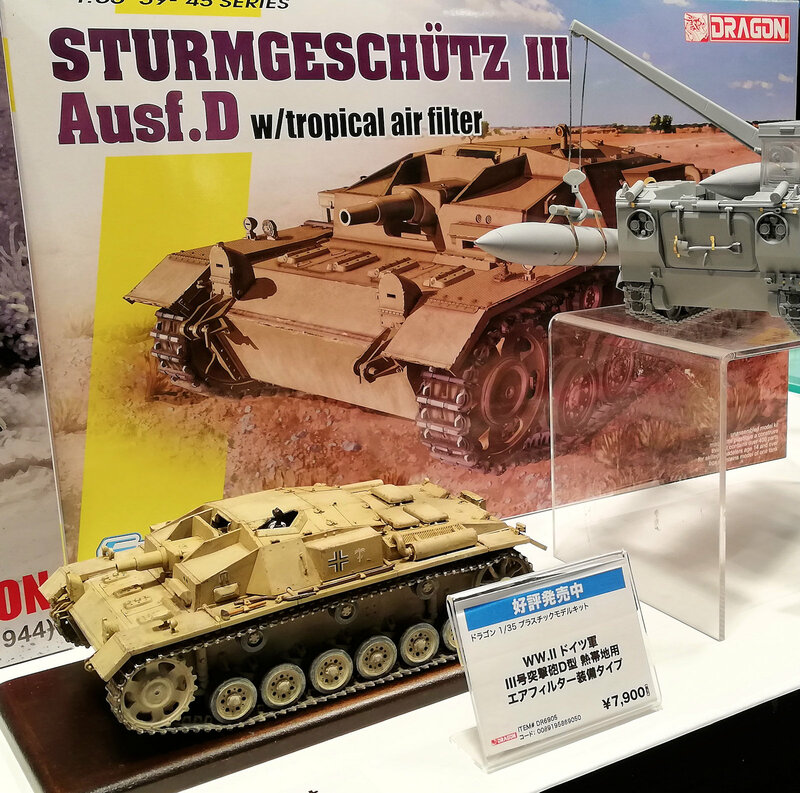 The new and some older kits from Hobbyboss were on display along with the special forces buggy and the armoured goliath of a train in 35th scale. 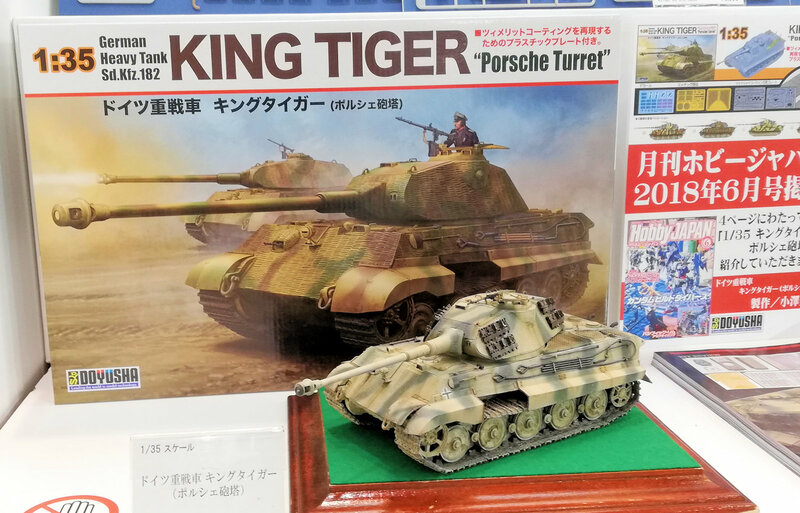 Another King Tiger is what we need! 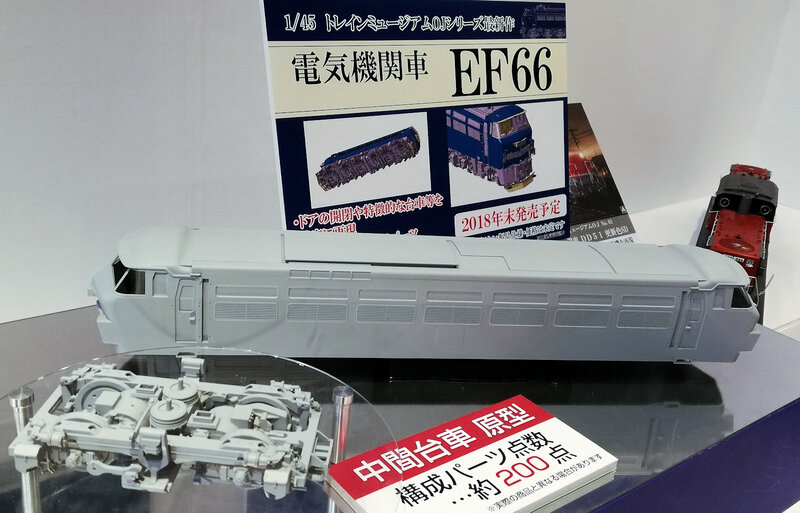 and Doyusha has answered the call in 35th - this is novel! 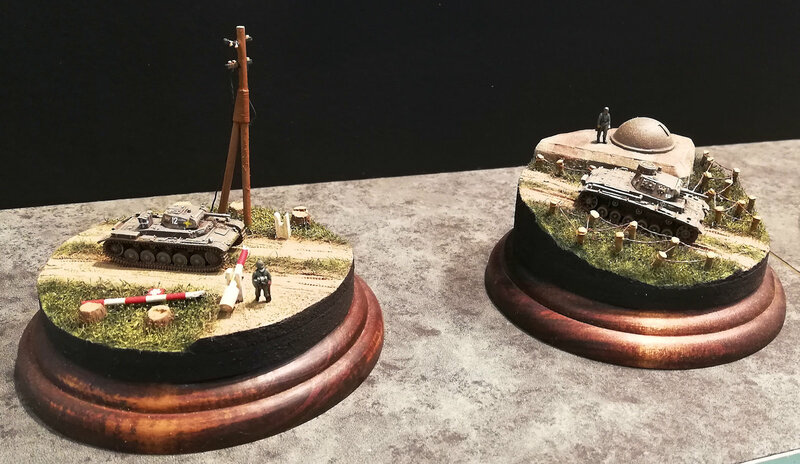 Let's Miniatuart! 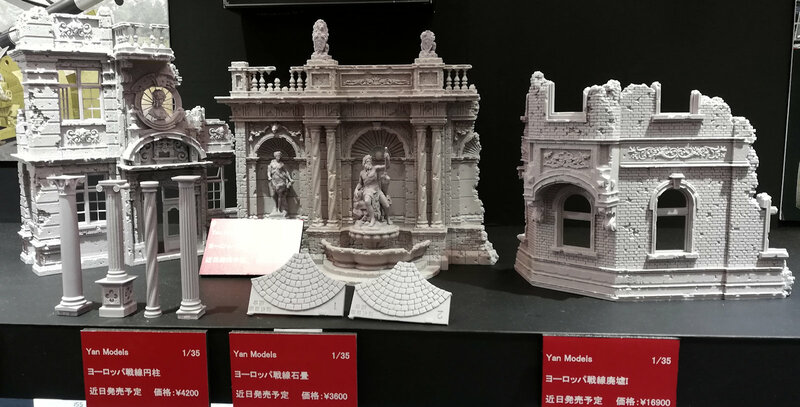 kits from paper were intricate and sure made me smile! 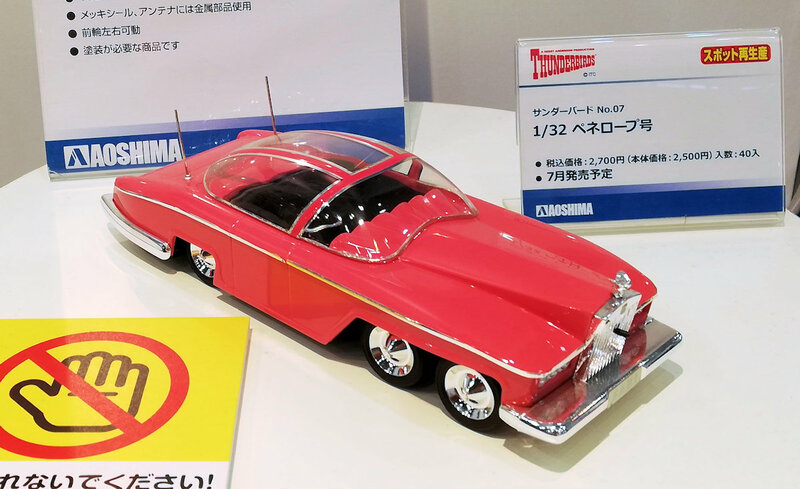 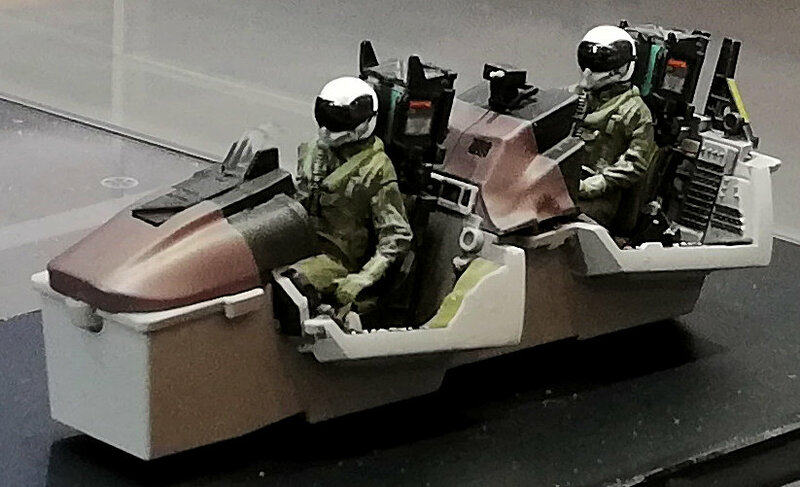 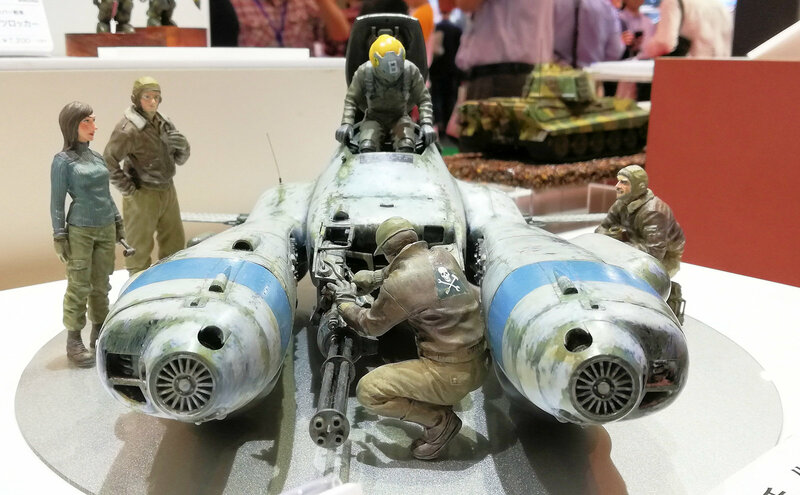 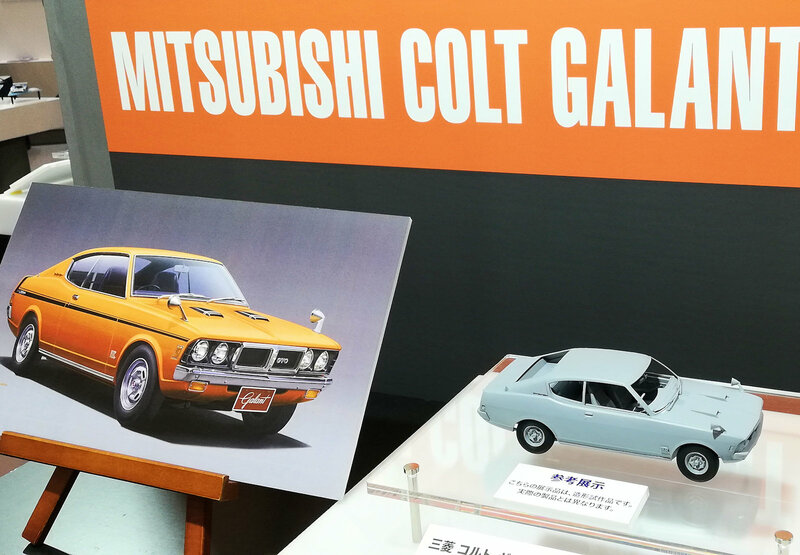 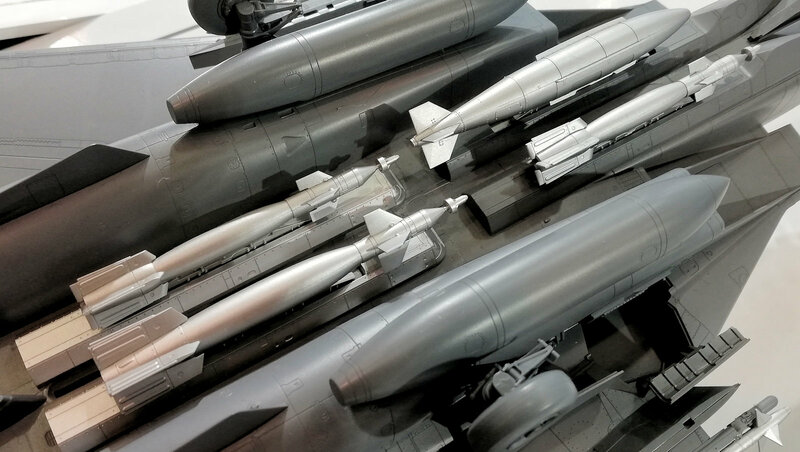 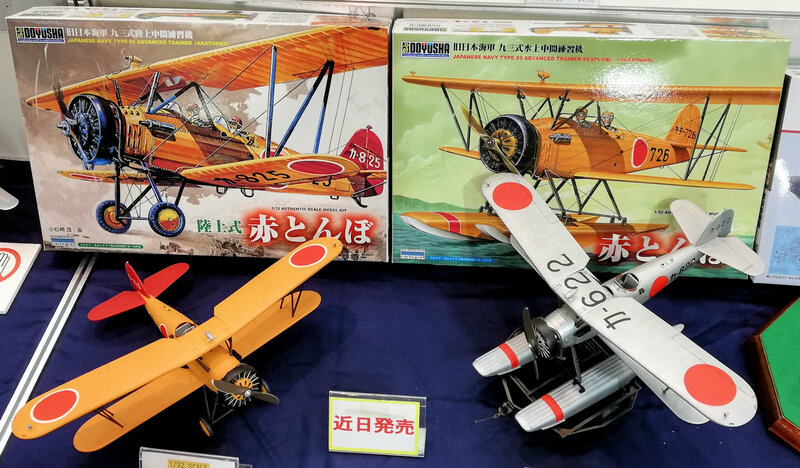 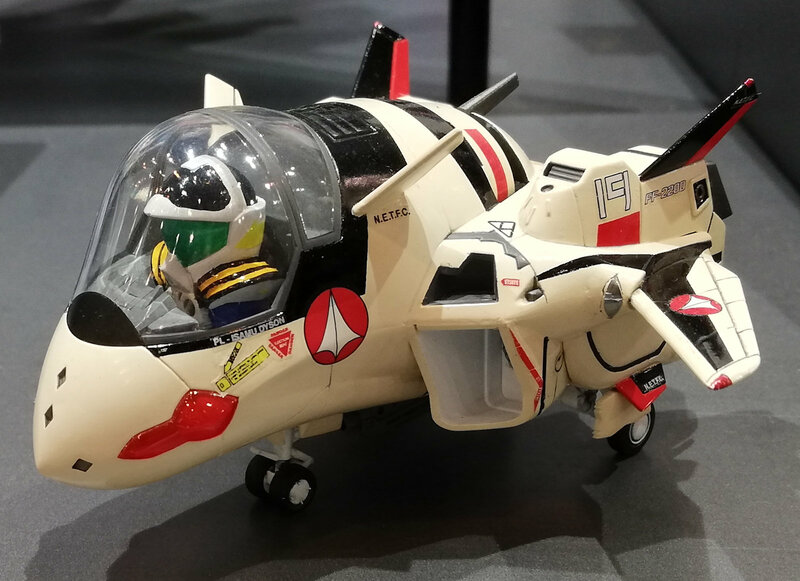 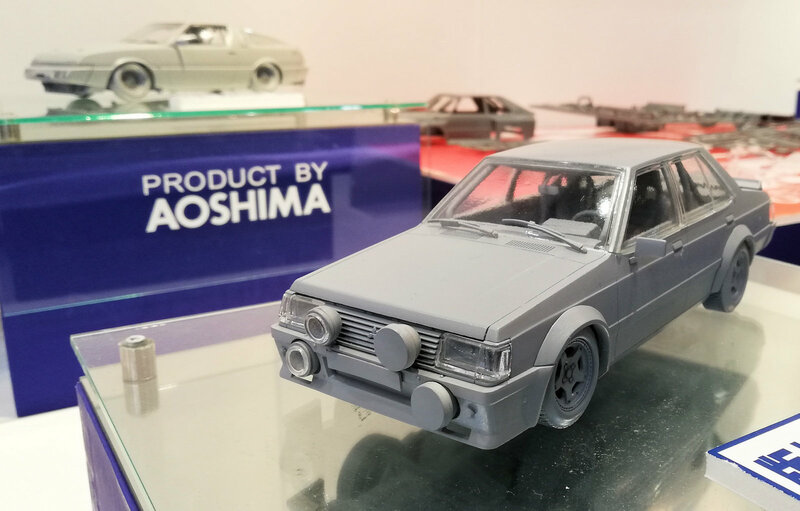 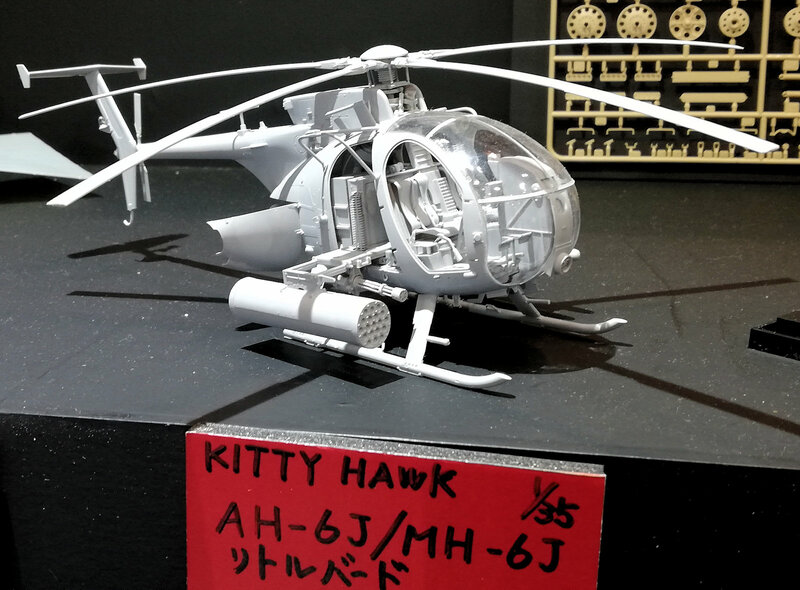 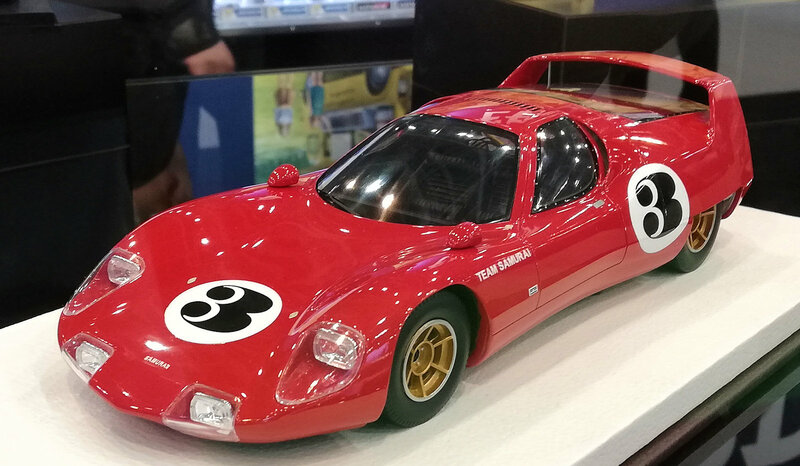 There were a BUNCH of really different kits from Aoshima at the show - along with a 1/1 model of a very shiny racer, there were cars, boats, tanks aircraft, Thunderbirds and Mecha illas on hand for the fans. 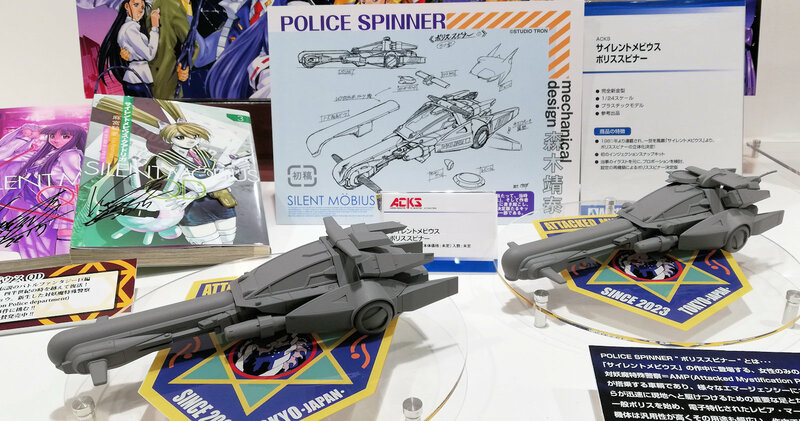 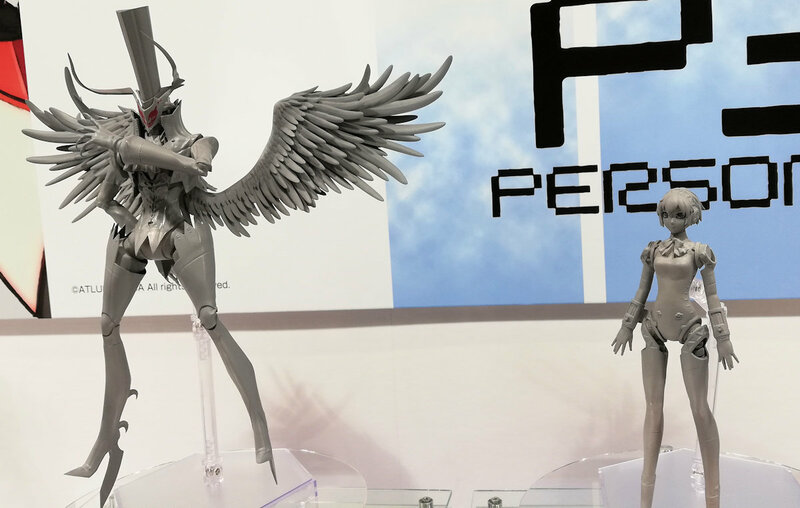 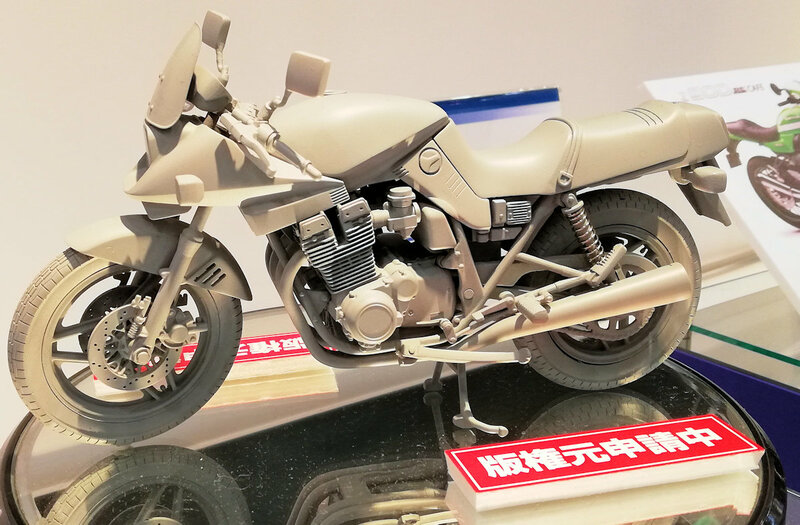 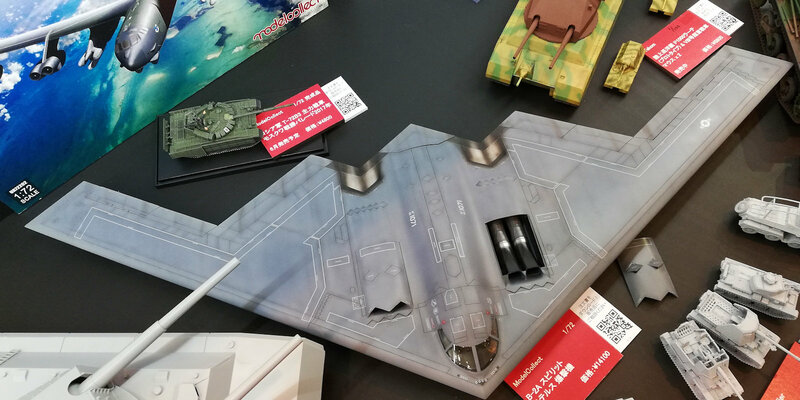 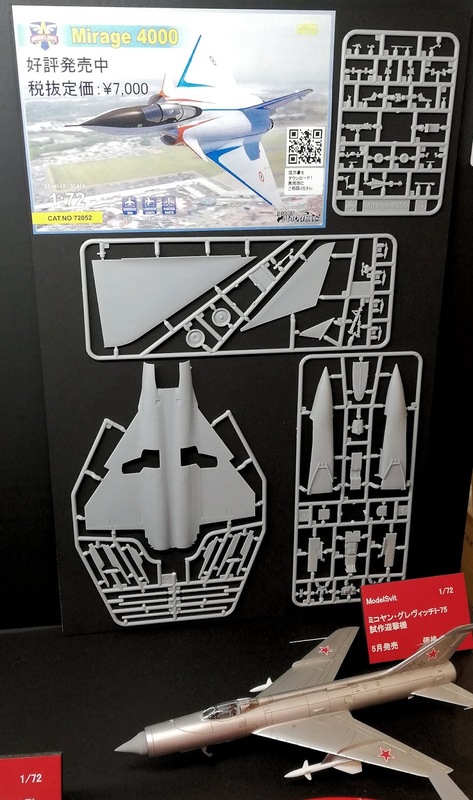 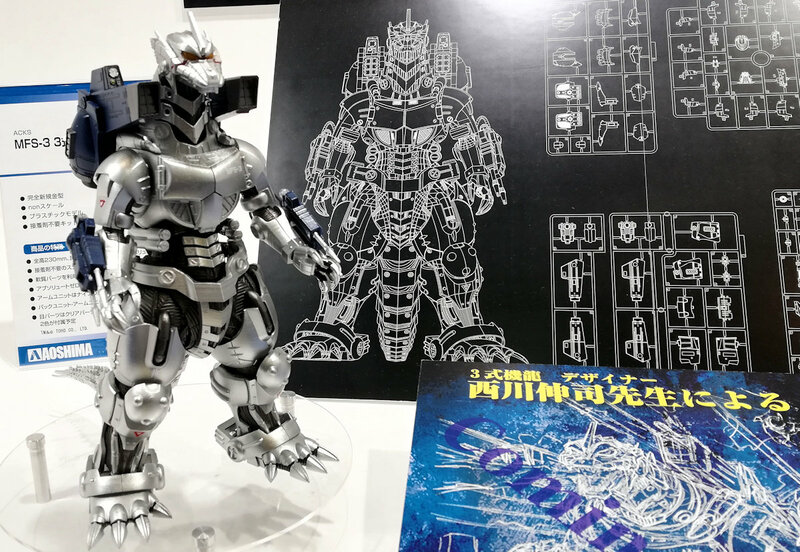 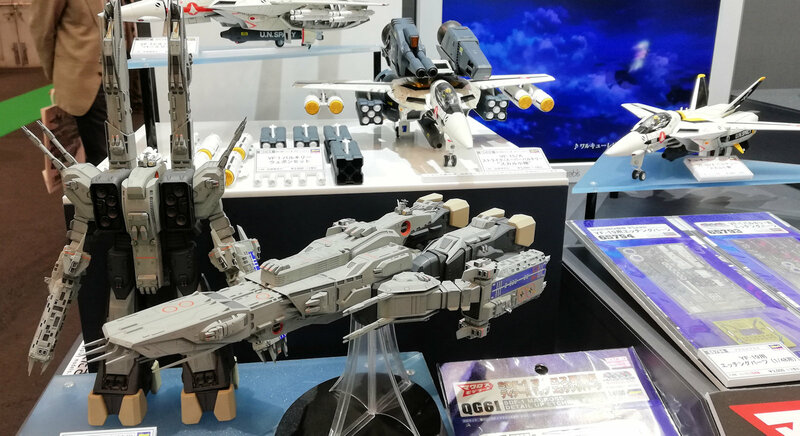 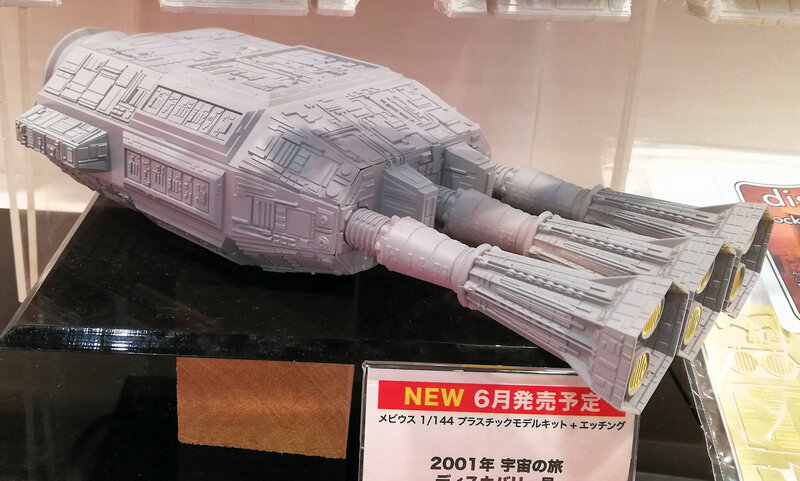 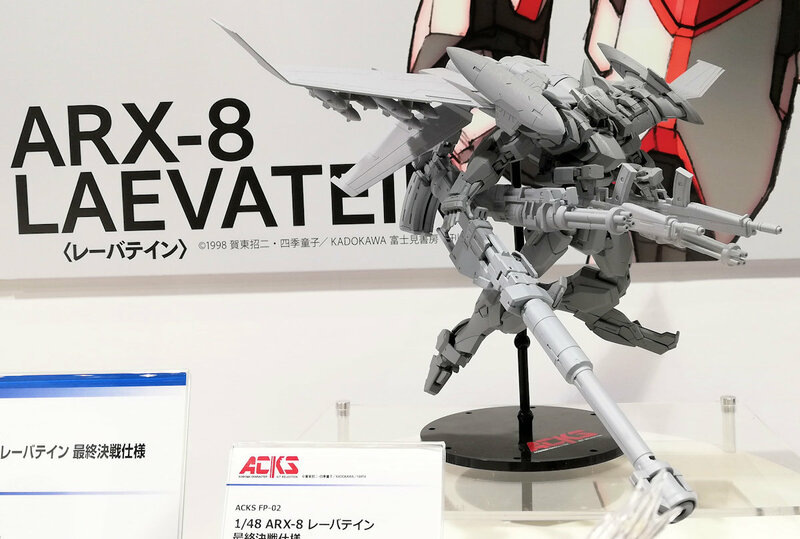 We saw the non-scale Variable Fighter Girls series of snap-fit plastic kitsm the MFS-3 Type 3 Kiryu, from the 2002 film "Godzilla X Mechagodzilla," was there also. 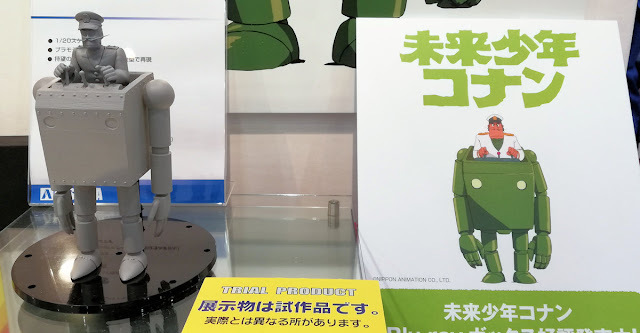 The 1/20-scale kit of the Robonoid, from the seminal 1978 anime series "Future Boy Conan." 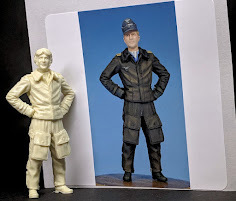 Planned to be posable upon completion, with extra hands and of course Captain Dyce in the pilot seat. 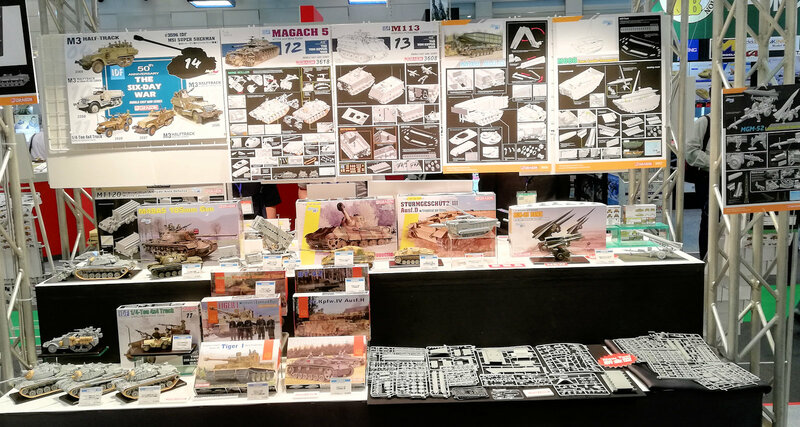 Great looking kits from all genres were in this large stand. 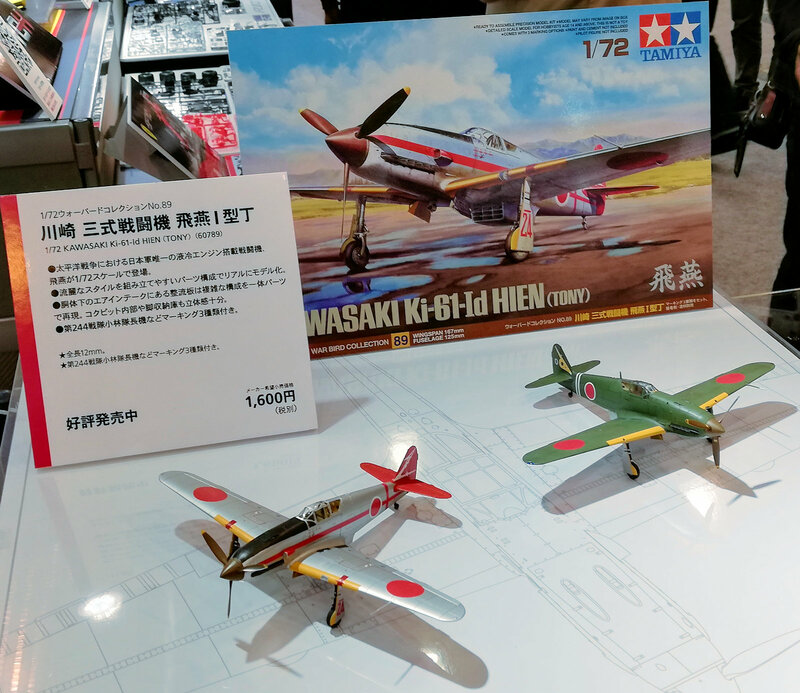 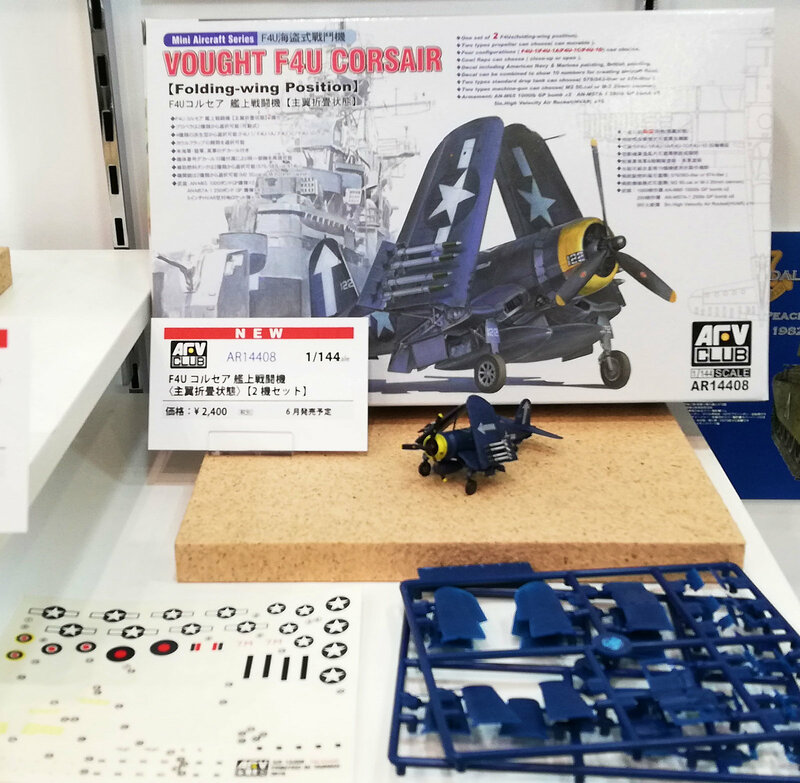 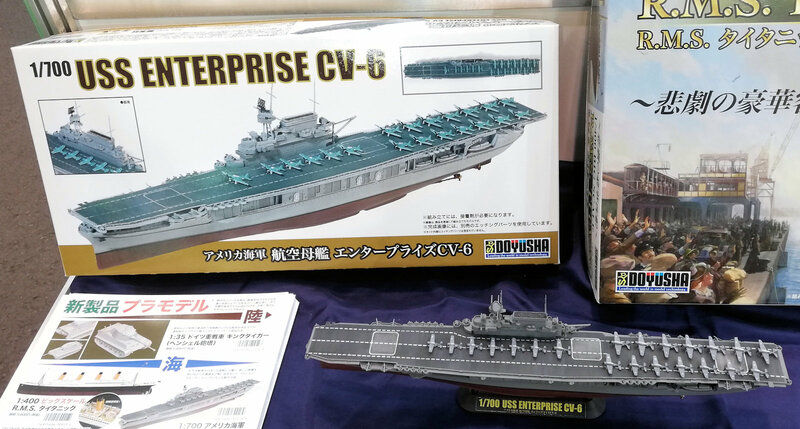 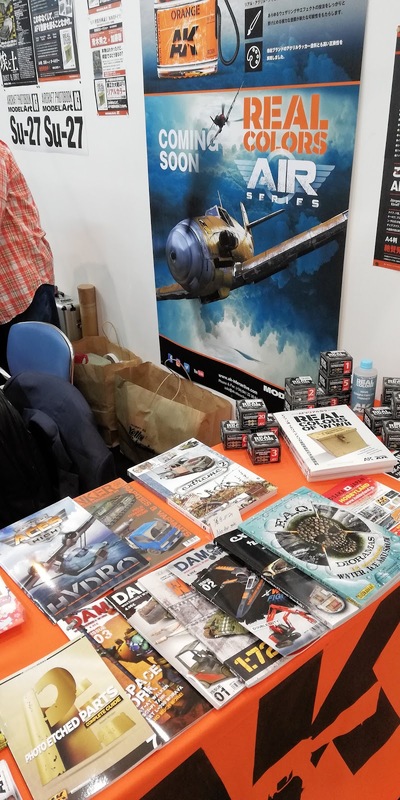 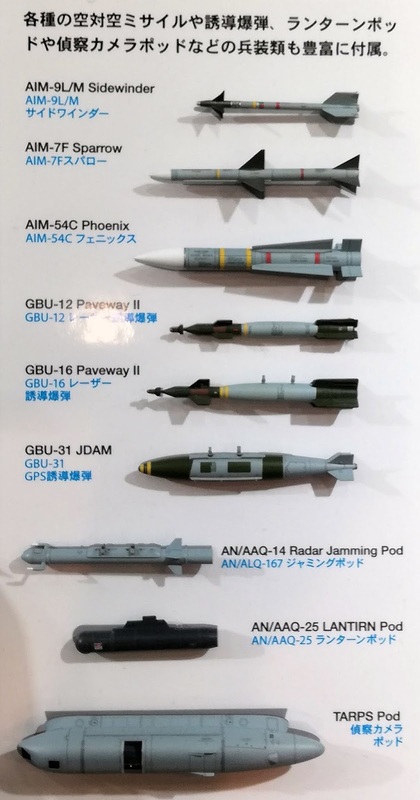 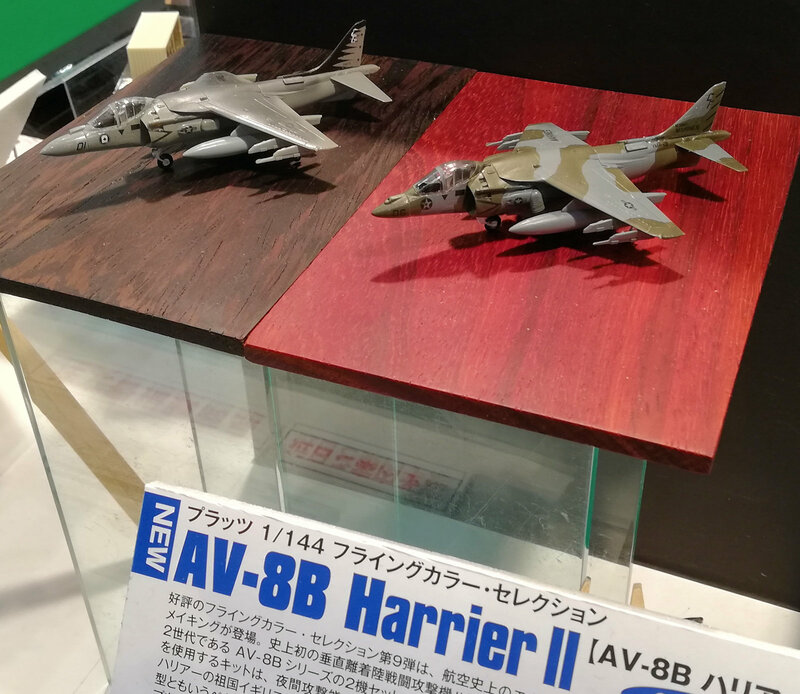 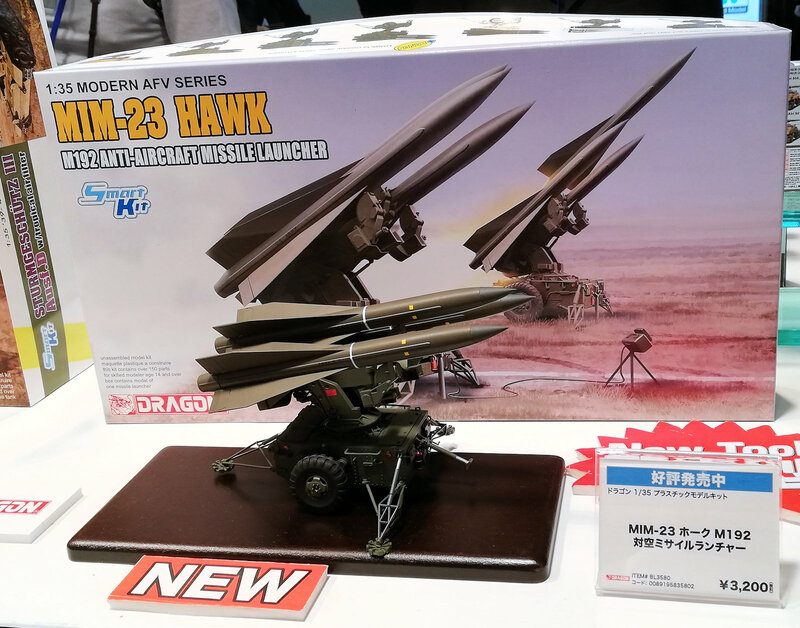 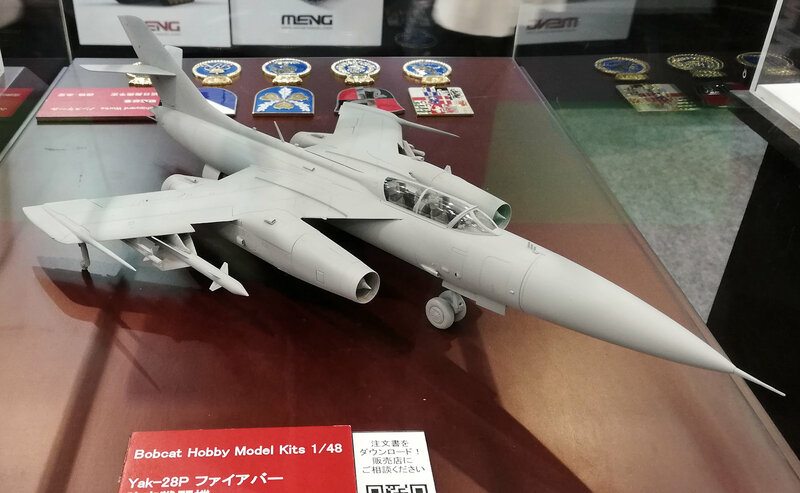 Hasegawa as usual had several kits of their own and ICM and Revell there who they distribute in Japan. 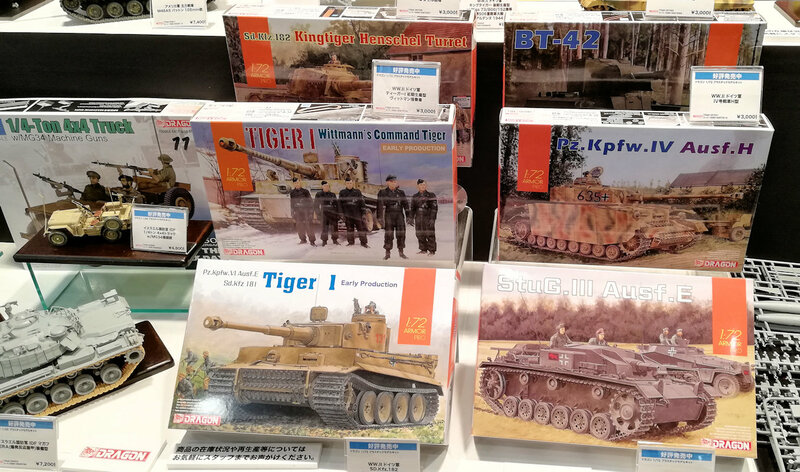 Hasegawa do make a lot of different kits in scales and genres all over the shop. 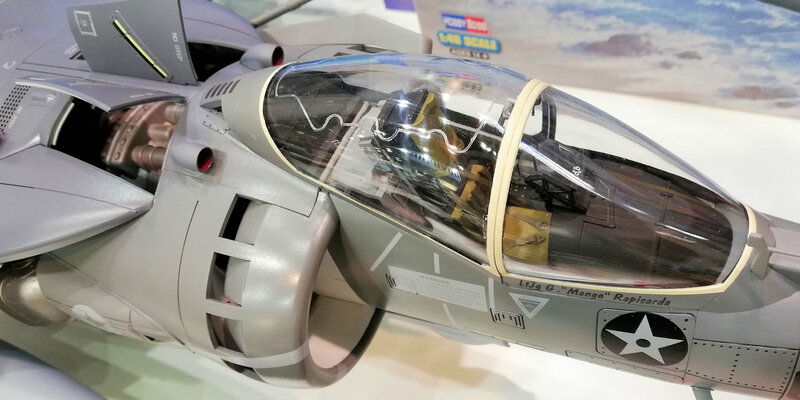 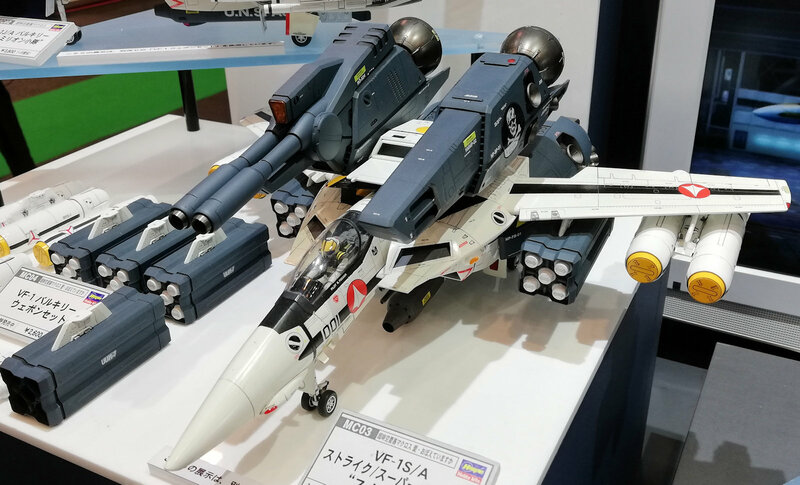 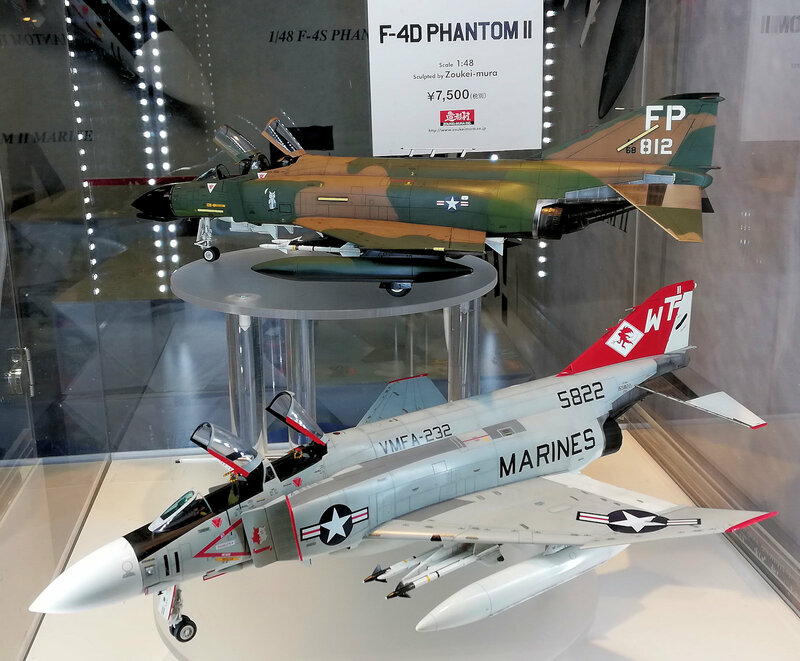 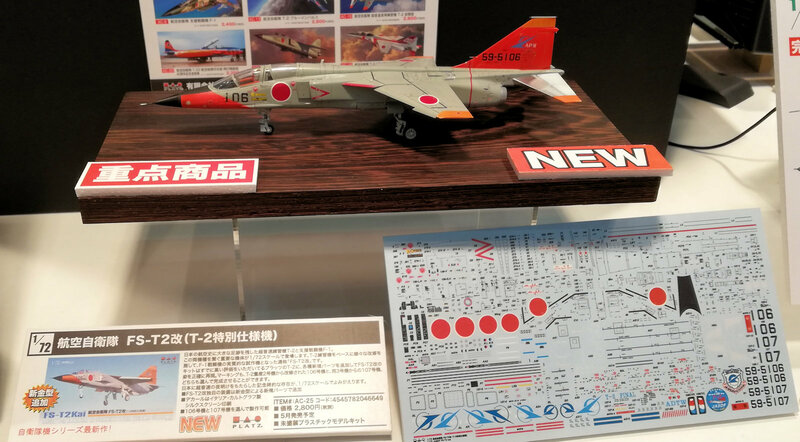 New Macross kits were a stand out on the Hasegawa stand, with the 1/72nd scale VF-31F from "Macross Delta the Movie," comes with the Lildraken equipment and parts to build the wings and tail in different positions. 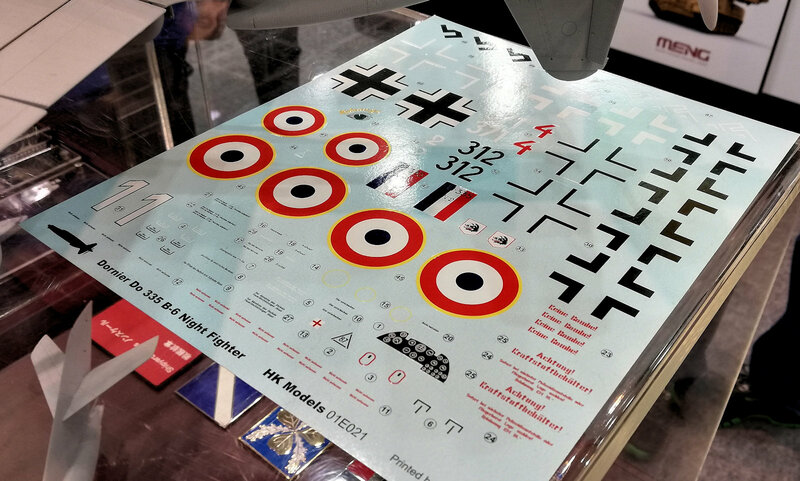 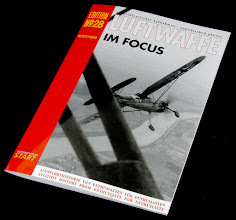 The kit includes decals for two versions: Hayate Immelman's ride, or the one flown by Messer Ihlefeld. 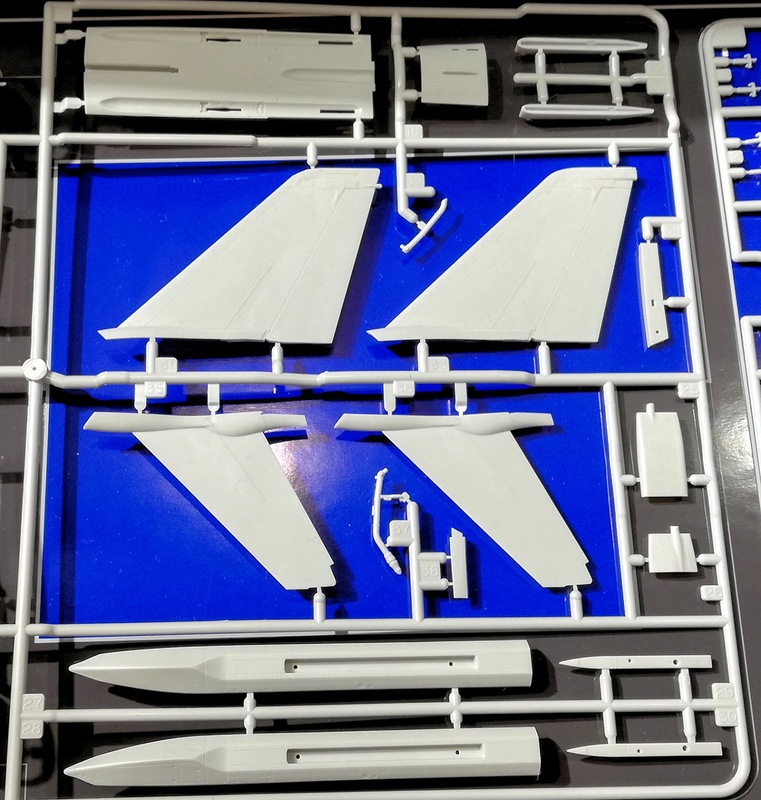 They also previewed the Sv-262Ba Draken III Mirage with Lilldraken were all on display. 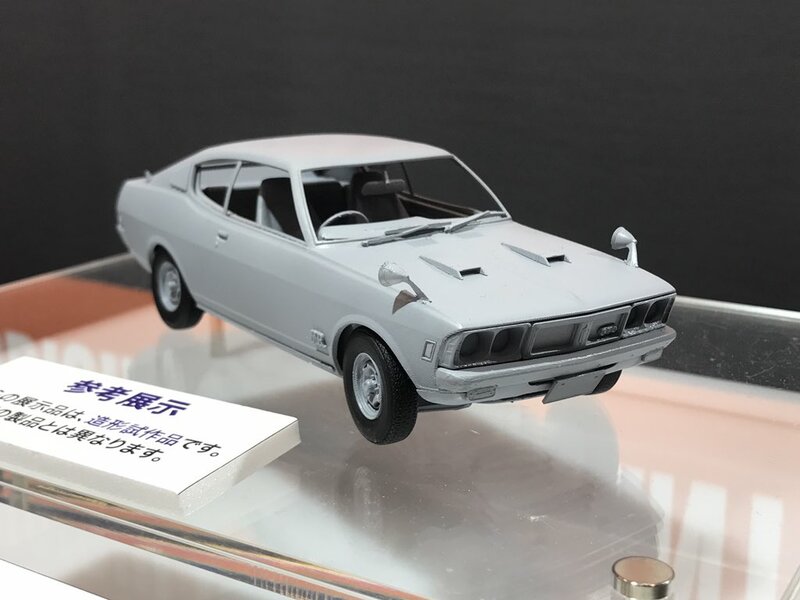 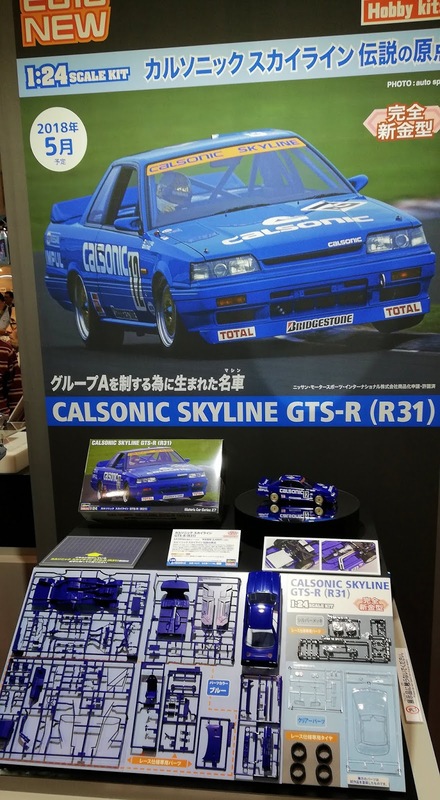 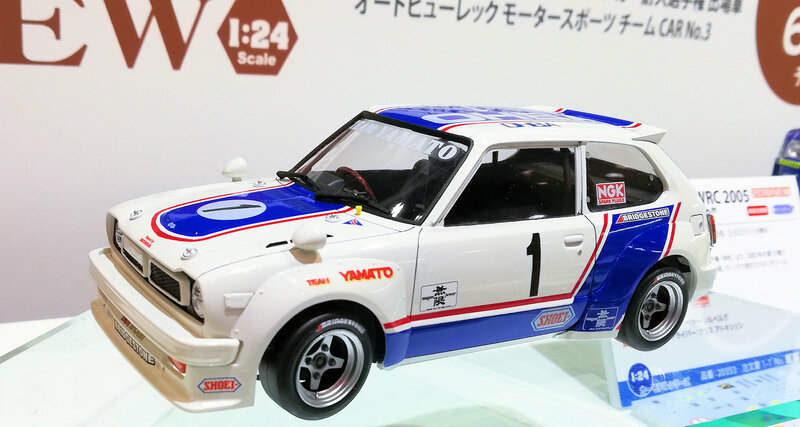 The new 1/24 Calsonic Skyline GTS-R (R31) from the 1989 All Japan Touring Car Championship Group A division and driven by Hoshino Kazuyoshi and Kitano Yuan was a attention getter. 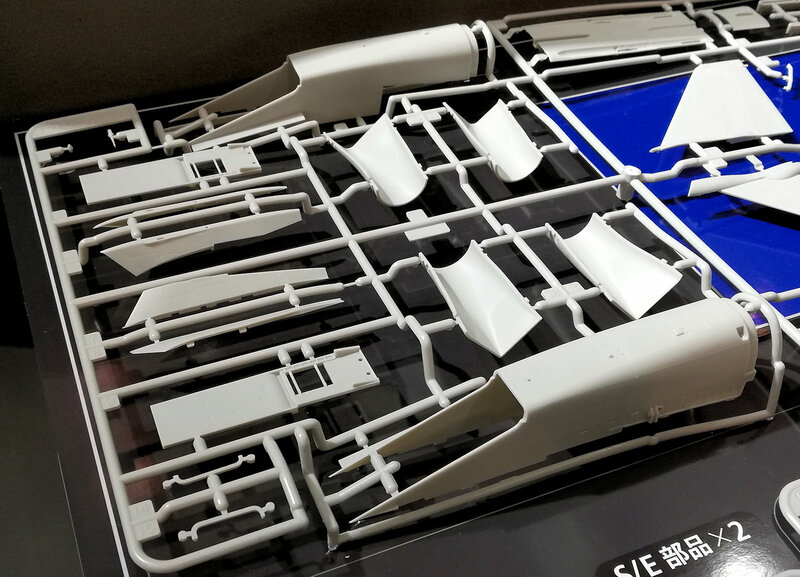 This kit is based on thorough examinations of the actual vehicle. 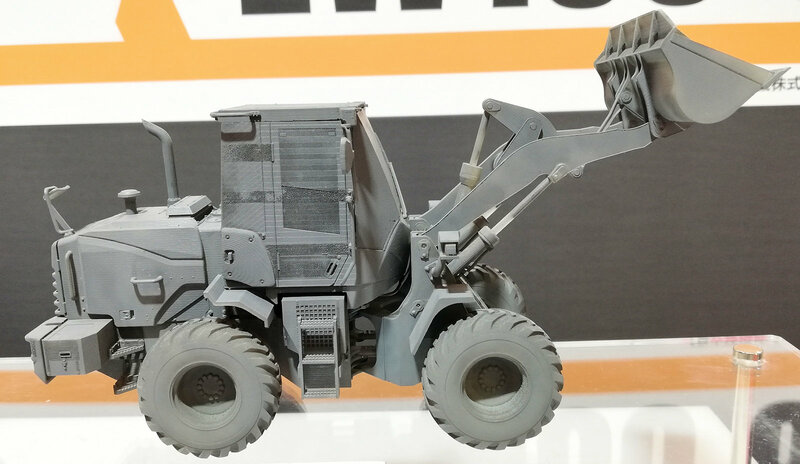 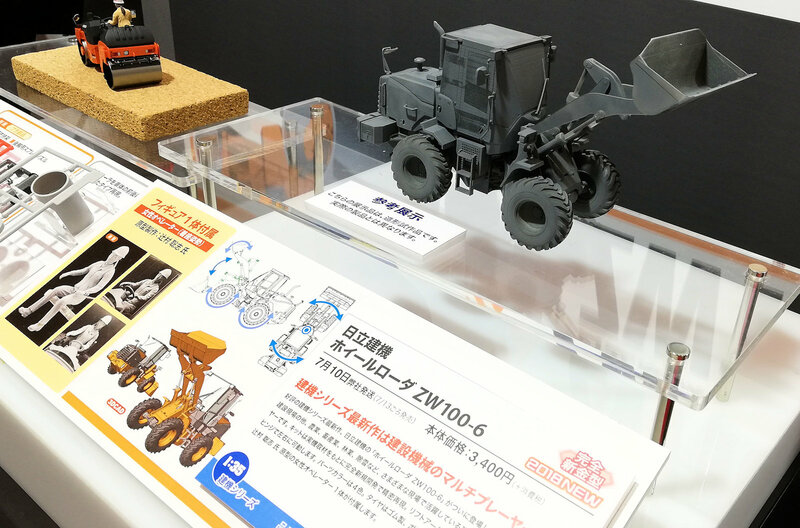 The Wheel Loader ZW100-6 from Hitachi from Hasegawa is new mold based on close inspection of the actual machine, and features a vertically moving lift arm and rotating tires. 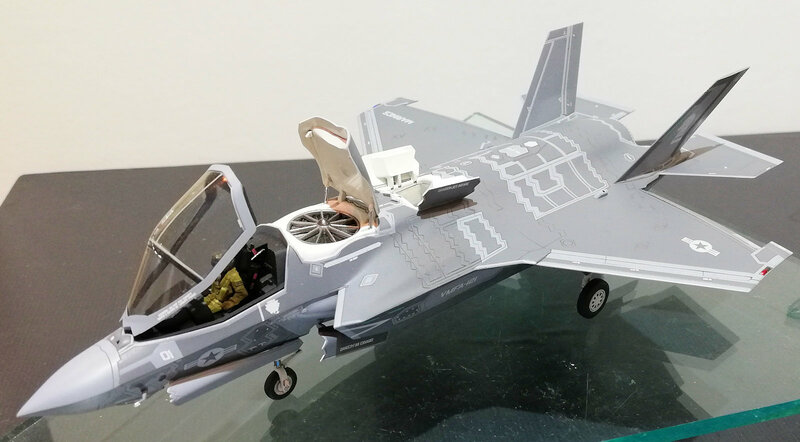 The 72nd scale F-35 Lightning II was there built up in regular and VTOL configurations. 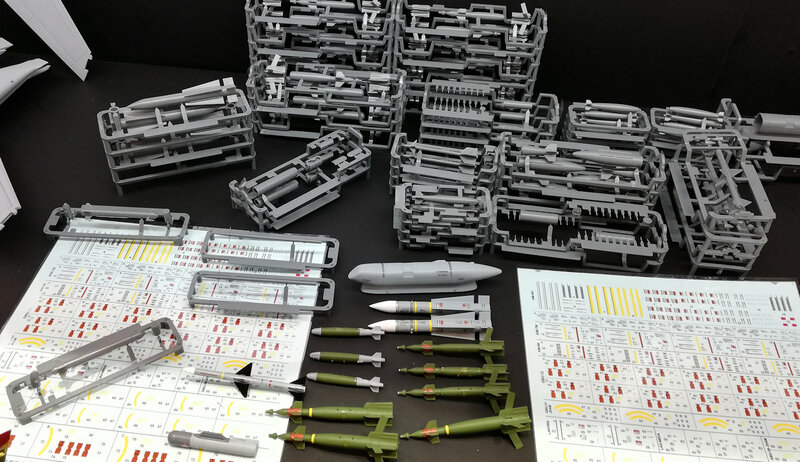 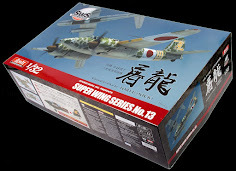 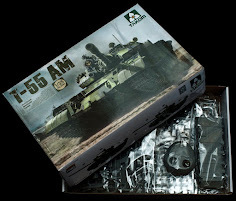 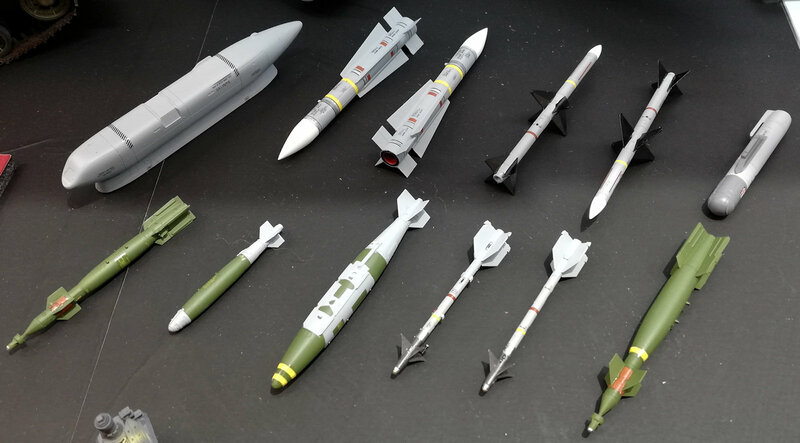 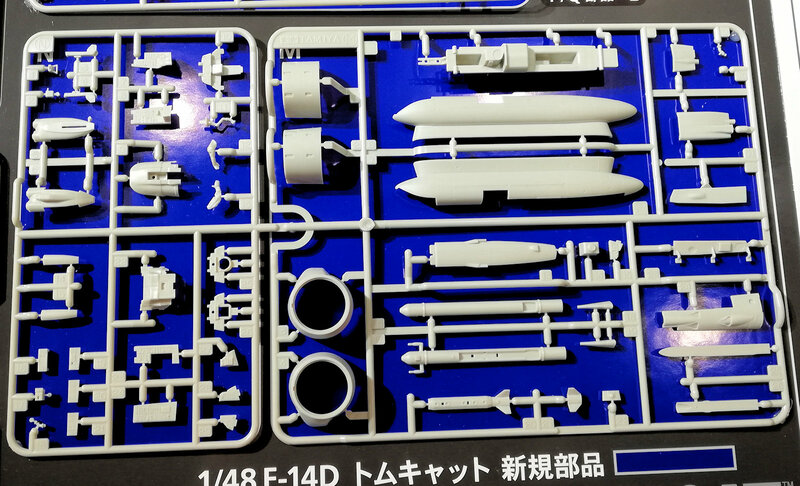 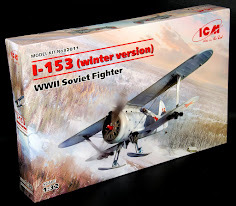 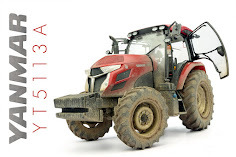 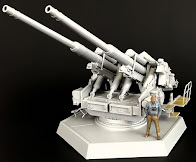 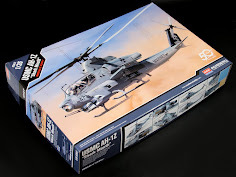 All of those other great little kits from Hasegawa - even some new ones in there! 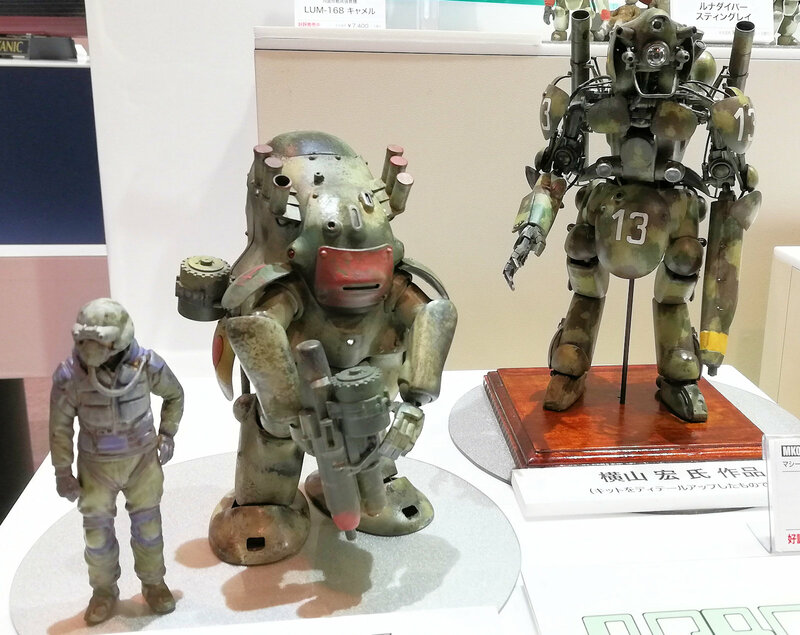 The Maschinen Krieger kits that I fell in love with after my last trip to Shizuoka are there in strength from Hasegawa. 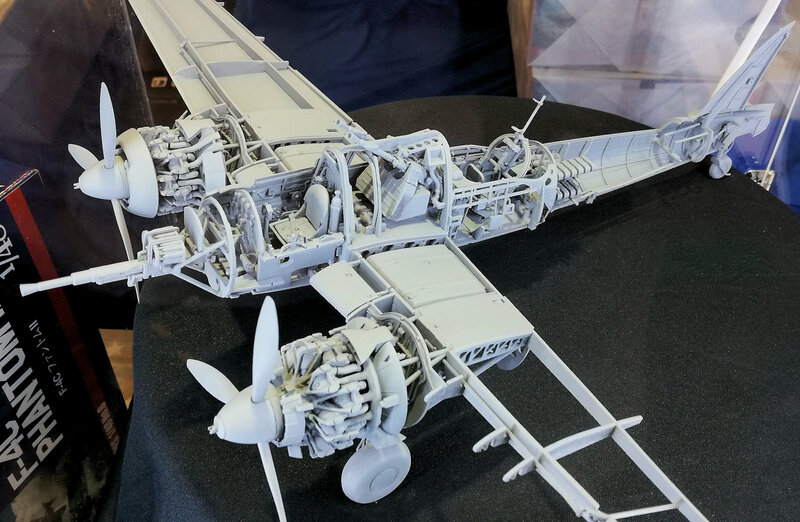 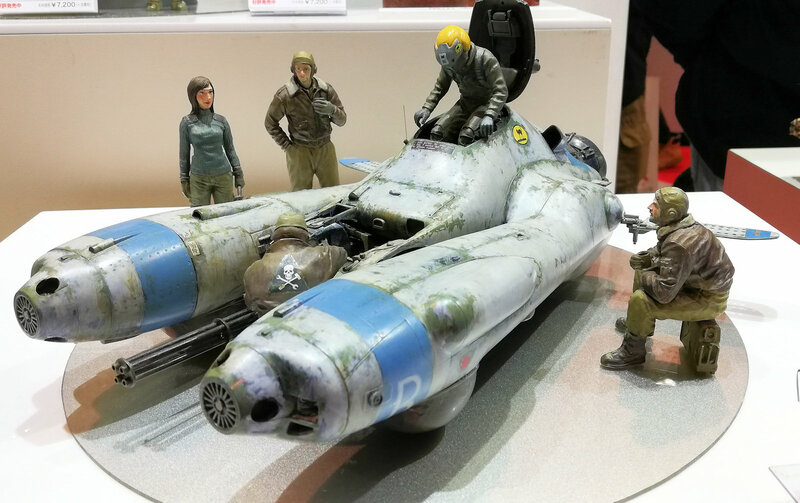 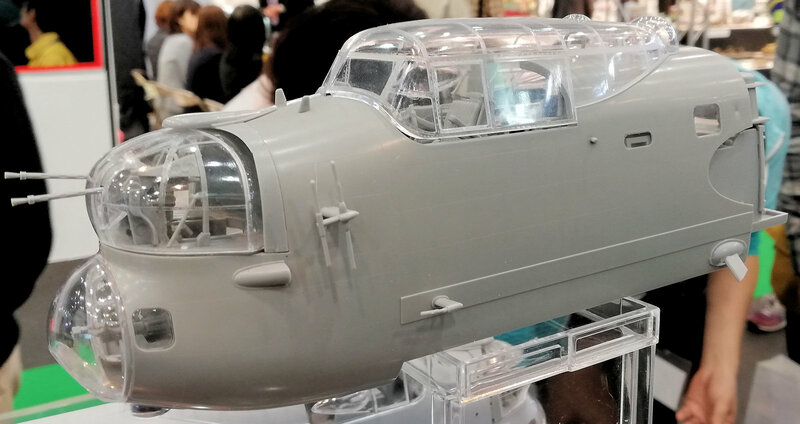 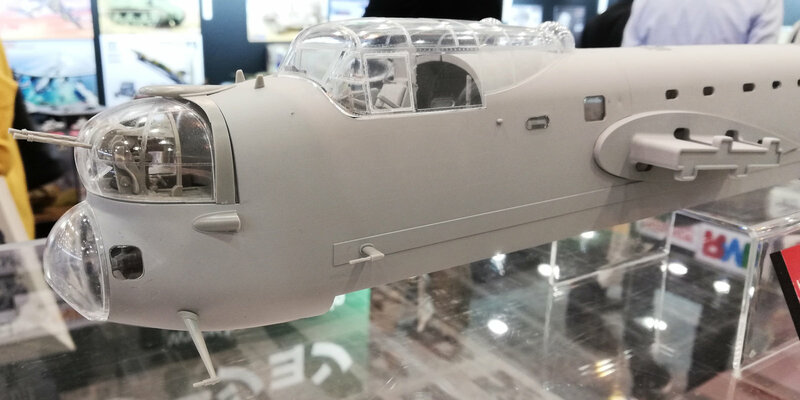 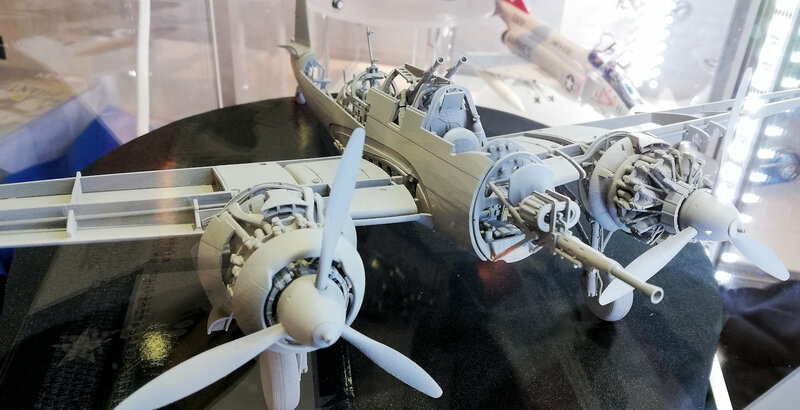 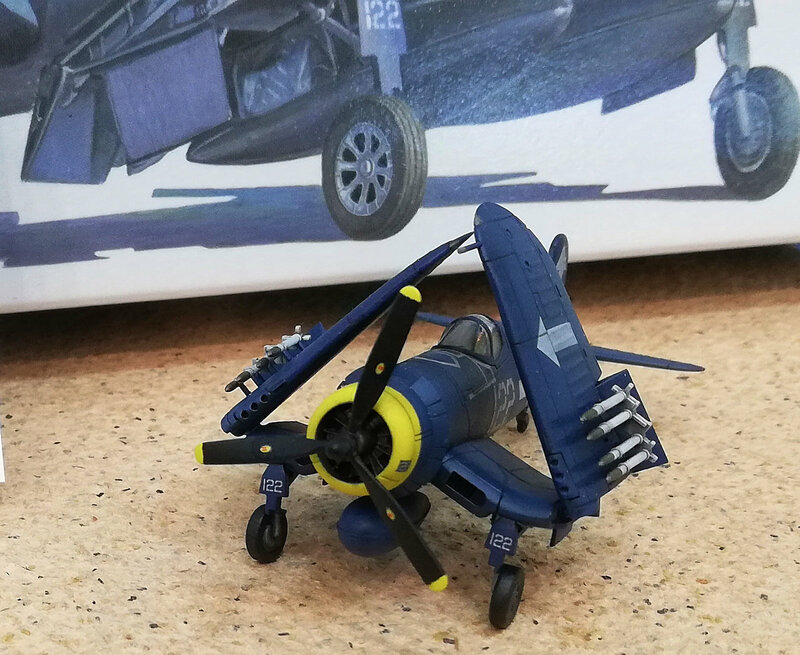 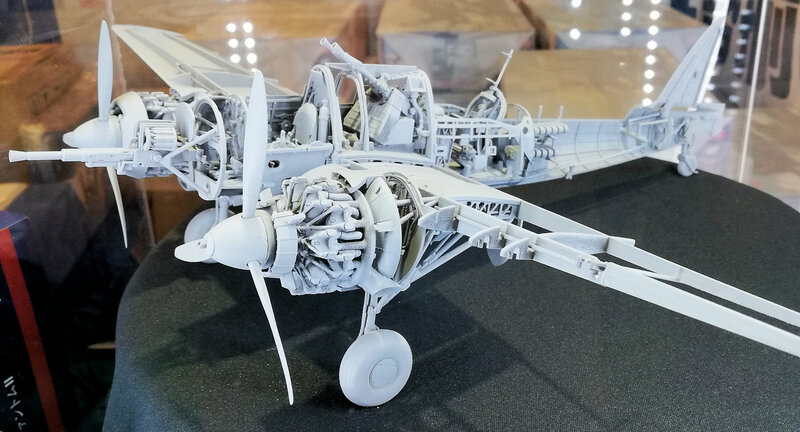 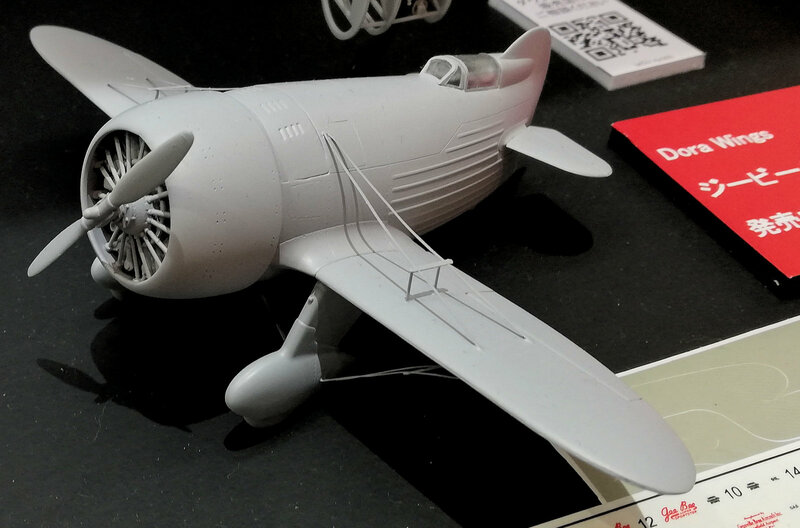 As well as this the prototype in 3nd scale of the Kawasaki Ki-45 - this is looking so very nicely detailed it is almost hard to contemplate the finished product. 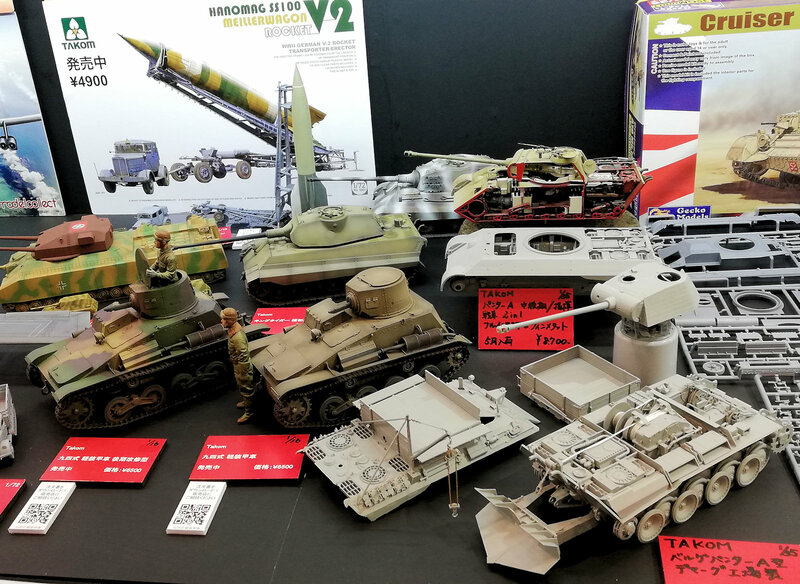 The GSI Creos stand had several kits from MiniArt, AFV Club, Meng and Zvezda are all on display in there. 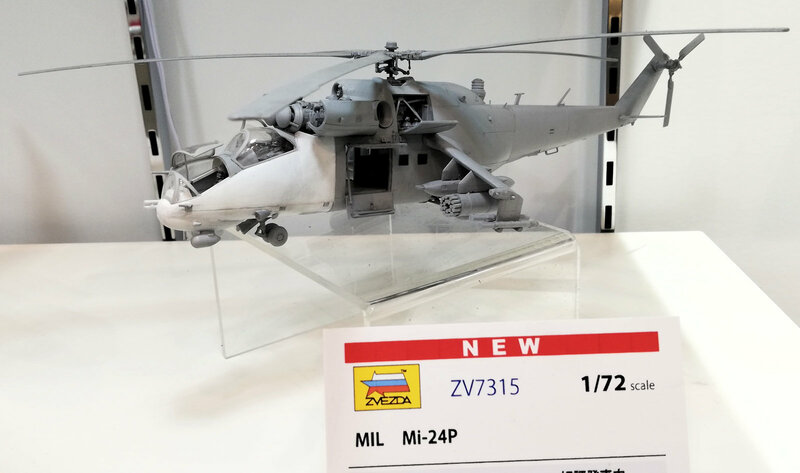 The Ka-14 in 72nd scale was the centerpiece of Finemolds display at the show. 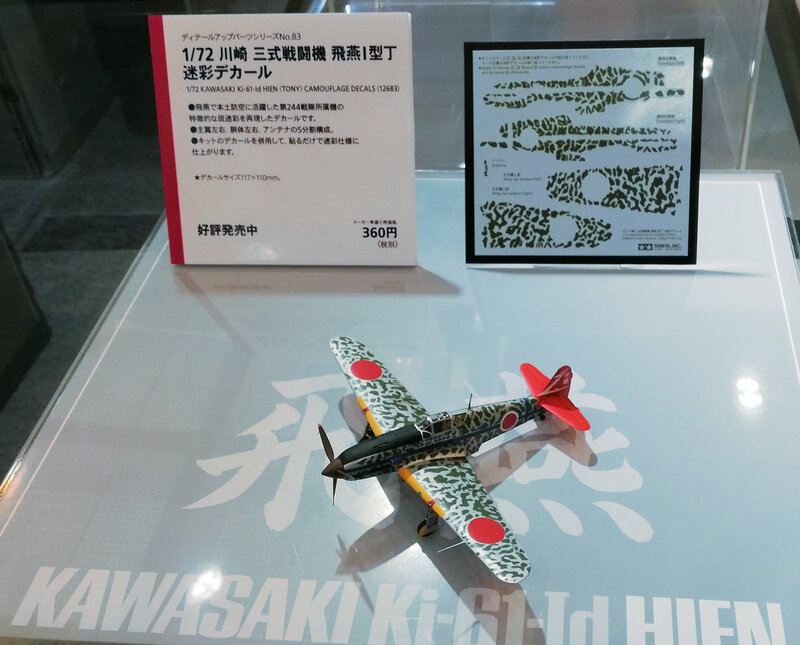 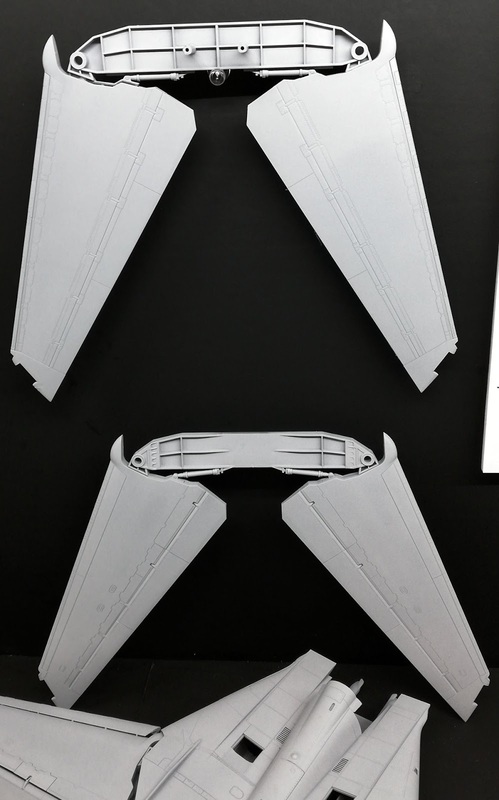 The aircraft was designed by the legendary Jiro Horikoshi, and while prototype Ka-14s featured a few different designs, this kit from Fine Molds reproduces the type with an inverted gull wing, and a distinctive cowling for the first time this modification of the first prototype has been released as a 1/72 scale kit. 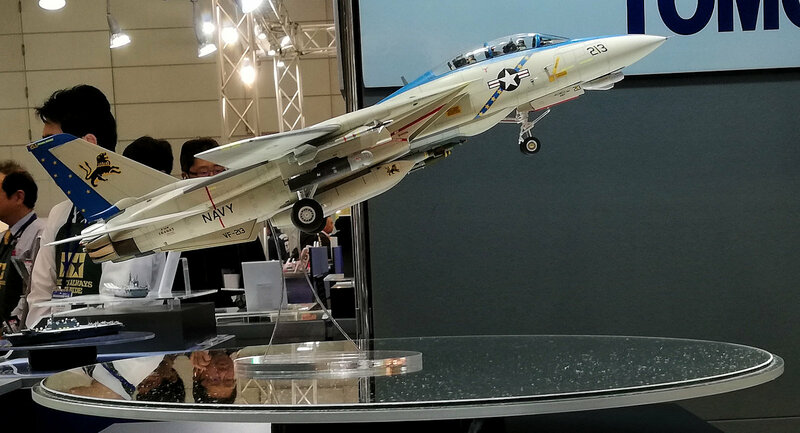 The recently released 1/72 USN F-14A Tomcat "USS Independence 1995," was on the tables also. 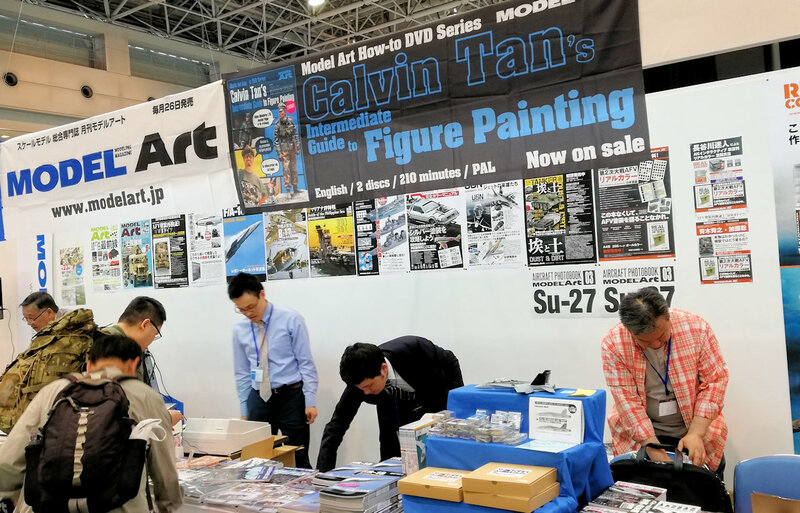 Calvin Tan was signing and demonstrating his latest figure painting DVD's and AK Interactive had all of their wares on display at the Model art stand just across from the Tamiya compound. 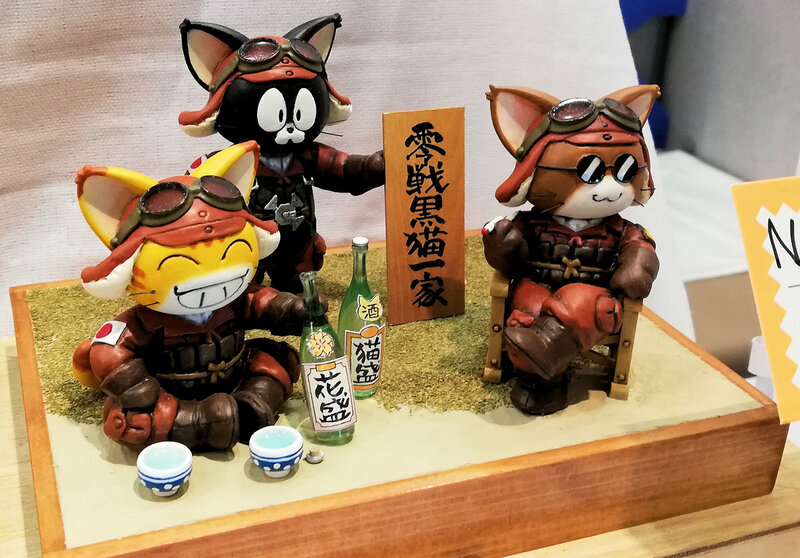 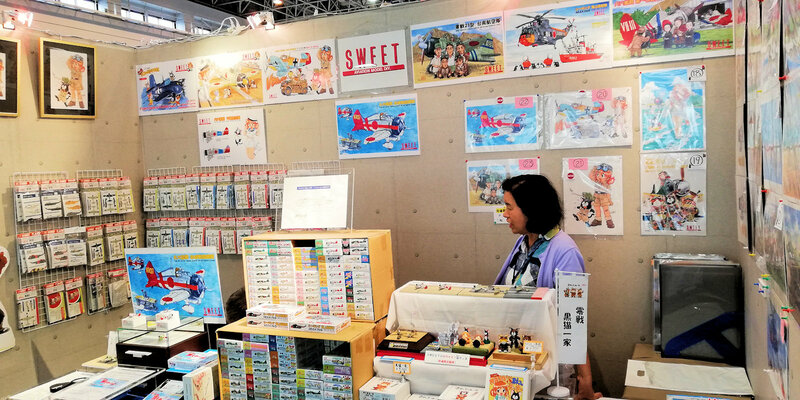 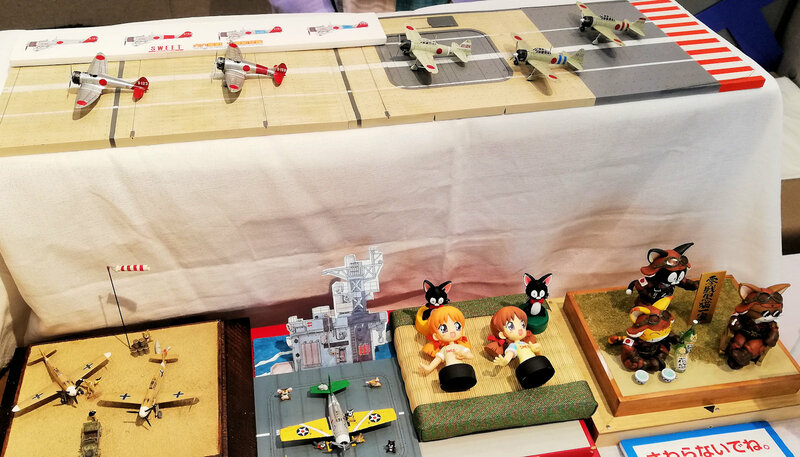 Japanese company "Sweet Model" had on display all of their great little plane and animal mixed kits - great, cute artwork and lots of pleasantness was on display - really lovely people there! 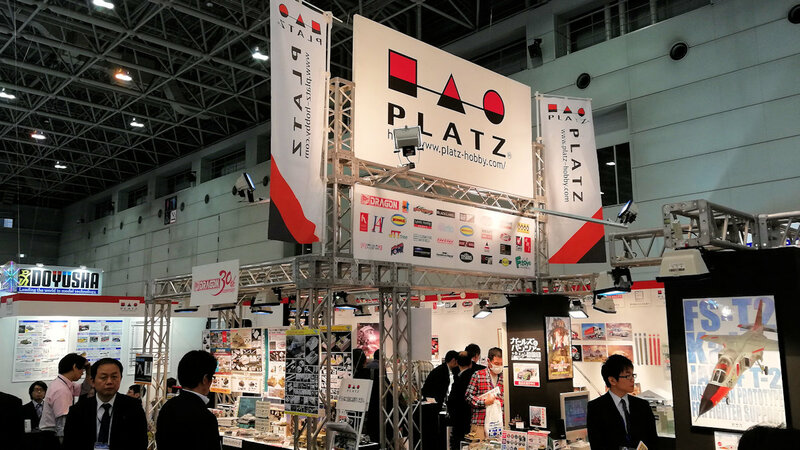 Platz act as distributors for many other companies so not only their own kits, but plenty of other model companies were on display also. 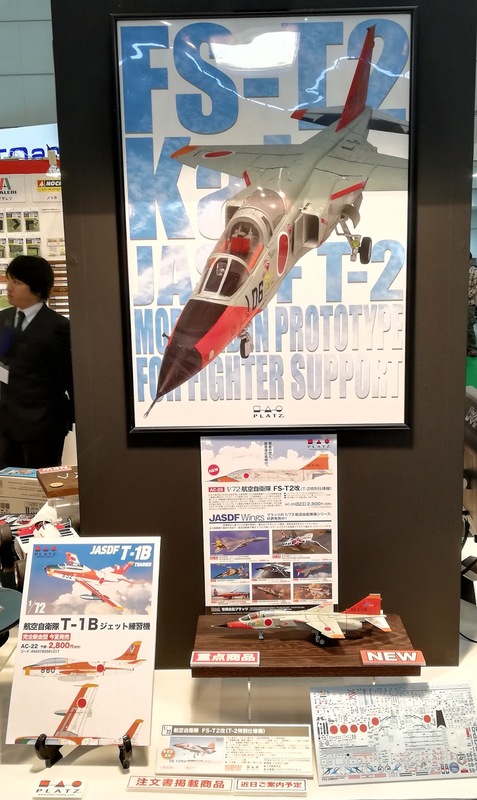 The Platz JASDF FS-T2 Kai, an aircraft noted for connecting the Supersonic Mitsubishi T-2 and F-1. 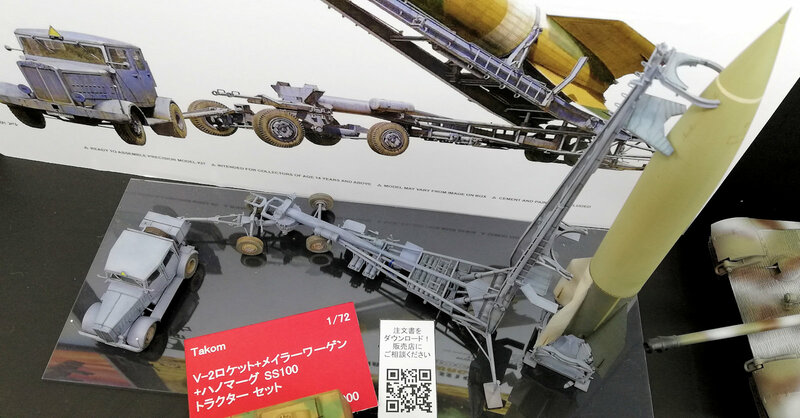 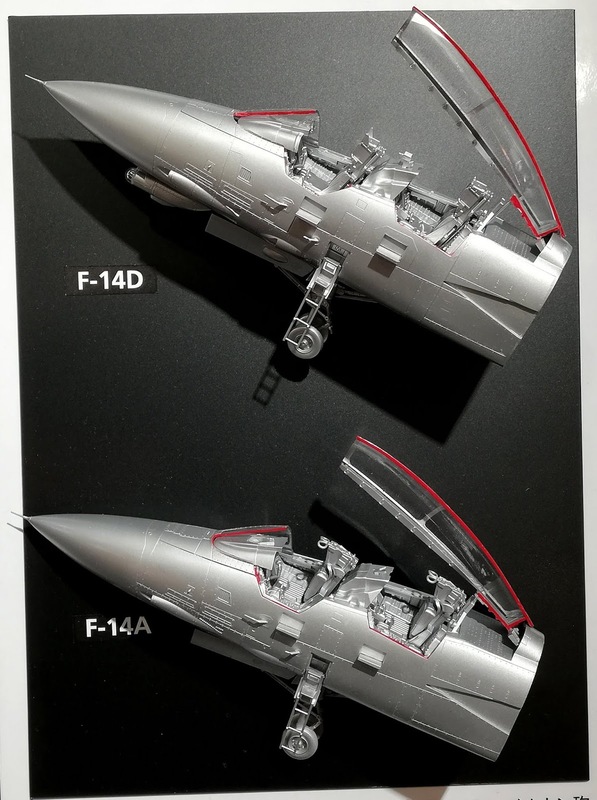 The 1/72 scale kit features new molding for the FS-T2 Kai's unique equipment, and includes silk screen printed decals by Cartograf. 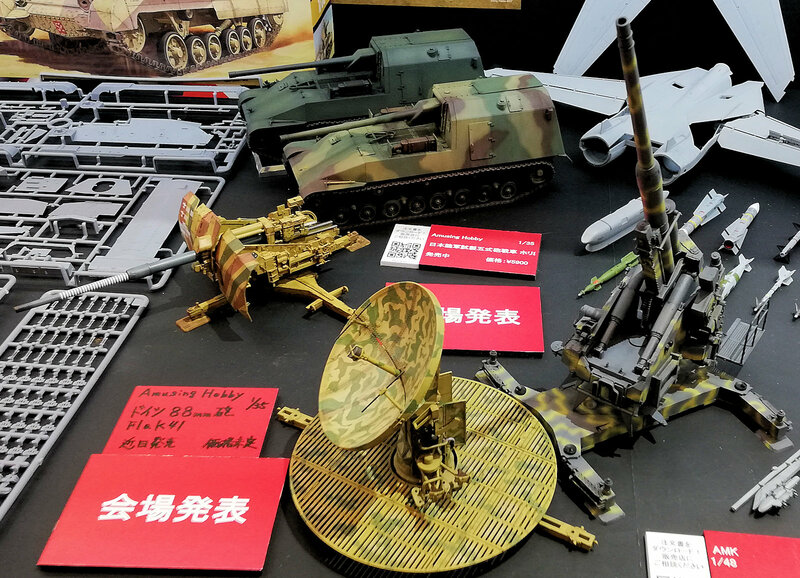 Dragon had a bunch of kits on display at the show - lots of smaller scaled 72nd kits are a departure, but probably a niche that needs to be filled in the market. 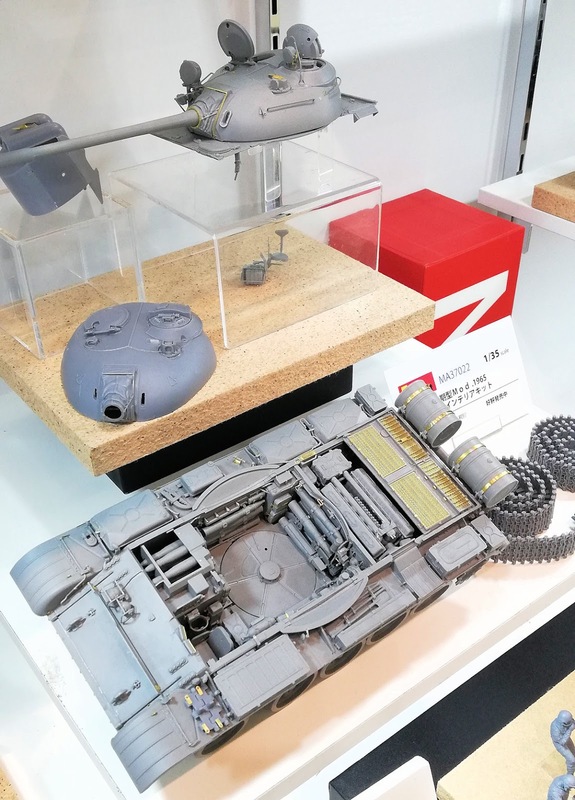 New ktis from Dragon, who have made new tracks to try to fix some of the ill feeling their DS tracks get from model makers - I don't know about these if they are any better! 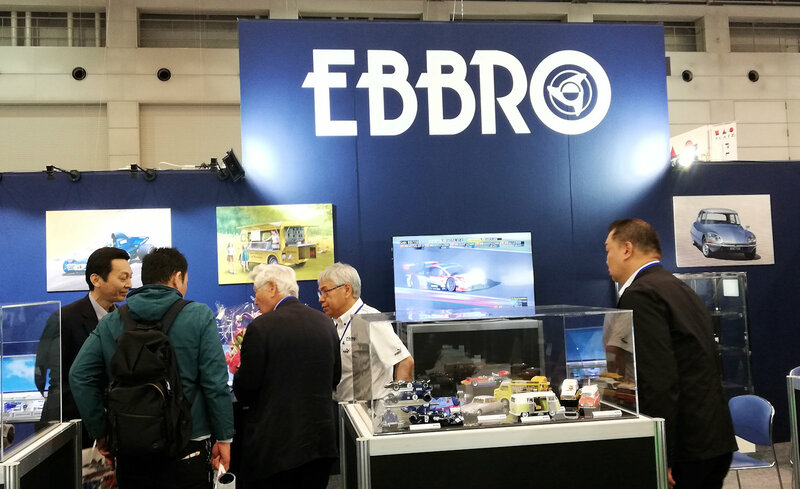 EBRO has the usual, but very nice bunch of kits that look like they are going fast standing still. 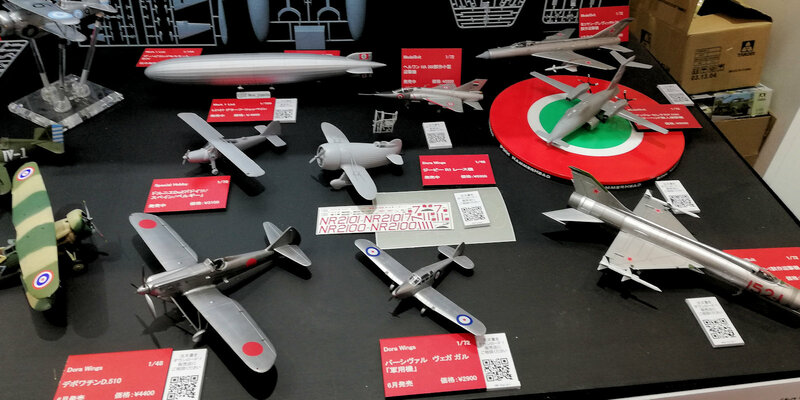 Racers, Bikes and hot cars along with new civilian fast jets make up their range on display this show. 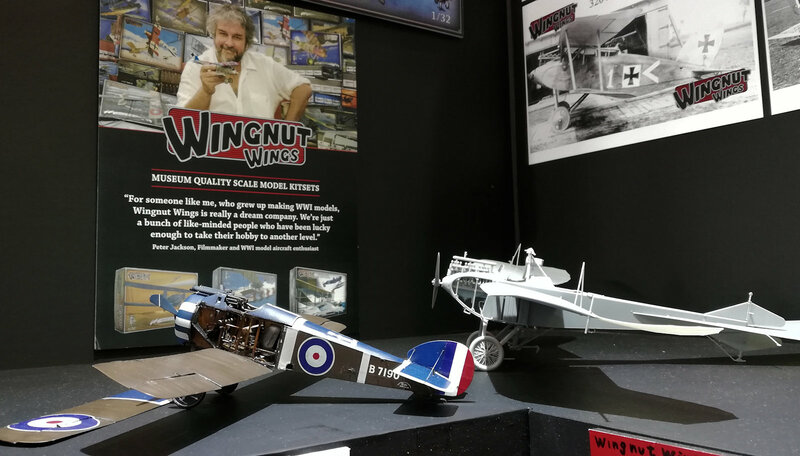 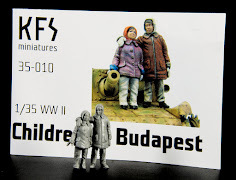 MiniArt's kits were on display at the show - no one from Miniart though which was a bummer! 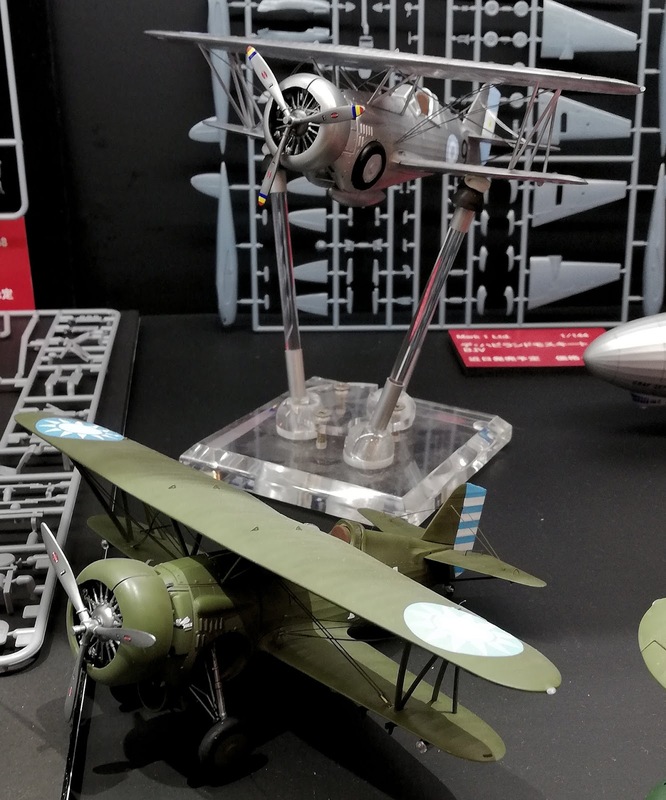 The models are very nice with the Kolibri in two variants made up. 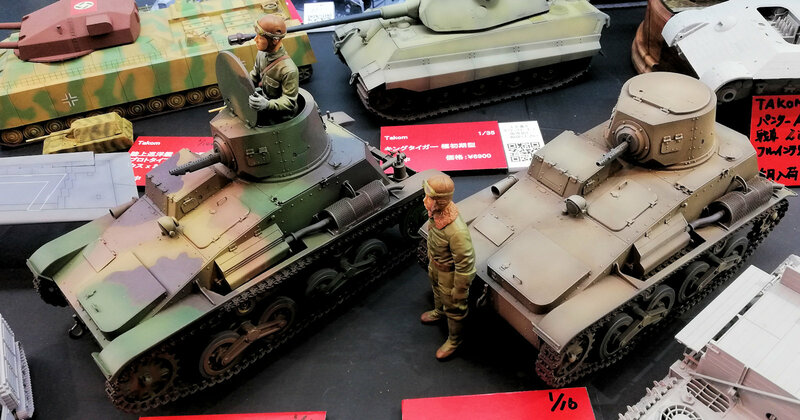 Italeri's kits were on display on the Platz stand also - many different styles and scales as per usual from these guys. 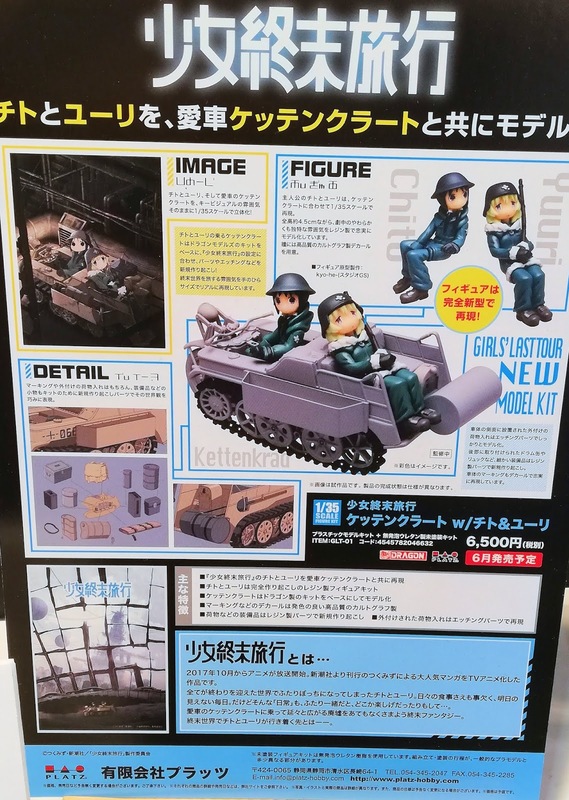 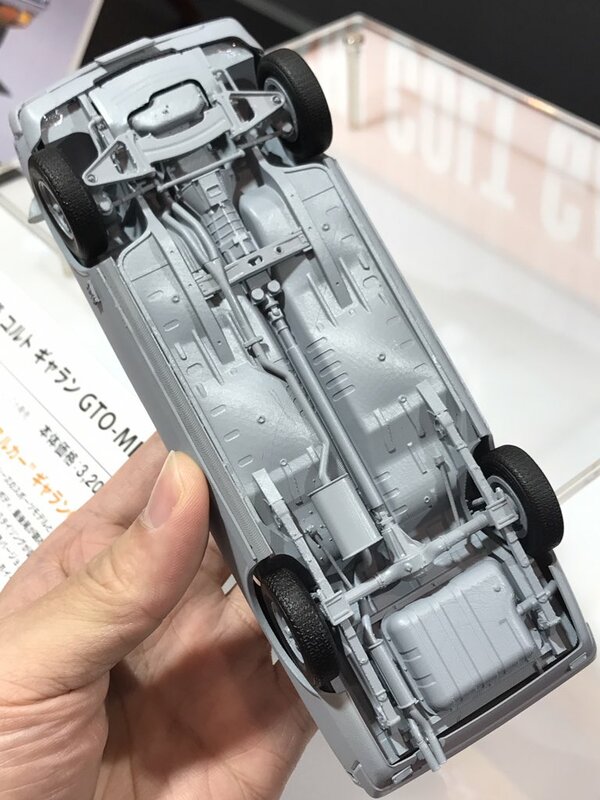 They're also bringing us a 1/35 scale kit of the Kettenkrad from the dystopian anime series "Girls' Last Tour," which includes figures of Chito and Yuuri. 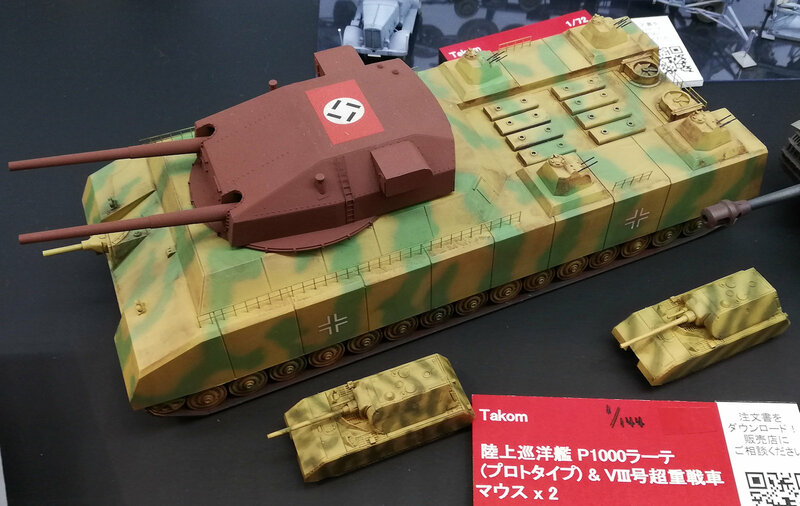 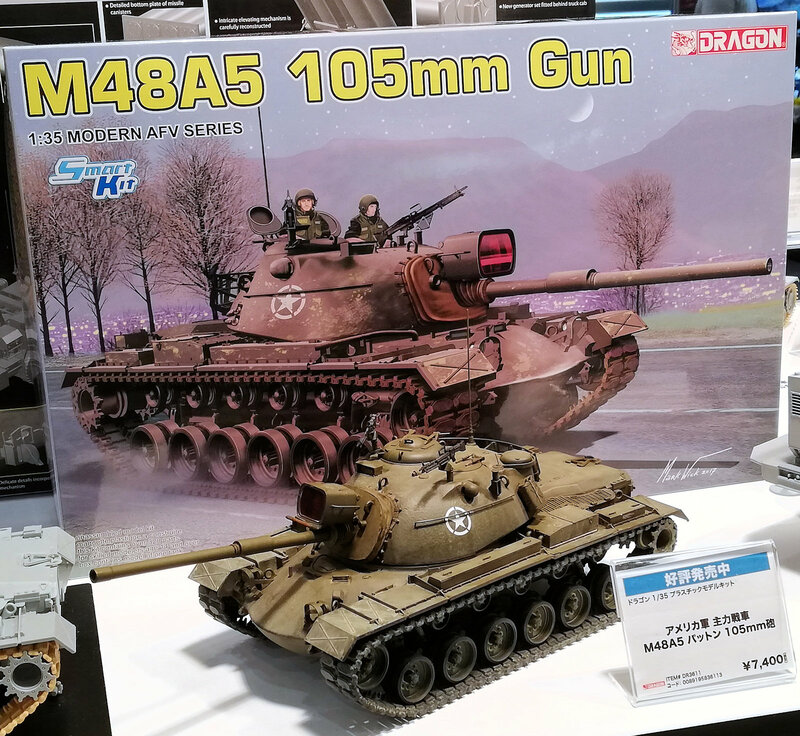 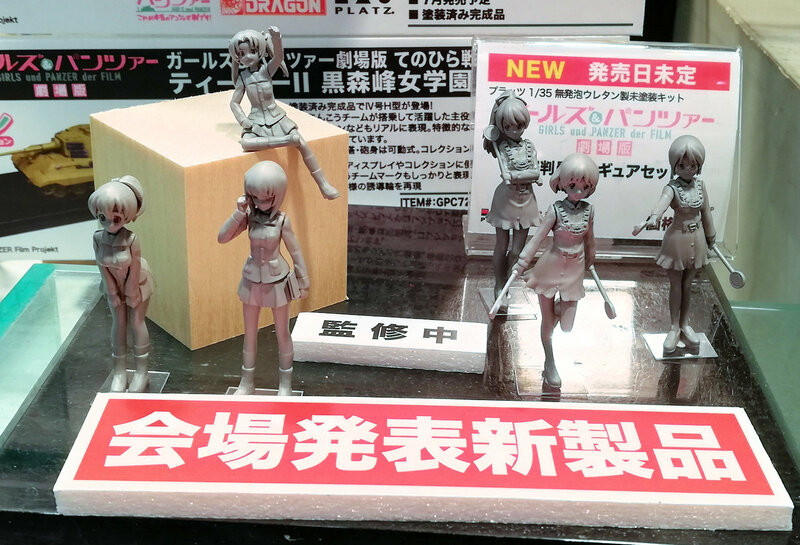 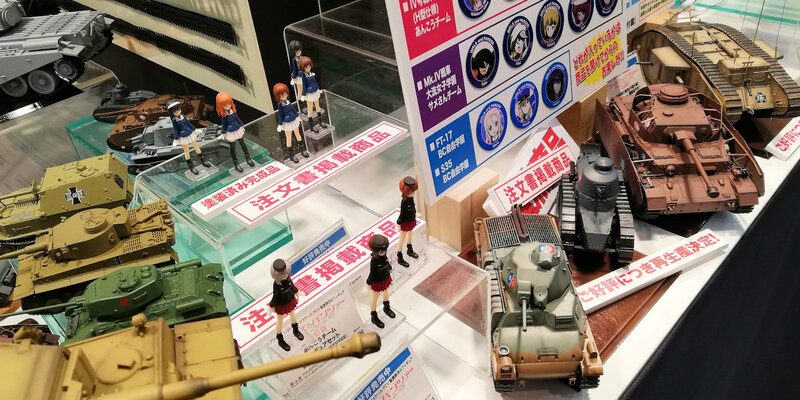 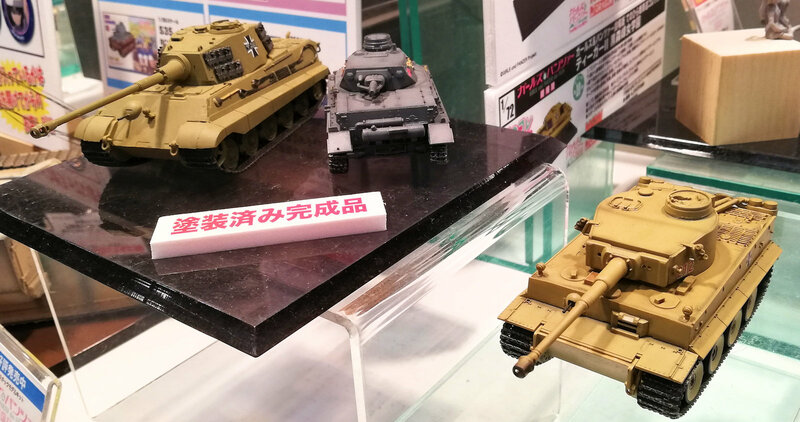 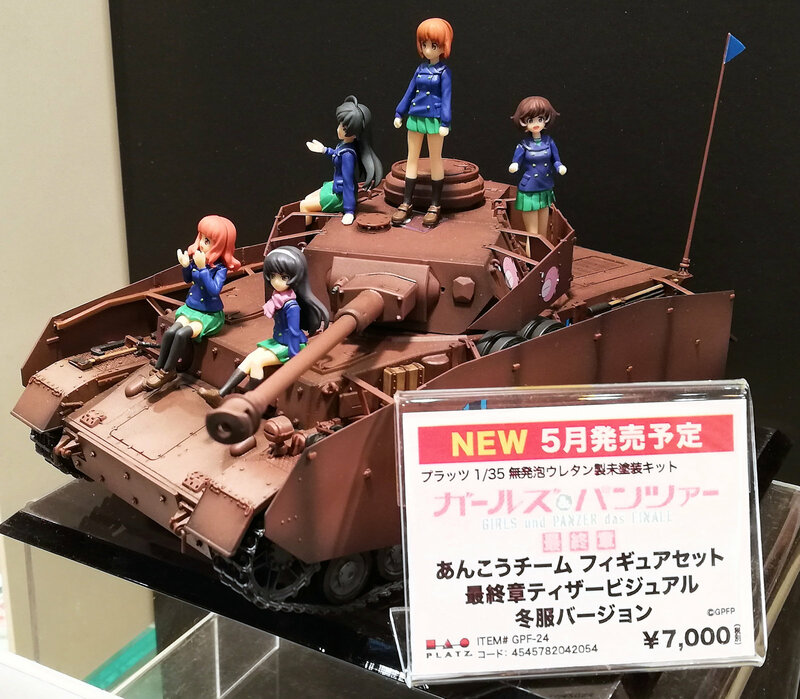 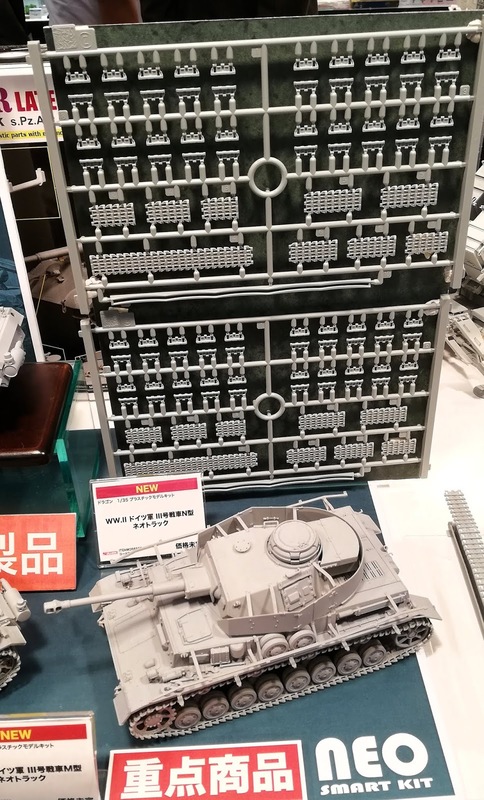 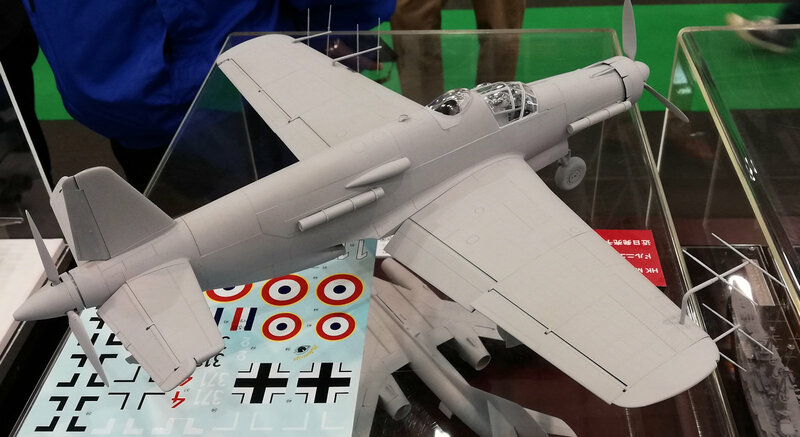 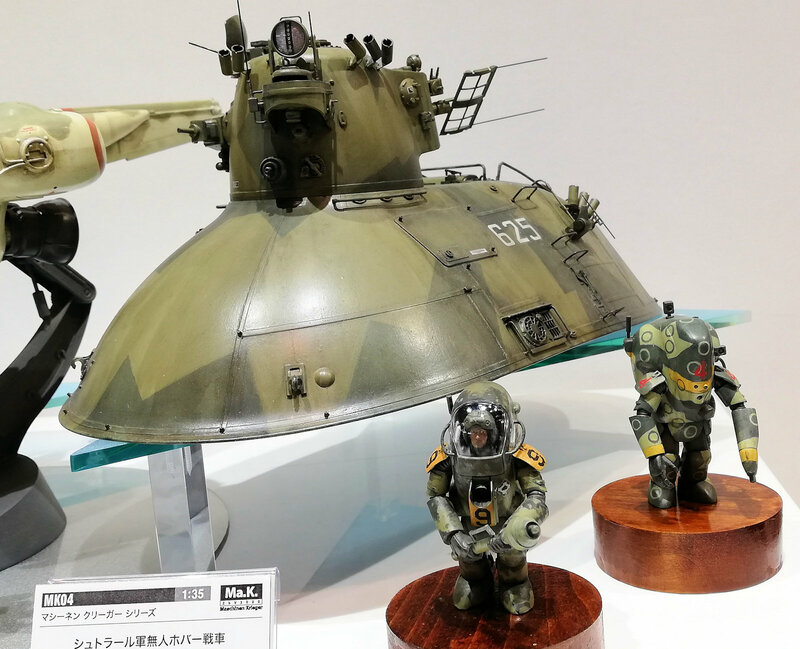 Platz's kits based on the anime "Girls und Panzer" were on show along with the news they are releasing two new figure sets to display alongside your tanks. 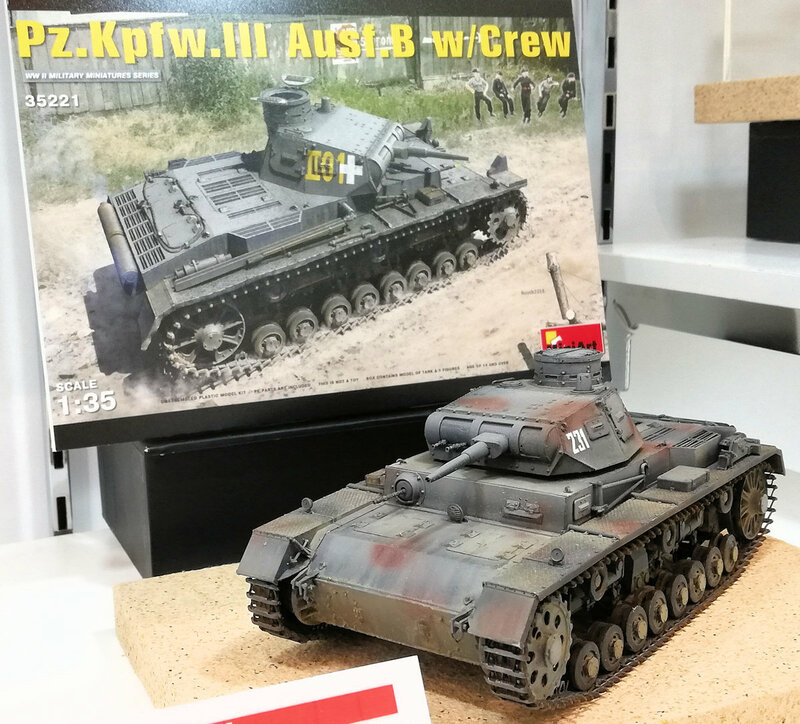 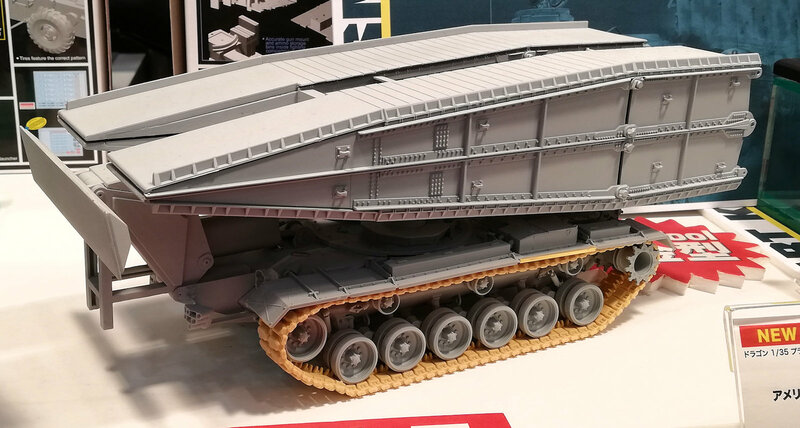 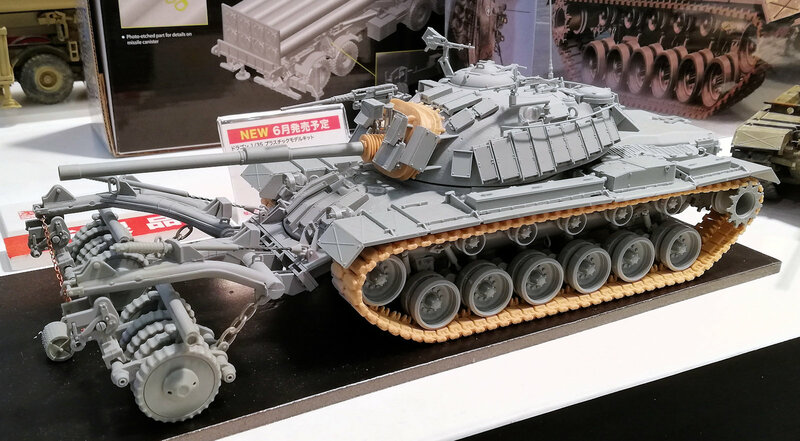 Plats' new multi gunned tank in 72nd scale is in the same interest area, I know a few people who love these...and what about the cast of thousands for the crew! 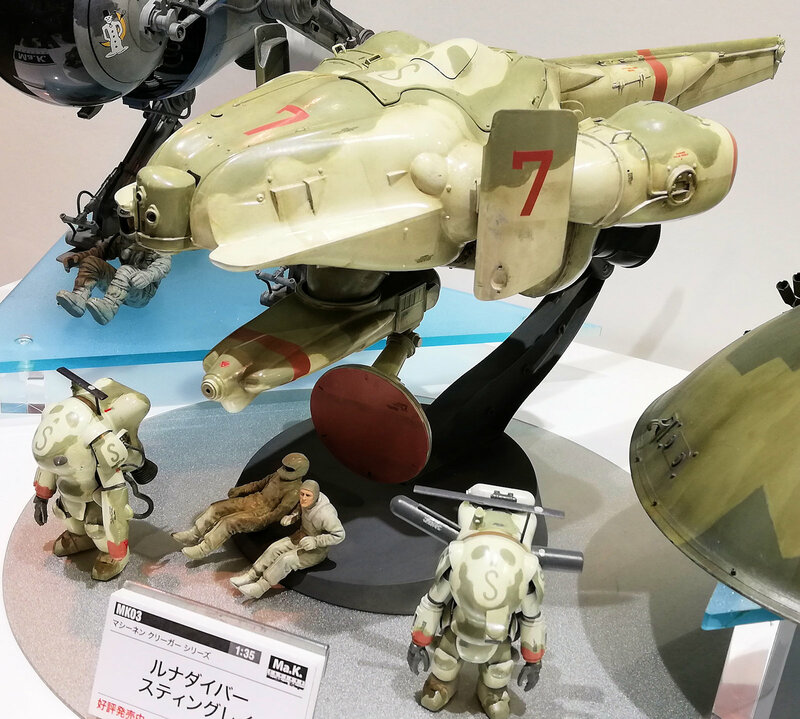 There were a few lovely Moebius Models kits there made up also. 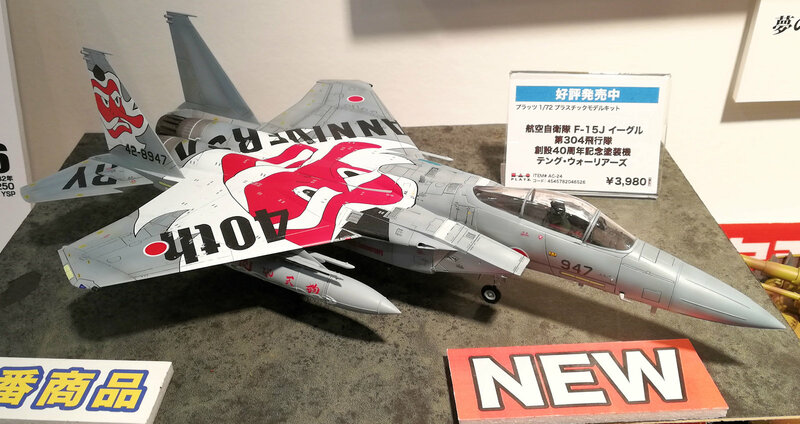 Platz new 72nd scale MiG-29 (9.13) Fulcrum C was there along with the 1/144 Flying Color Selection AV8B Harrier II (2pcs). 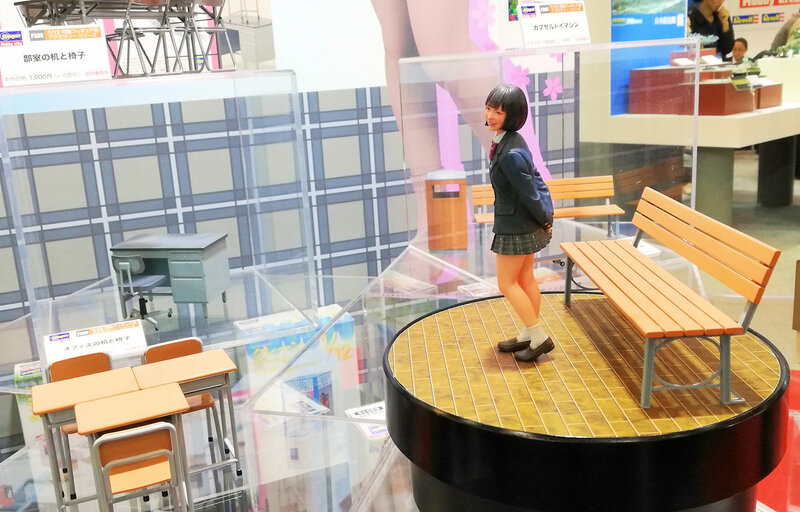 The first place I go to on these says is the Beaver Corporation, Inc's Stand. 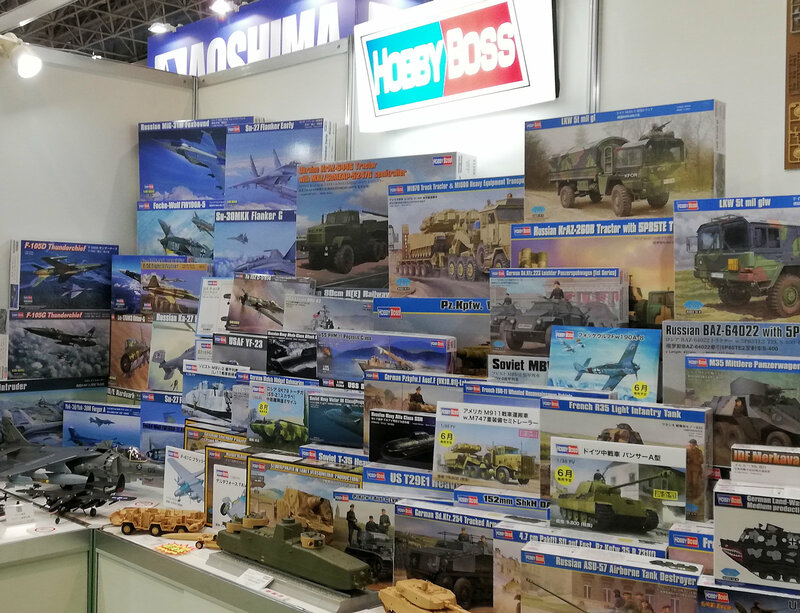 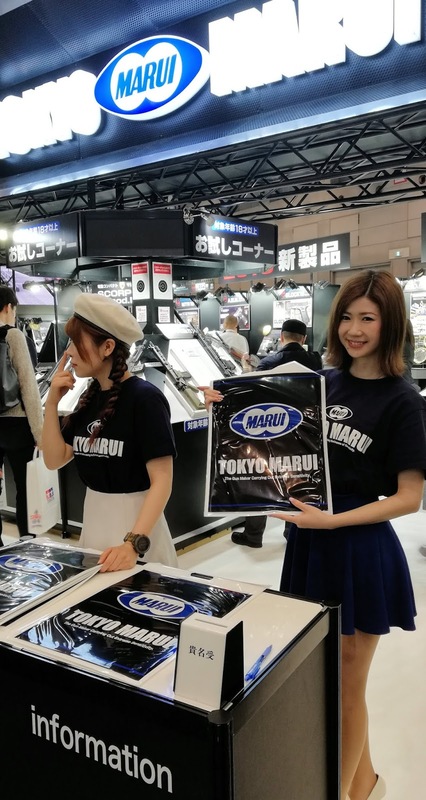 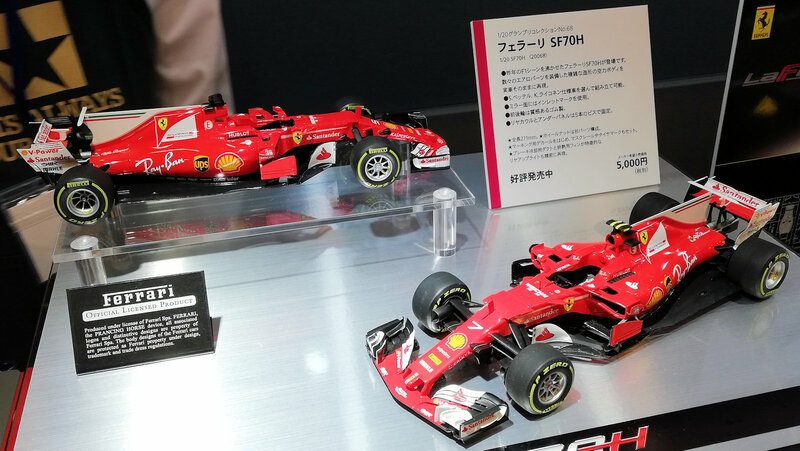 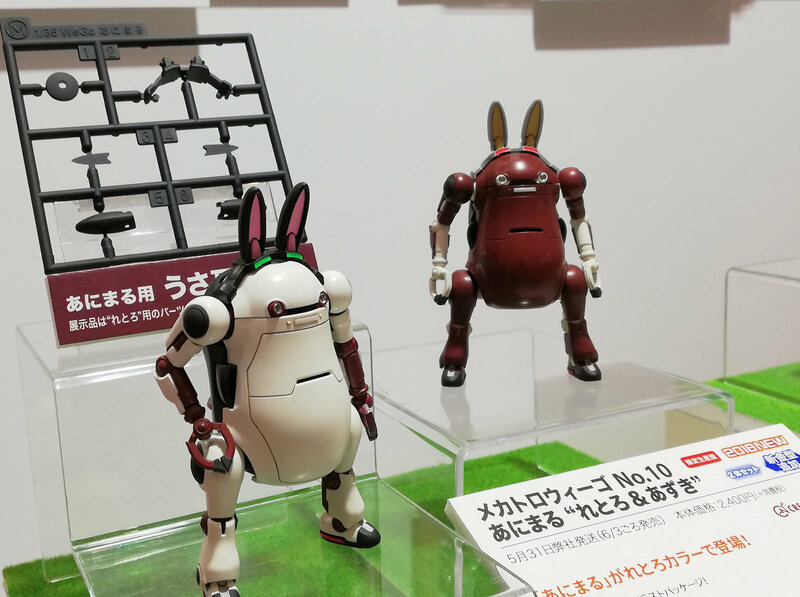 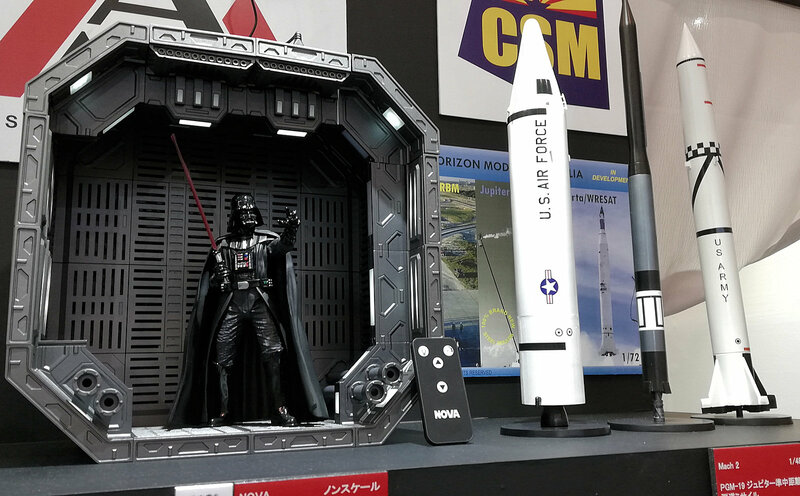 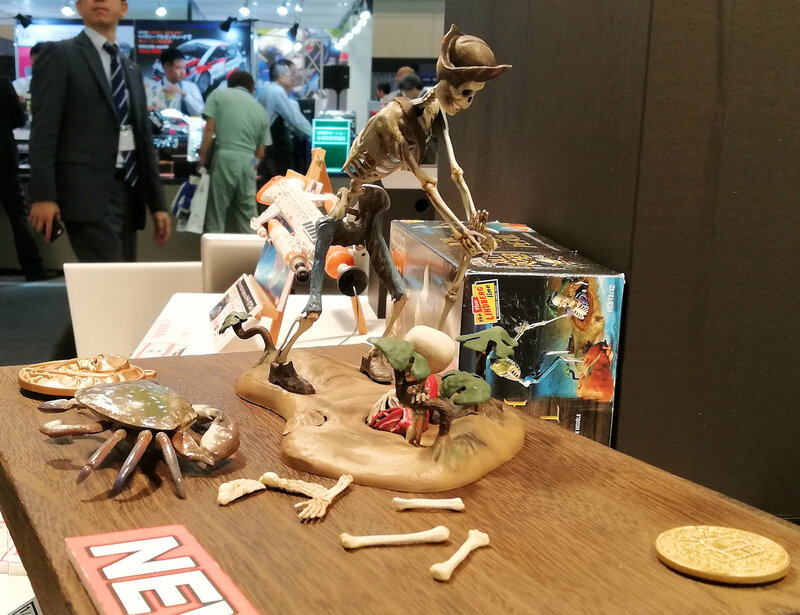 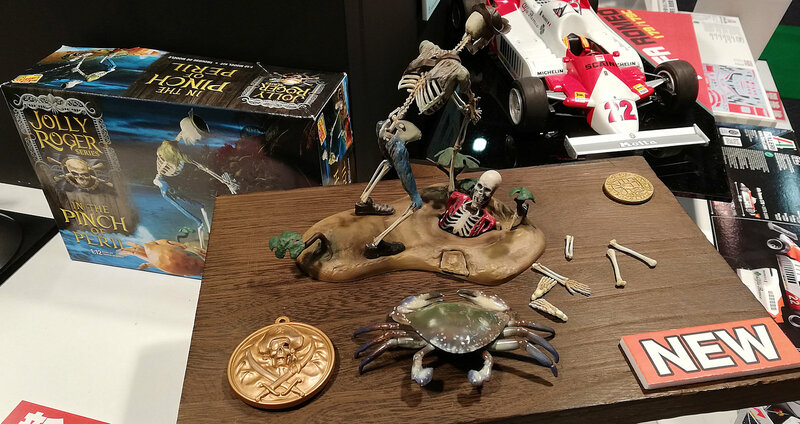 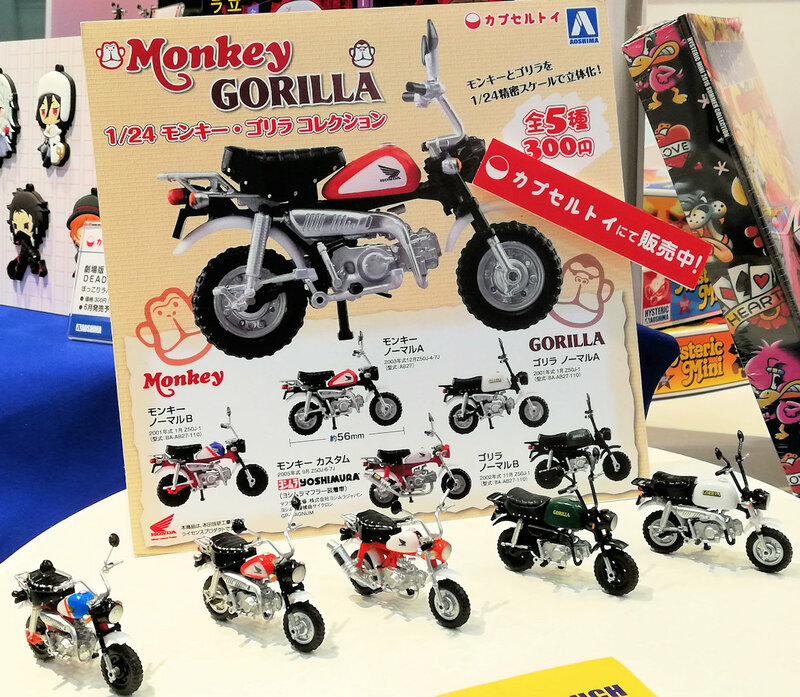 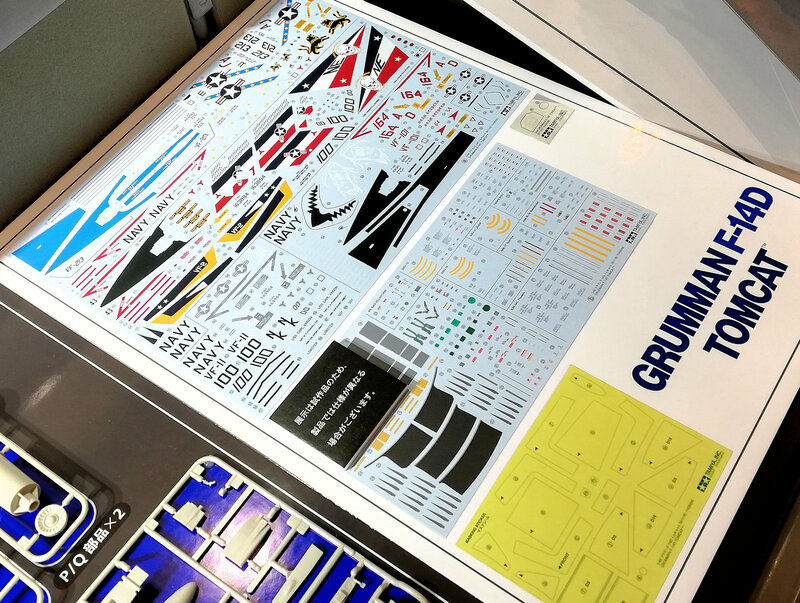 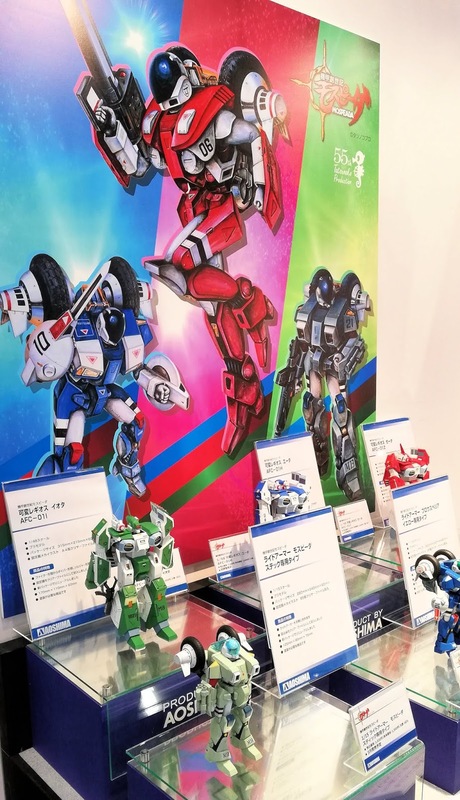 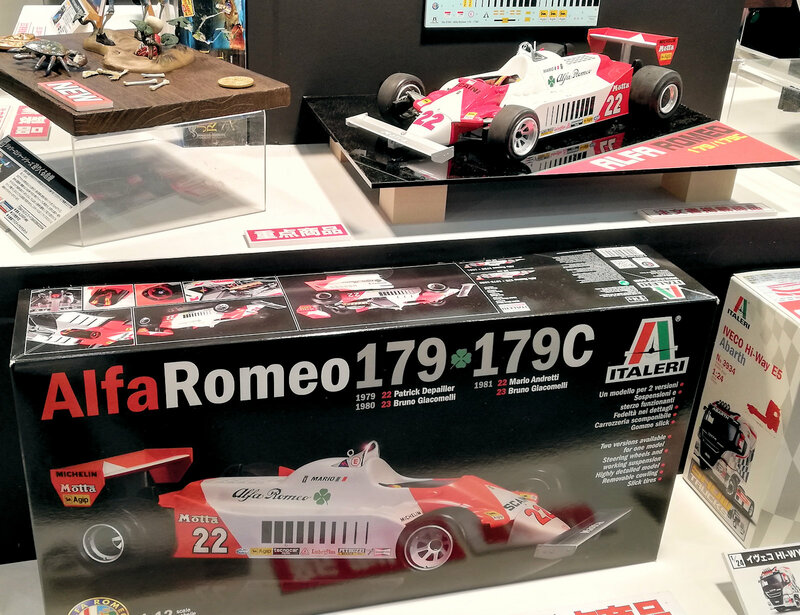 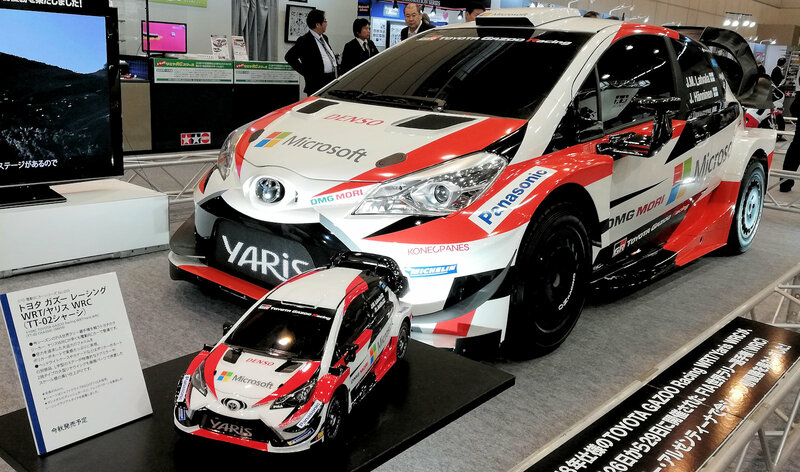 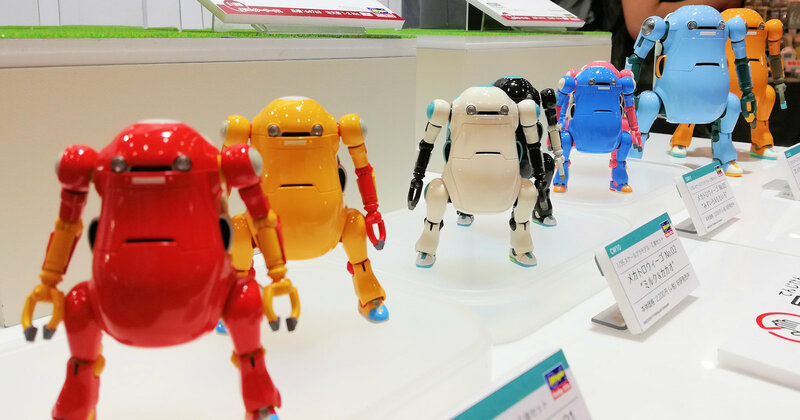 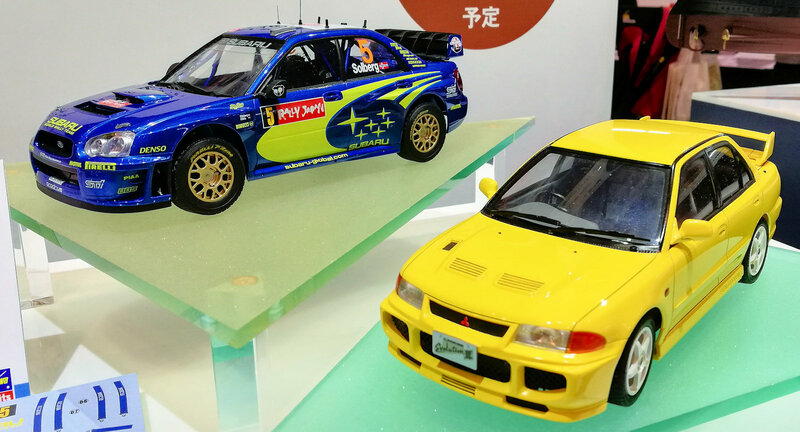 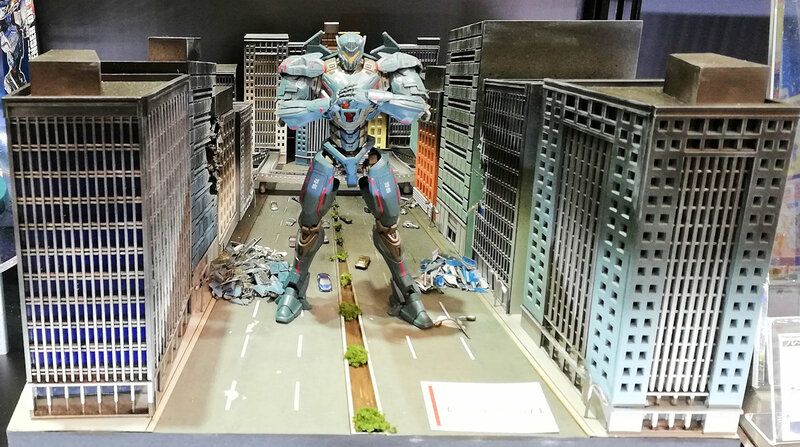 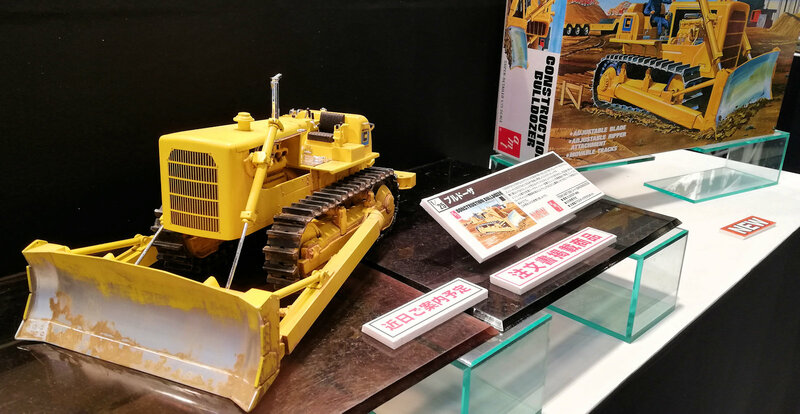 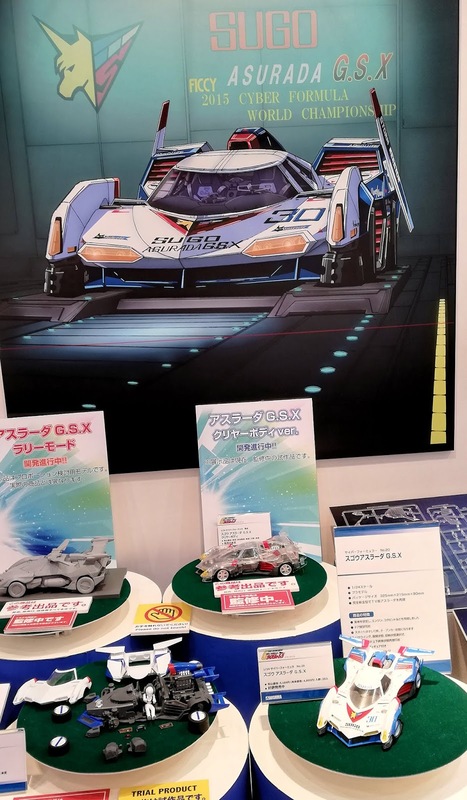 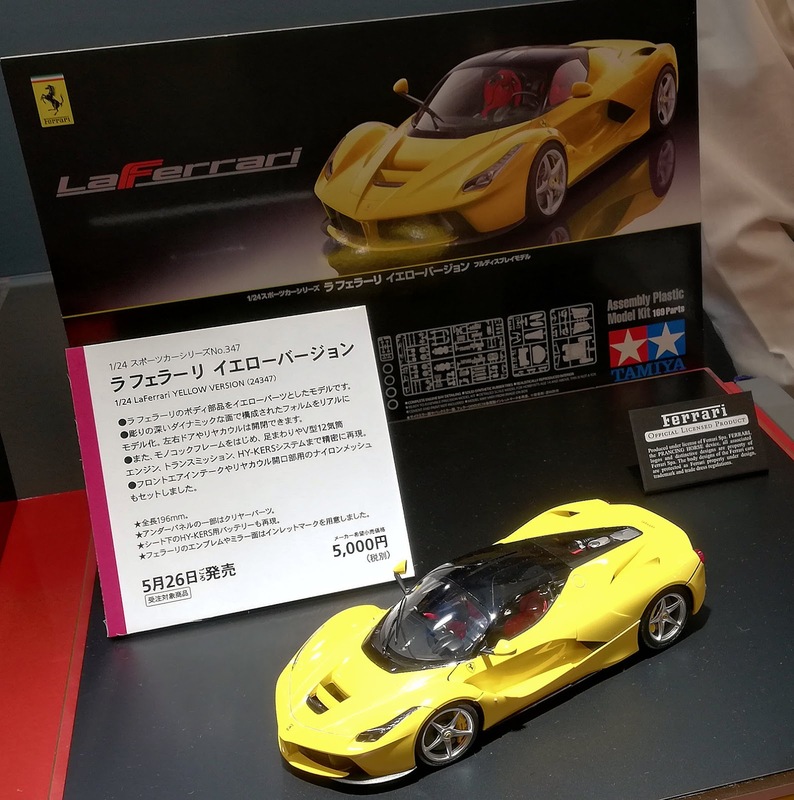 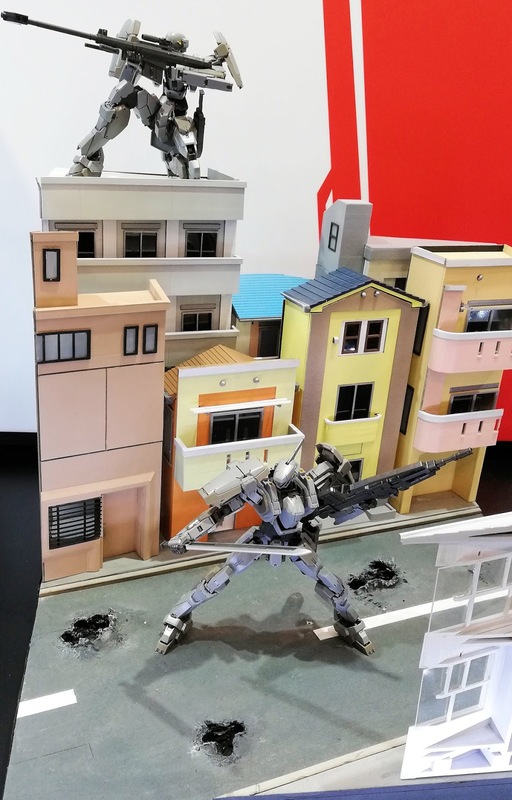 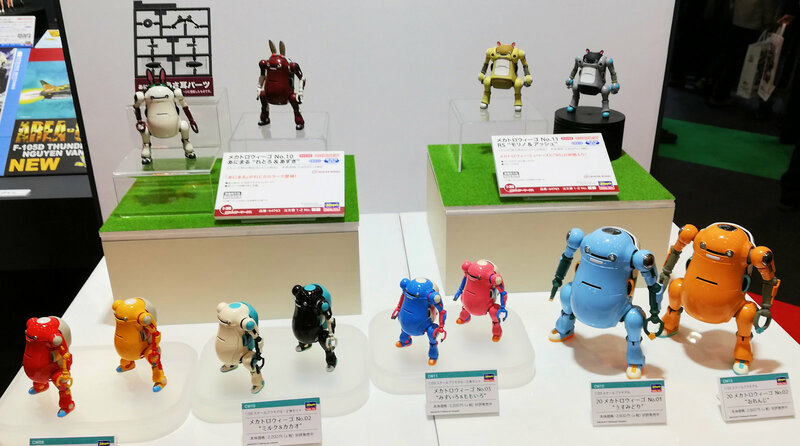 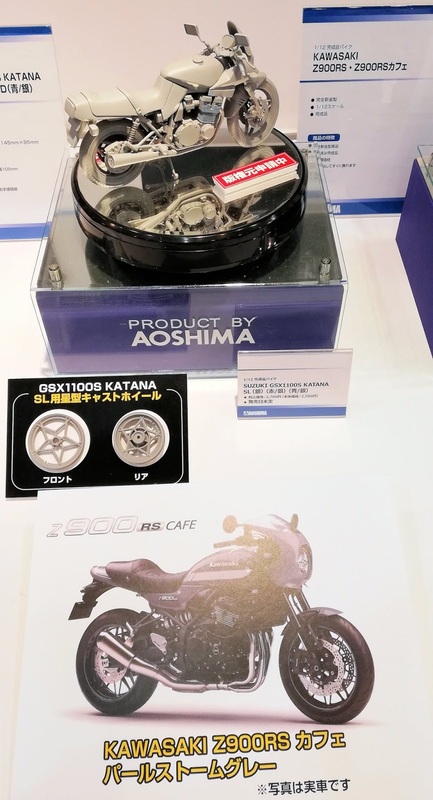 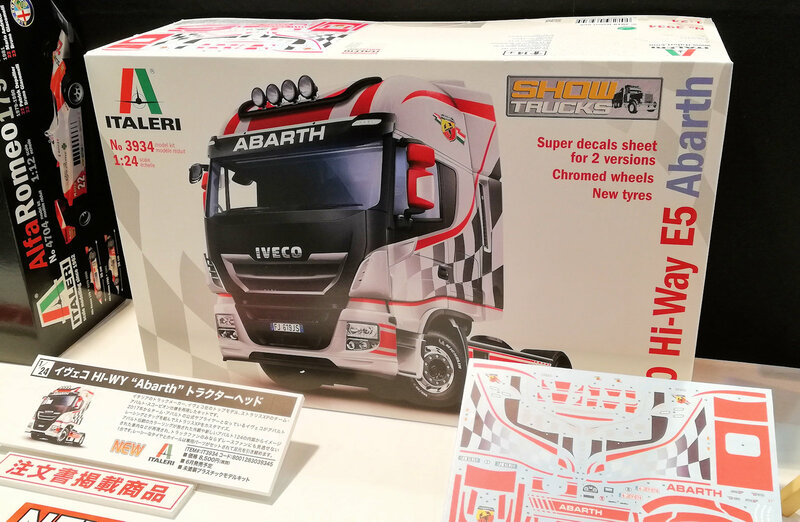 These guys are the major distributors in Japan for a great number of companies, so they have some of the most interesting and the widest range of kits on display. 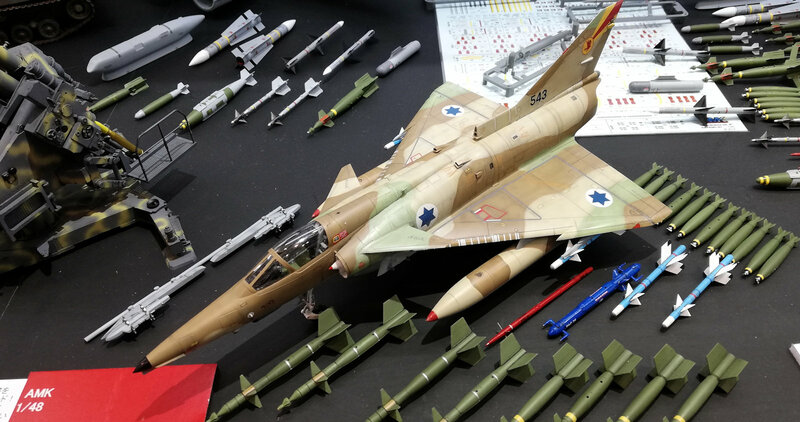 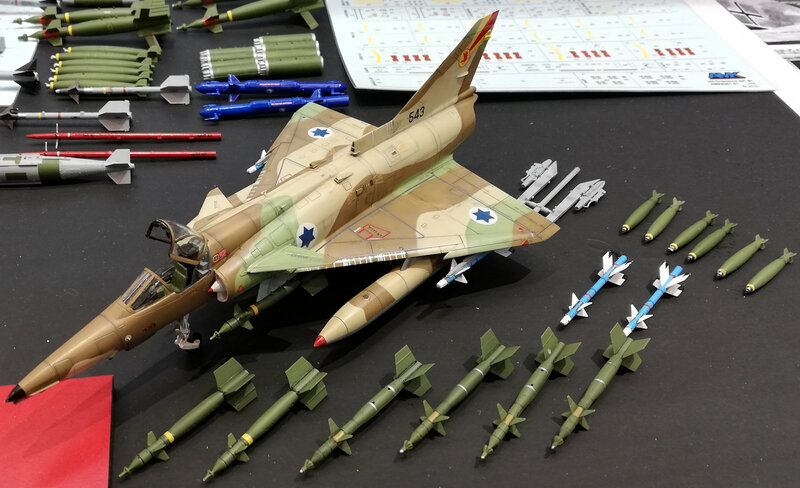 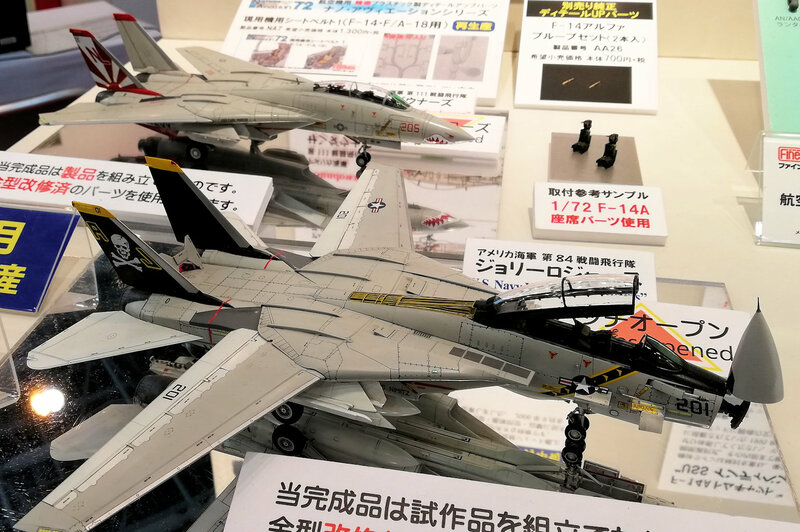 AMK had several nice kits on display, Kifr's in two different scales as well as their new F-14D that had a vast array of weaponry ready to be laded. 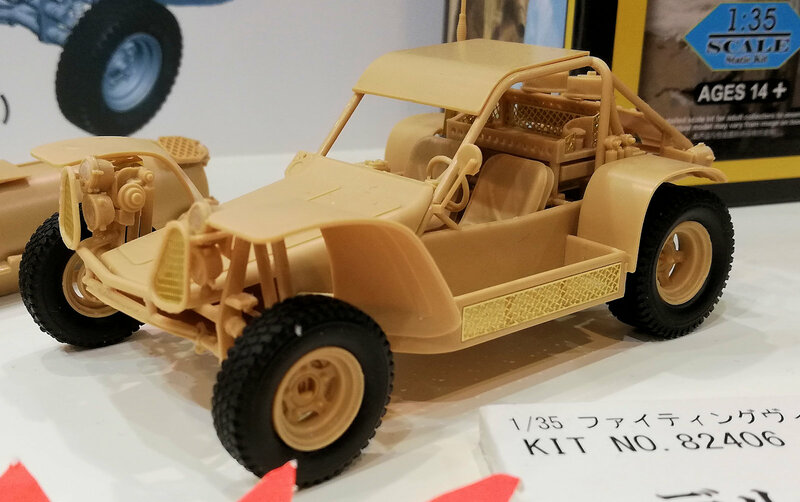 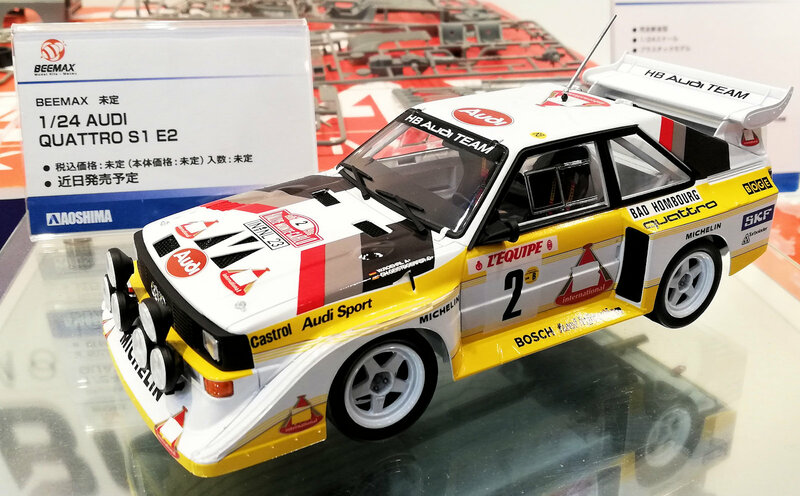 This kit looks just as interesting to us as the Tamiya version, and we would like to show you it when it lands latter on this year. 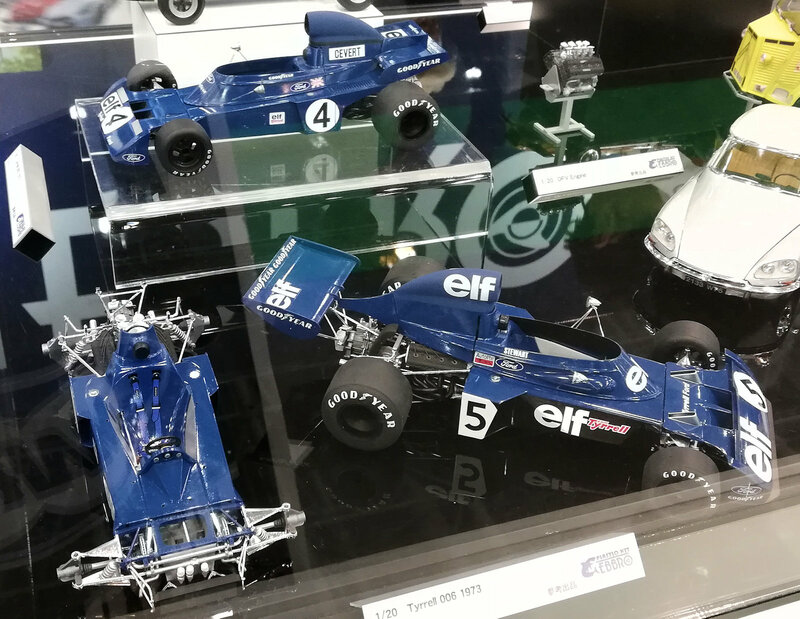 Lots of kits from smaller companies were just as interesting to us, these subjects and the kits should do a lot of business this coming year for Beaver. 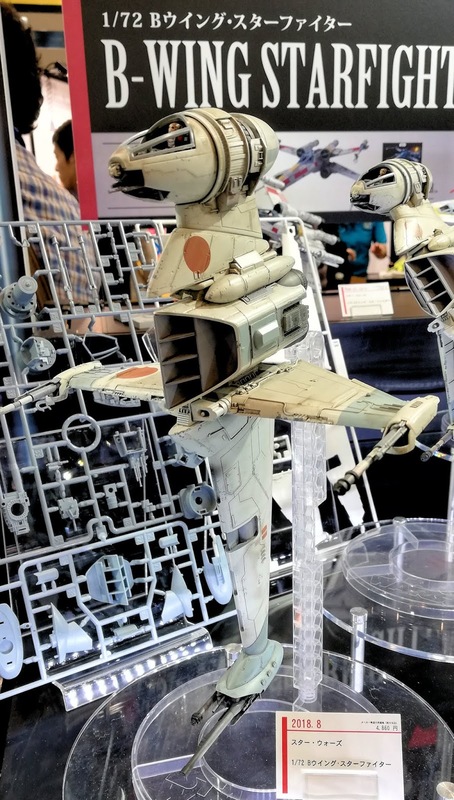 Heller's 72nd scale E-3 AWACS Sentry saw a lot of interest. 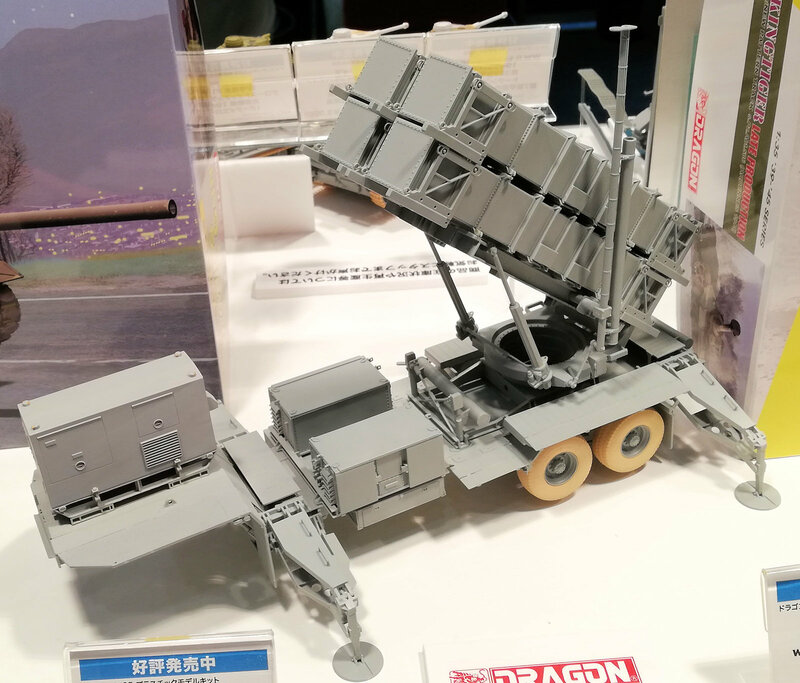 Amusing Hobby had some nice new kits there - including the air defence system including radar, FlaK and Japanese super heavy gun carriage kits looking very good in 35th scale. 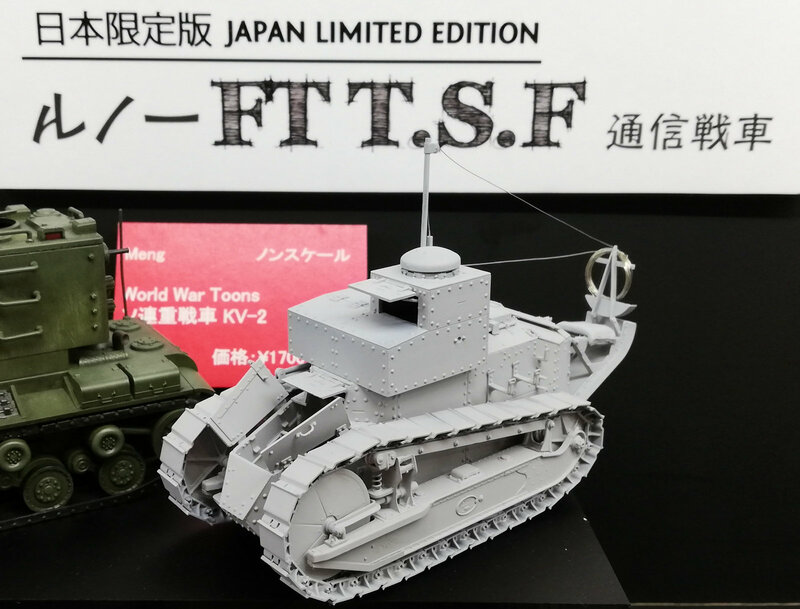 This French FT T.S.F Radio Version in 35th scale is a very special armor and it's the first one used only for radio communication. 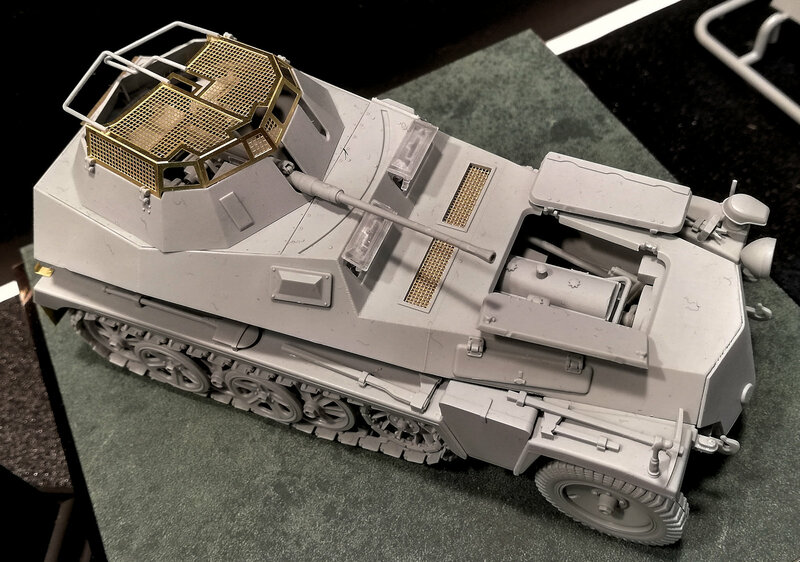 It was based on the FT-17 tank with its rotatable turret replaced by a fixed fighting compartment to accommodate the radio. 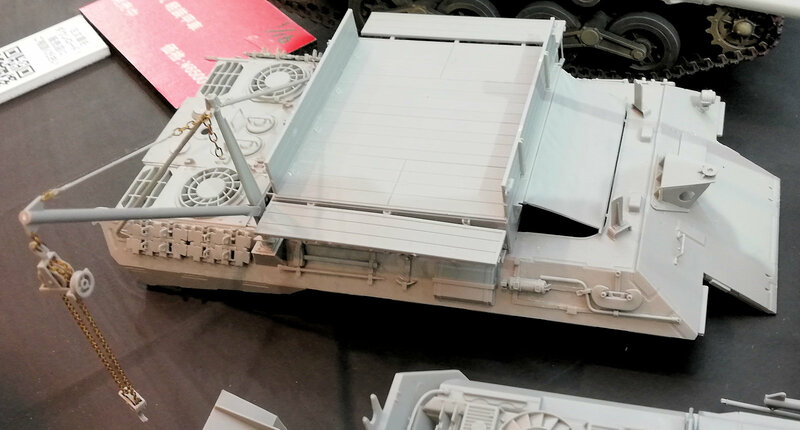 It also received an antenna mast and a spare antenna mount. 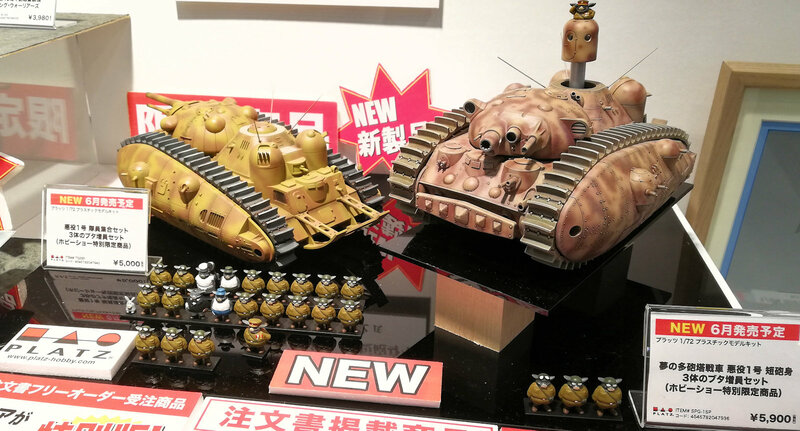 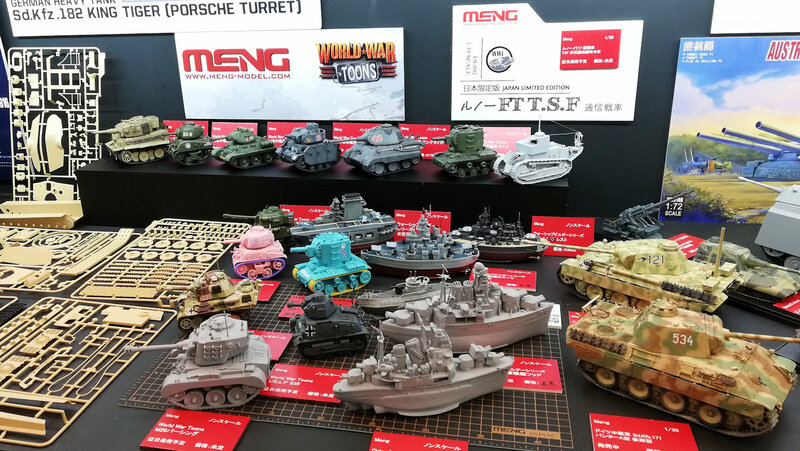 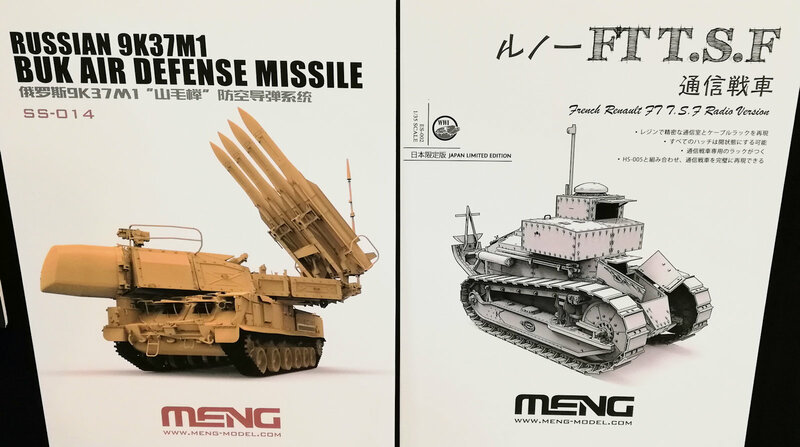 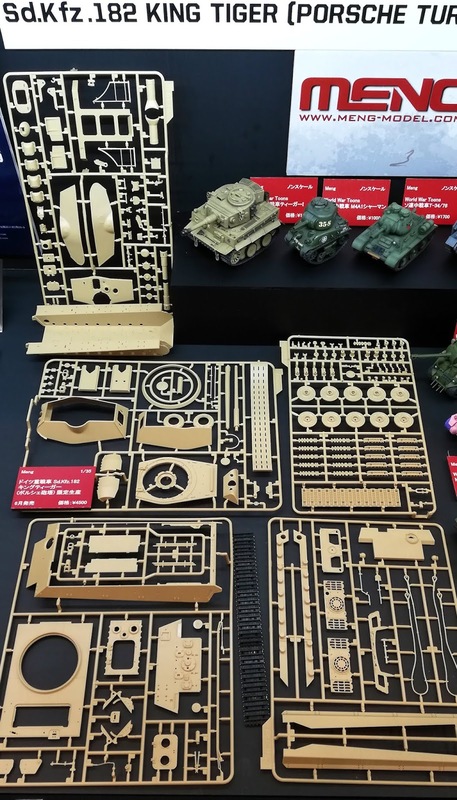 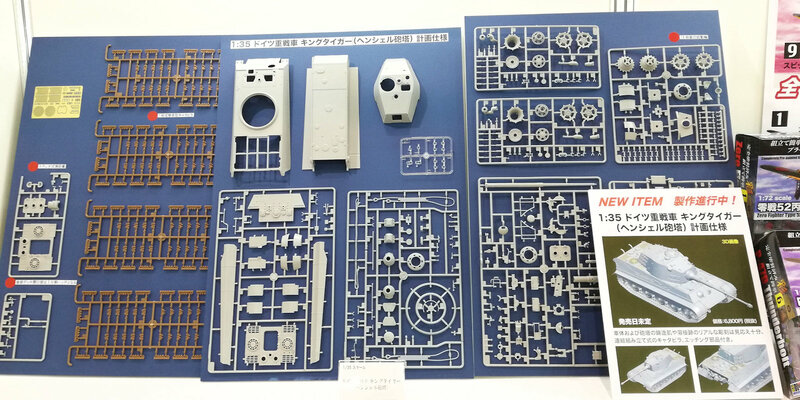 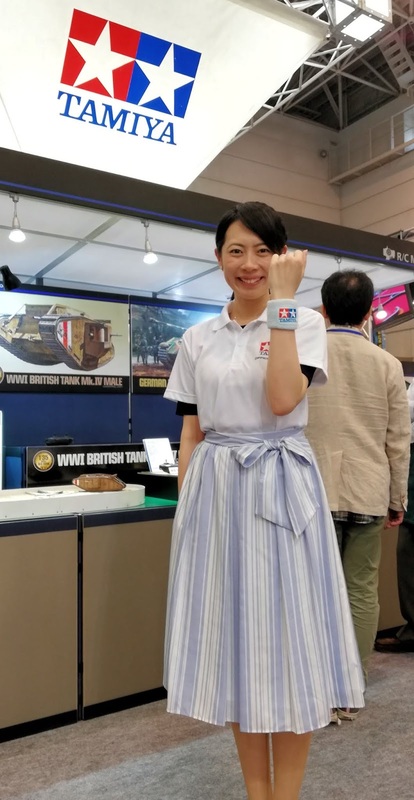 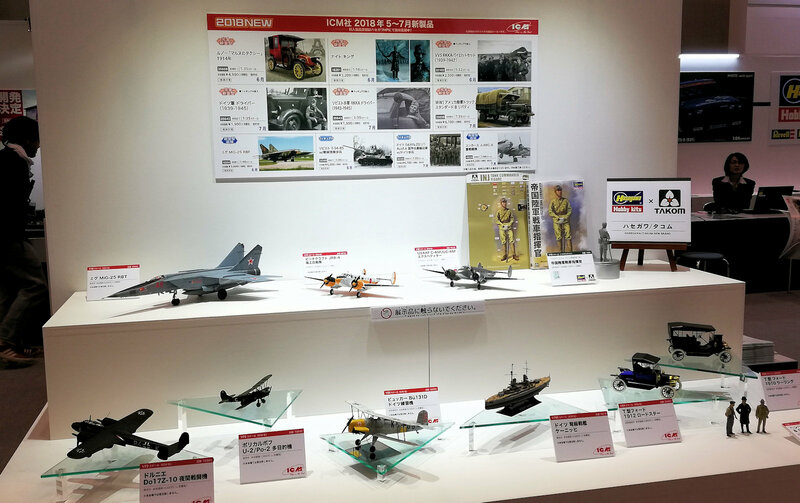 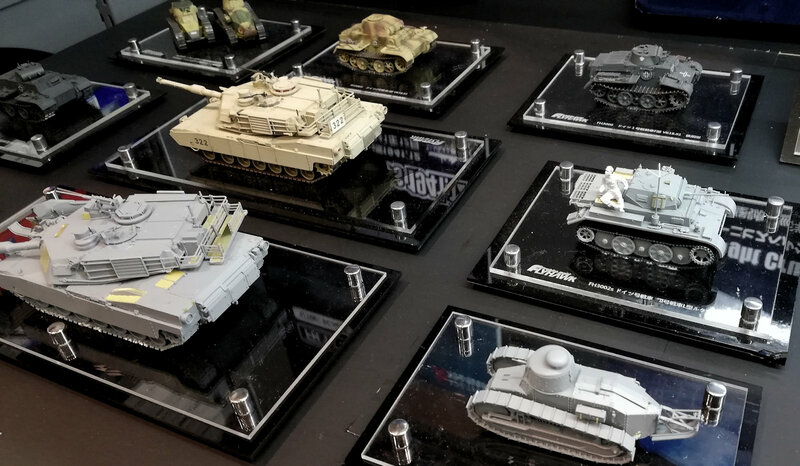 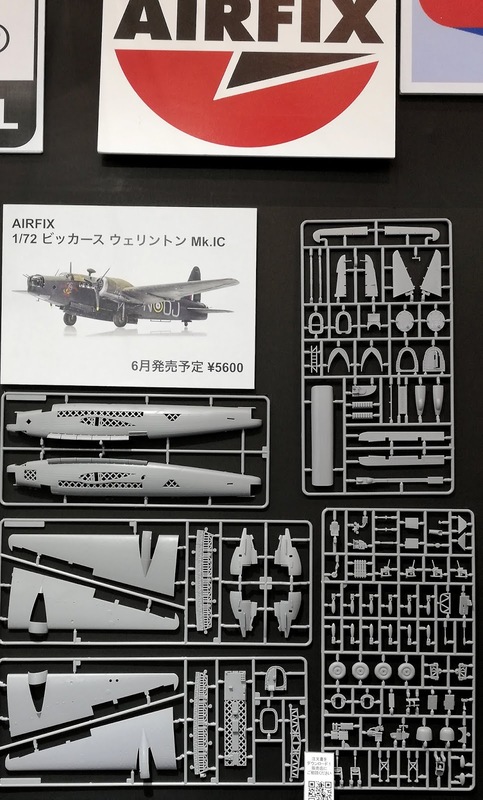 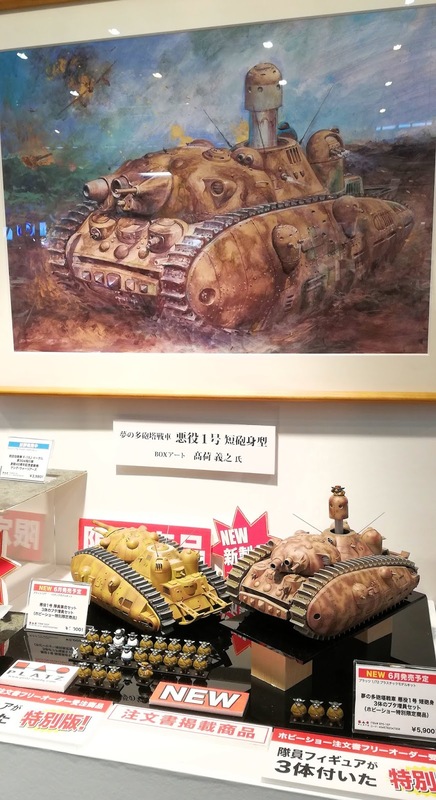 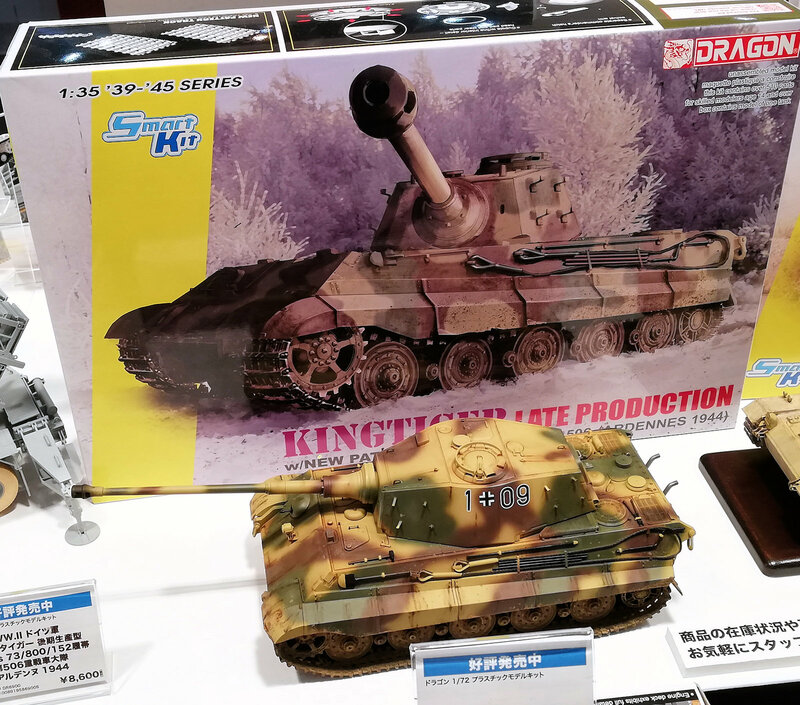 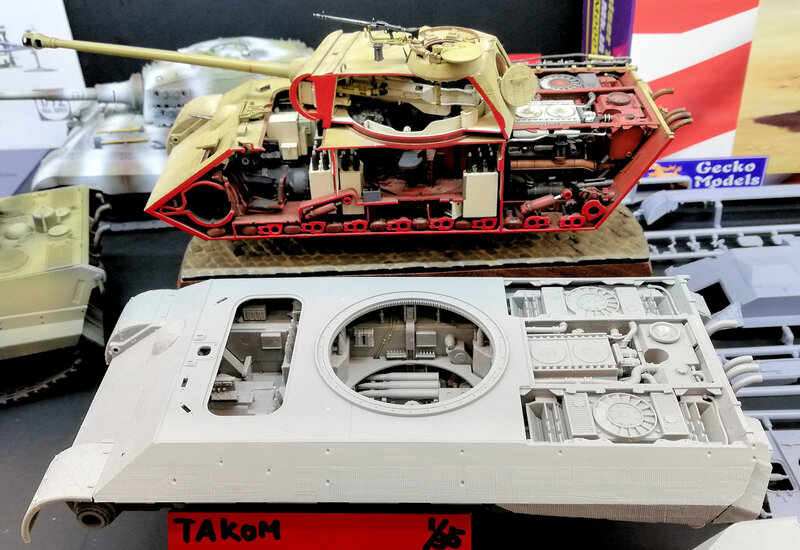 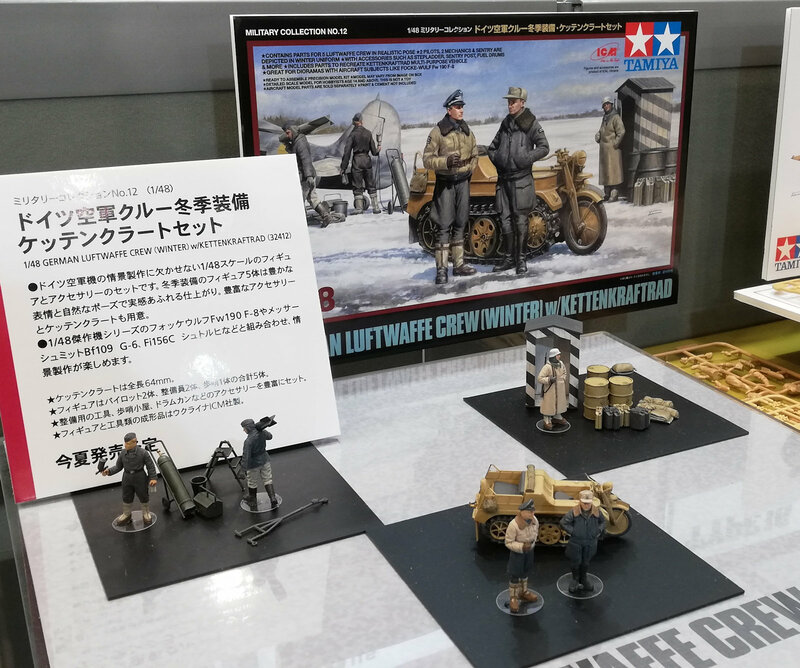 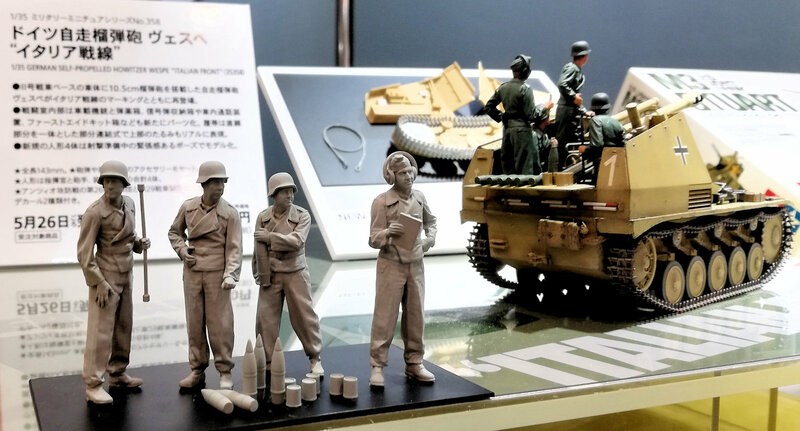 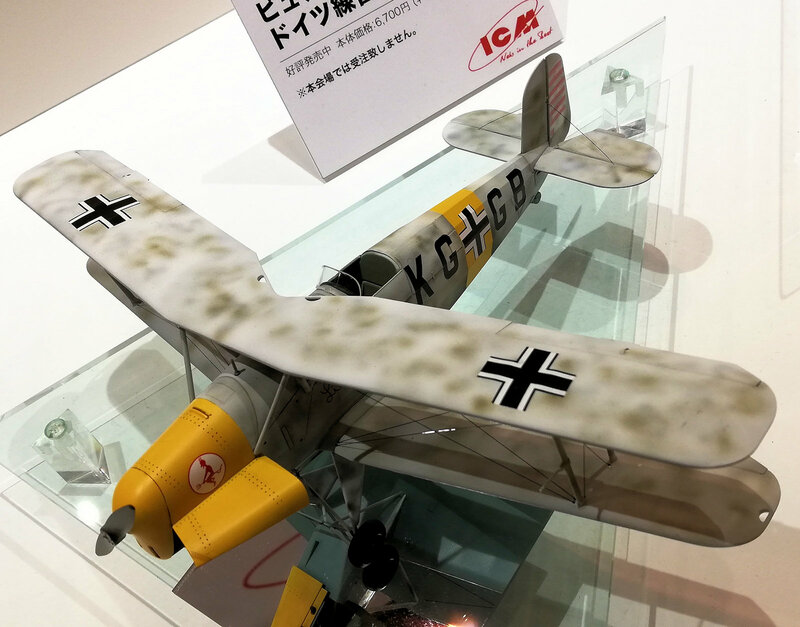 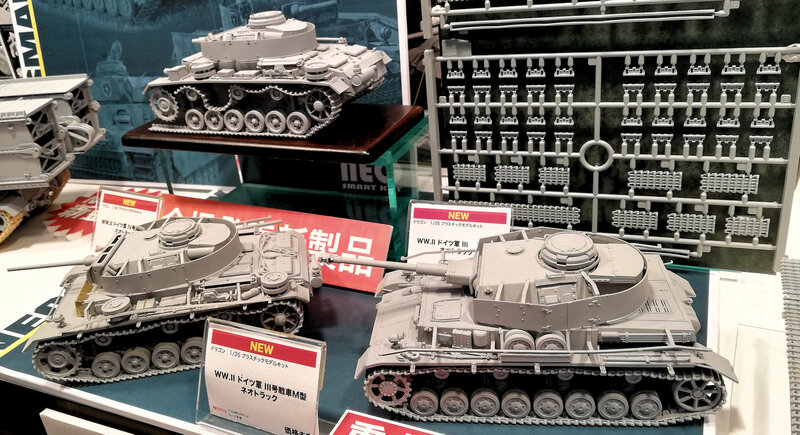 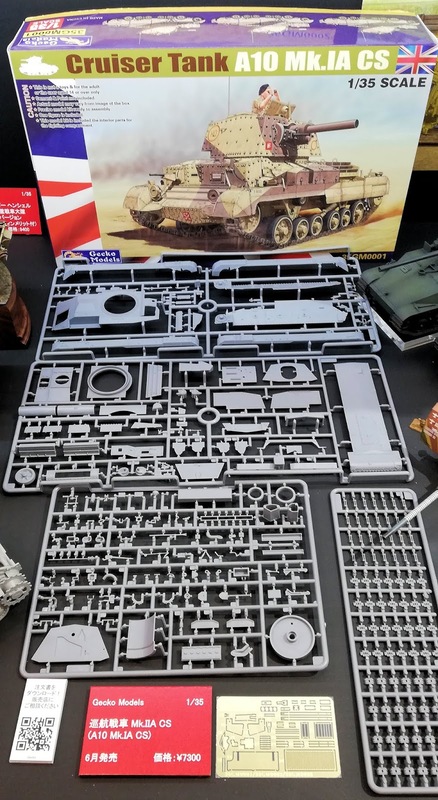 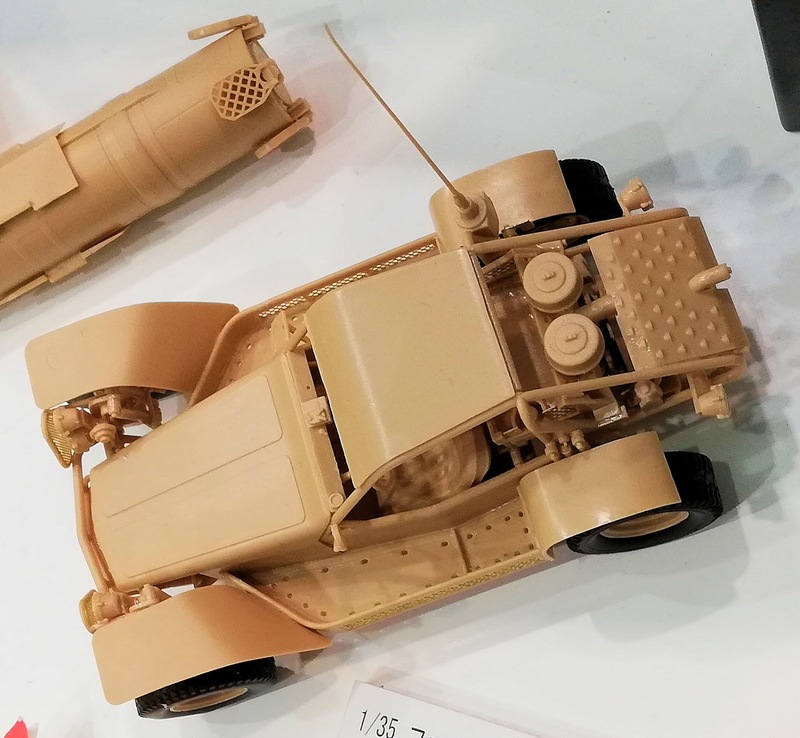 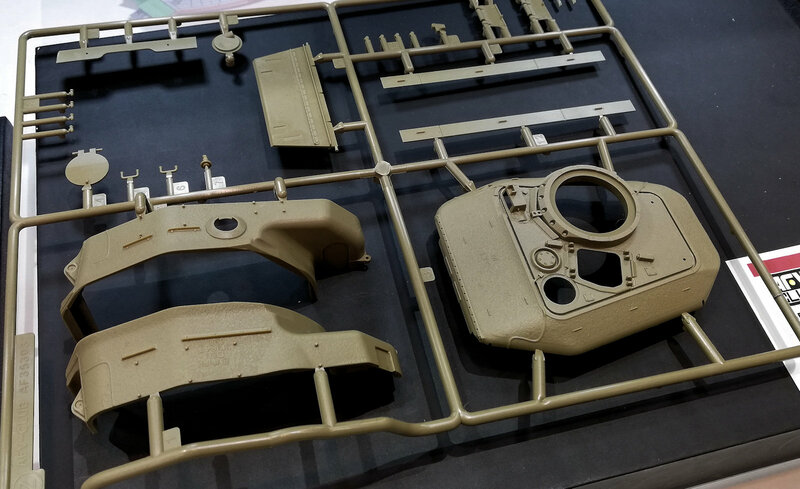 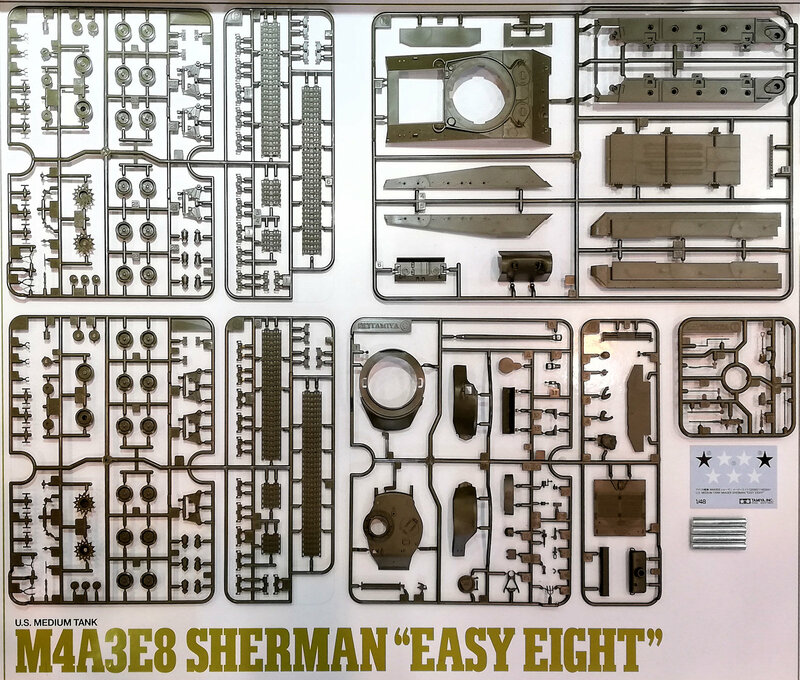 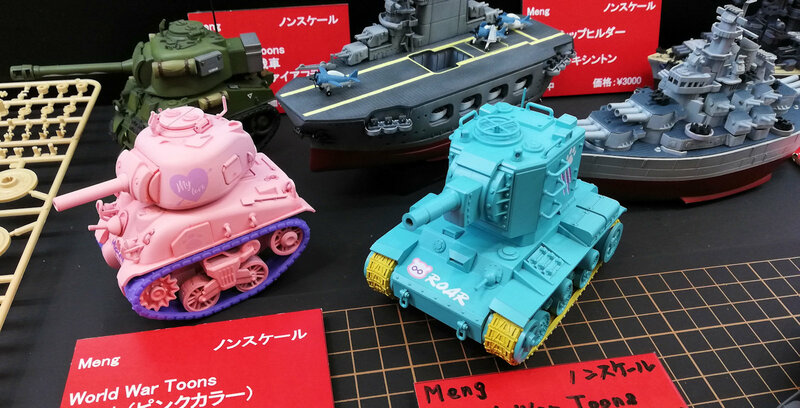 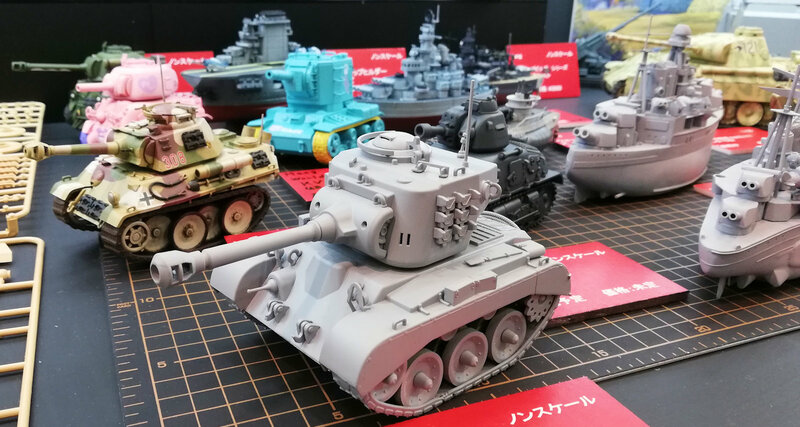 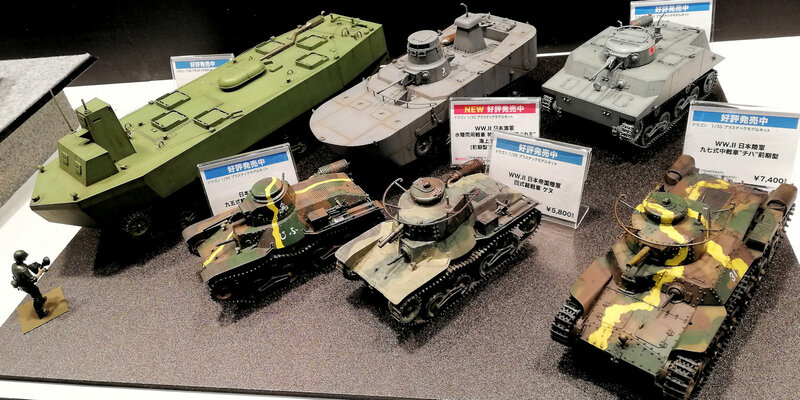 We love to see those "World War Toons," kits, and Meng's non-scale KV-2 snap-fit kit will soon be back with pre-colored parts, a new highly coloured KV-2 and Sherman tank were here on display. 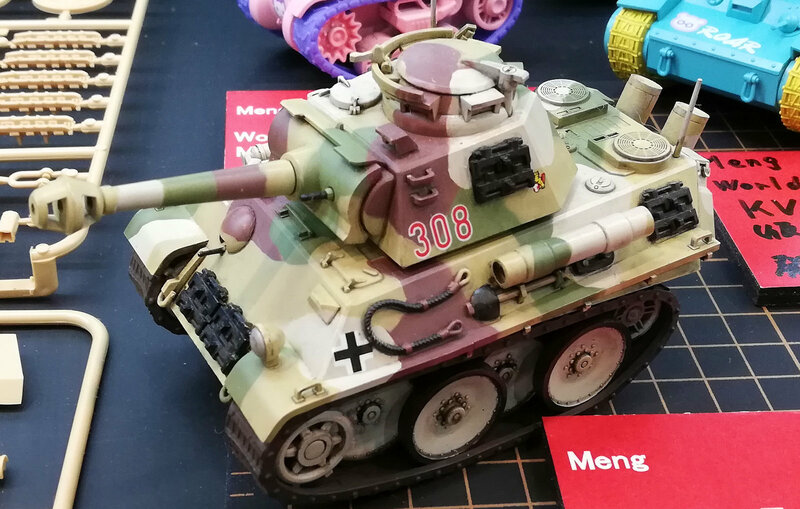 The M26 Pershing is another iconic tank now immortalized in "World War Toons" livery. 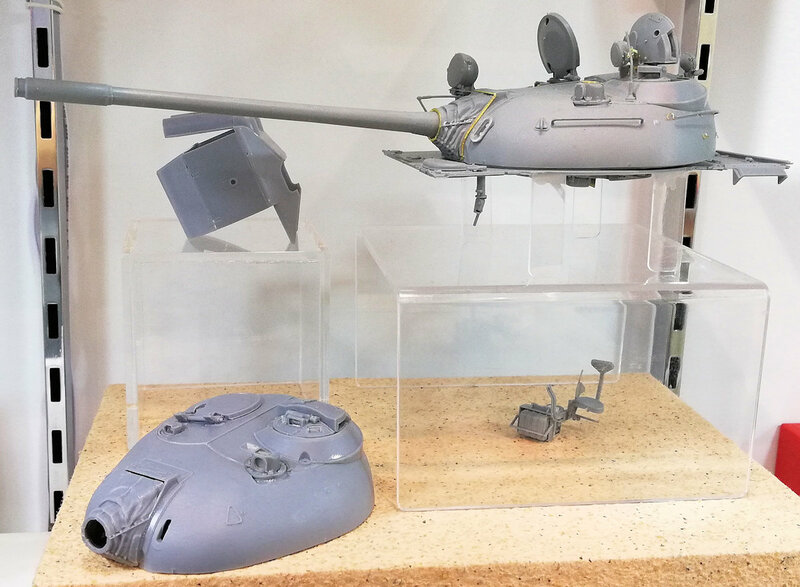 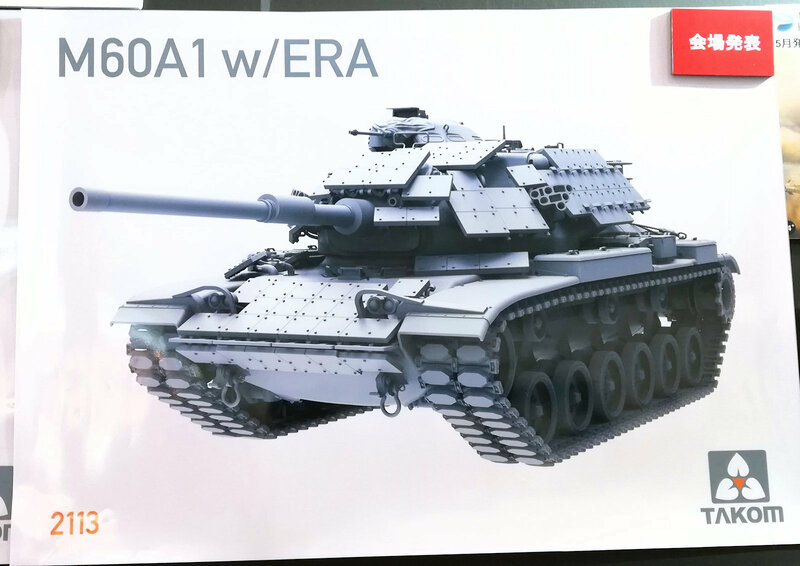 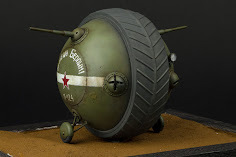 It looks like all of the right nuances of the tank are captured in this prototype. 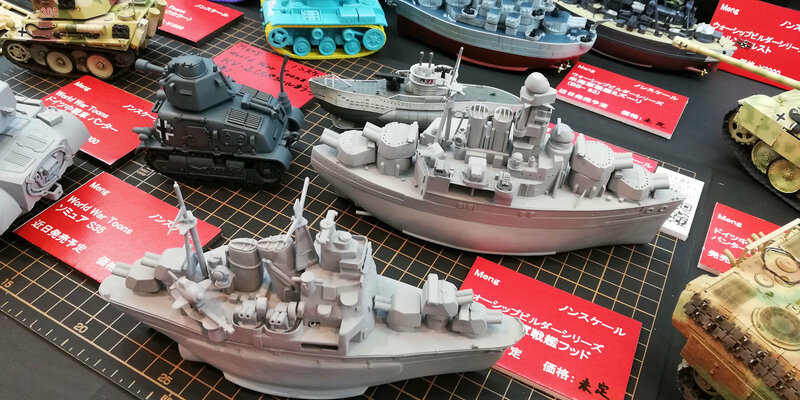 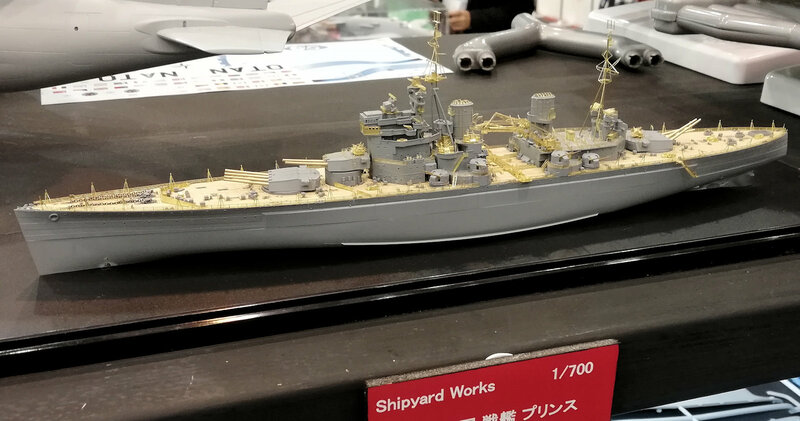 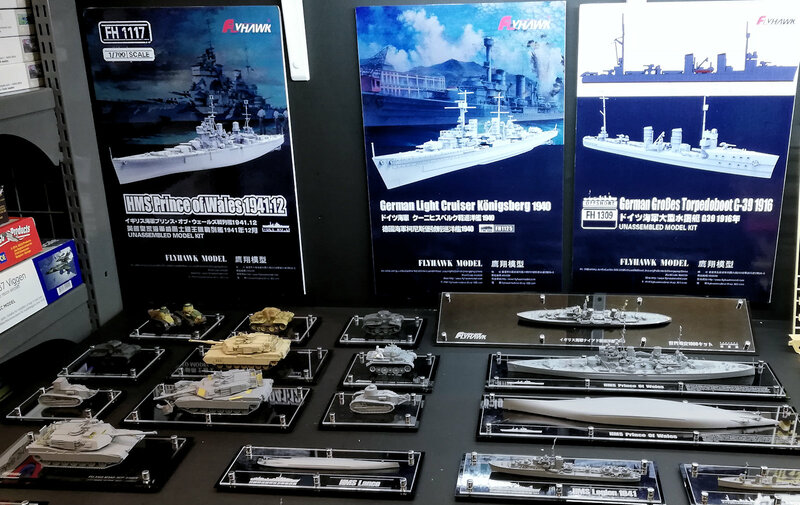 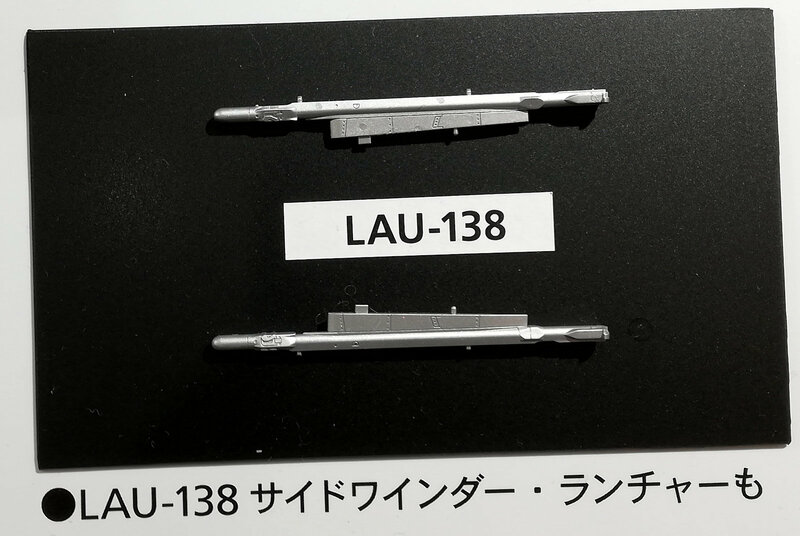 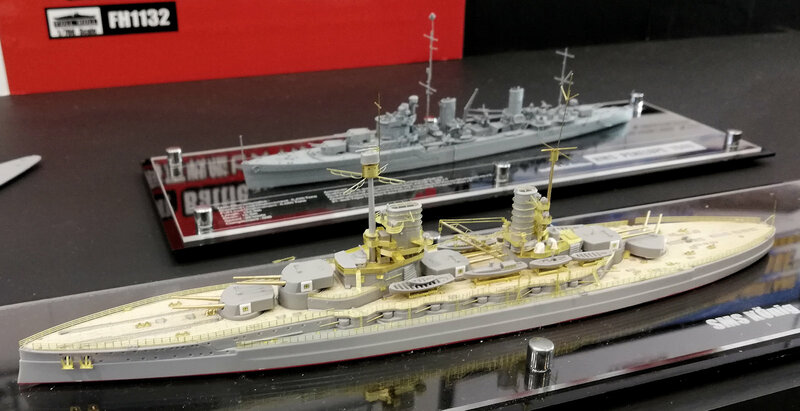 Several additions to Meng's non-scale Warship Builder series like the German U-Boat VII , England's battlecruiser HMS Hood, America's battleship USS Missouri, and Japan's IJN cruiser Atago were on display. 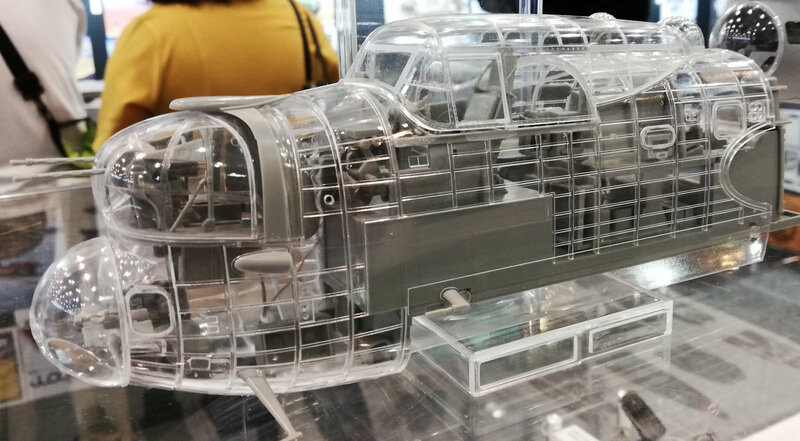 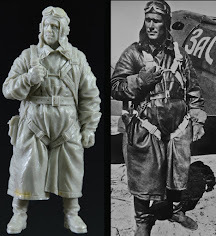 The might new kit of the Lancaster in 1/32nd scale from Hong Kong Models we on display - well the fuselage was anyway! 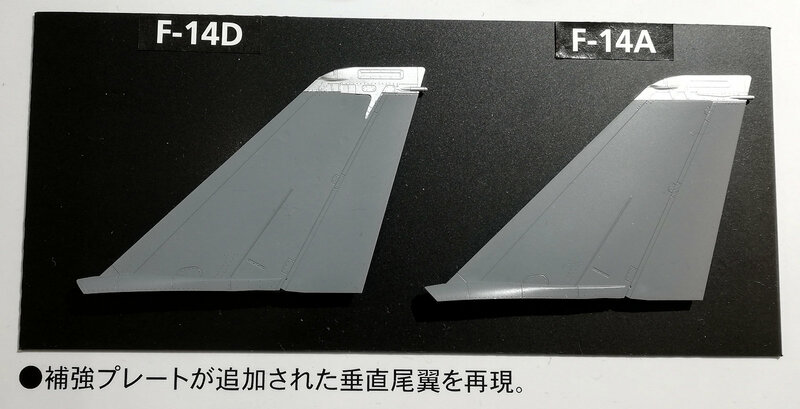 The front of the Mk.I and the latter Mk.III from what we can see was there, in clear and grey plastic so you could see the shape of the nose and the joint on the forward part of the wing. 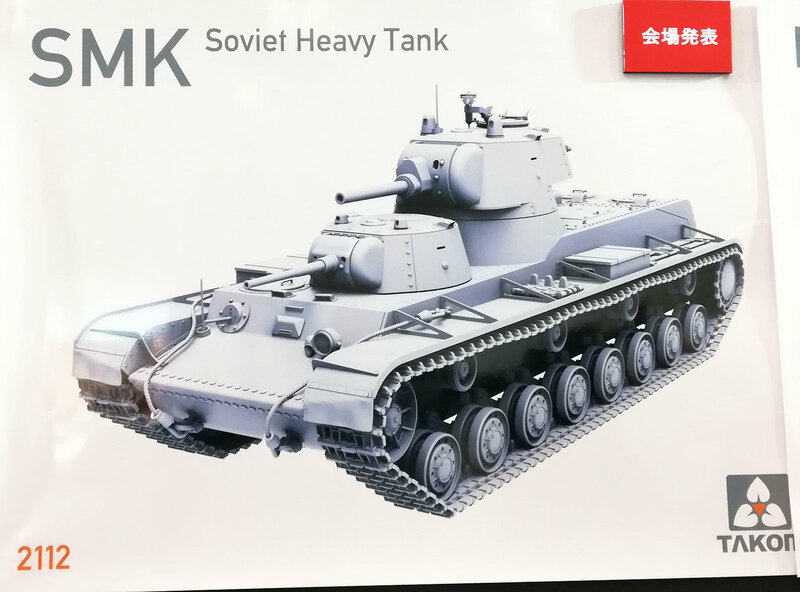 The early Mk.I with the windows present on the sides was on display. 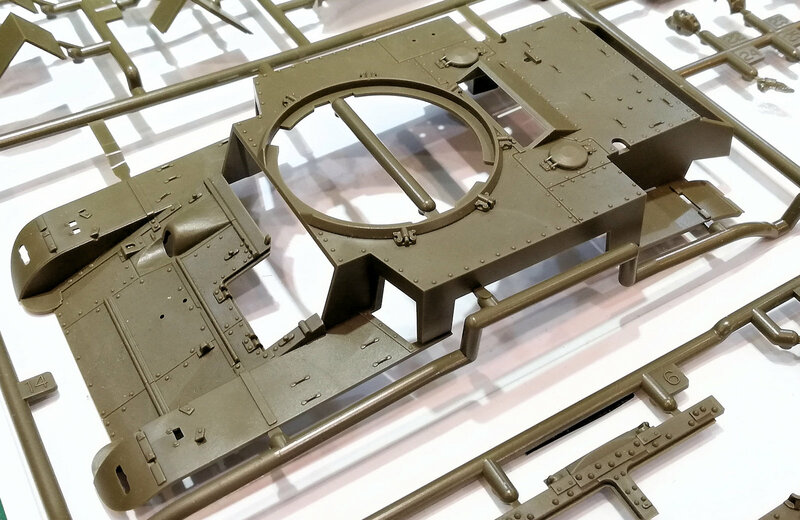 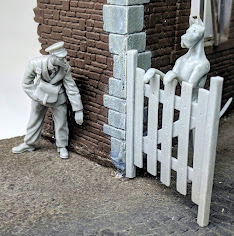 Note that the surface texture has not been applied to this kit, this test shot is only to finalise the shape of the kit before the last details are decided upon and added. 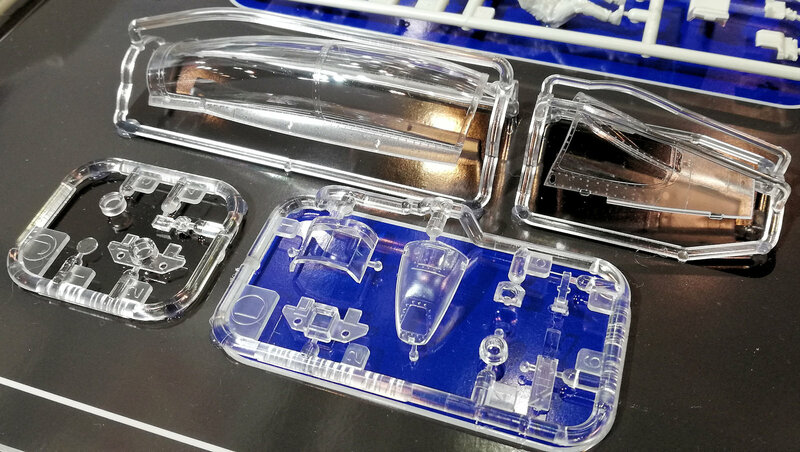 I could not see any ejector pin marks, any sink marks or mould defects on this clear version, it would be nice if we could get a clear fuselage version on one of their kits in the future wouldn't it? 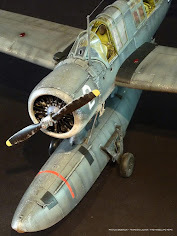 Also on display is the completed kit of the Dornier Do 335 B-6 in 1/32nd scale. 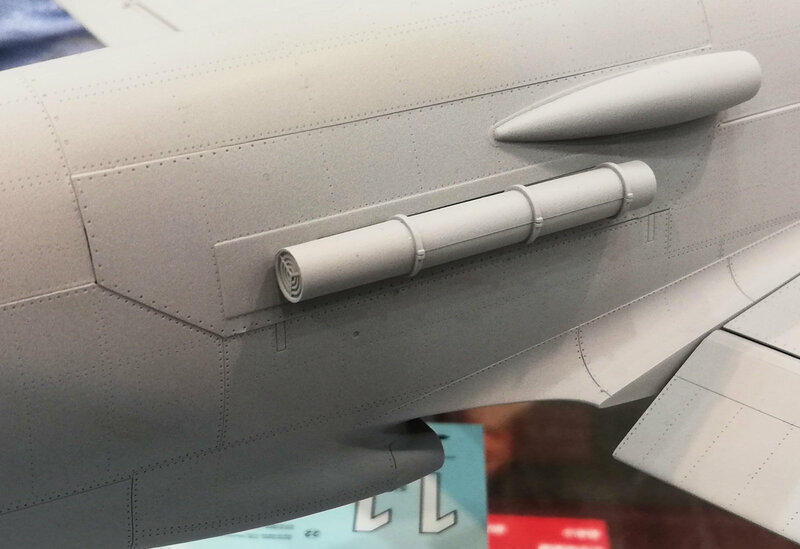 This powerful looking aircraft has lovely surface detail, a few changes from previous kits in the series are present. 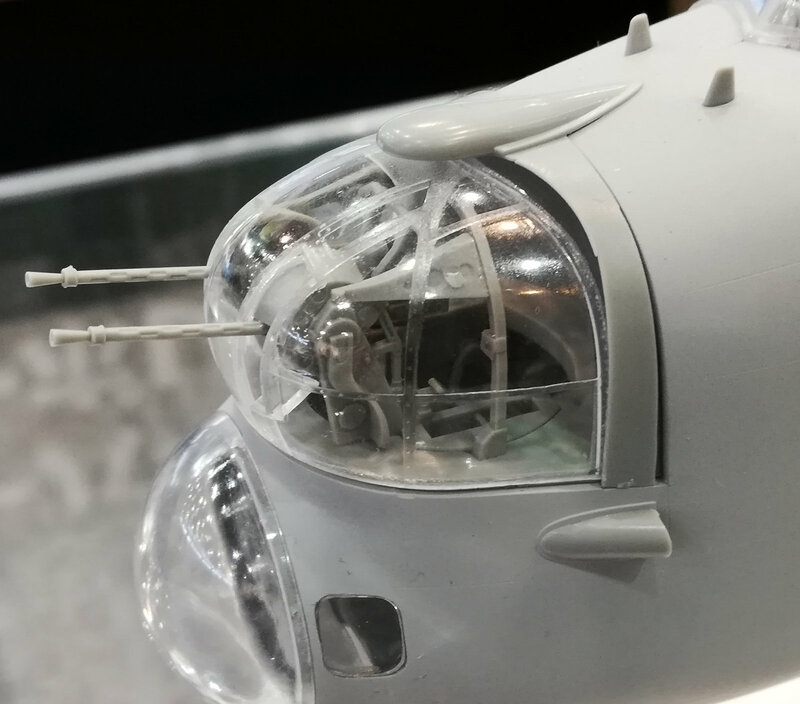 This kit has the radar operator/ navigator's station bulge prominent ad well as flame diffusers and several other changes - the radar aerials being the biggest protrusion. 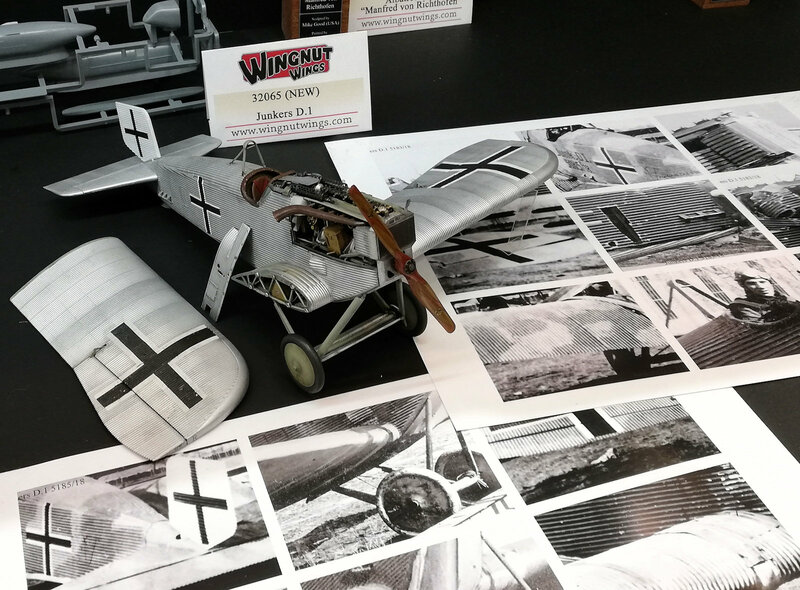 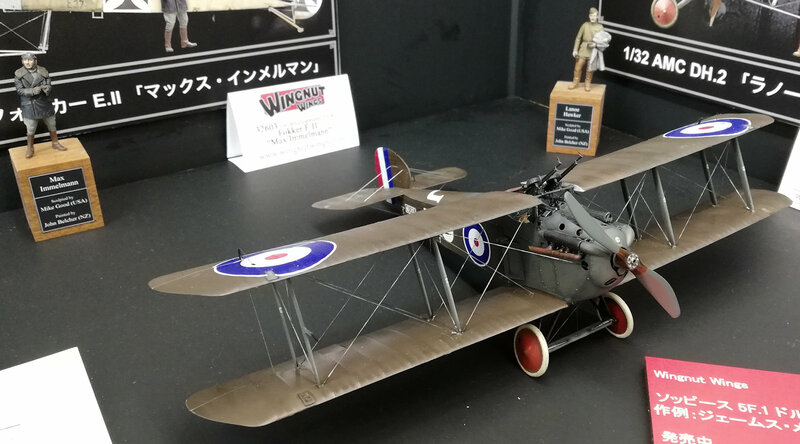 Decals are provided for captured french and German "Pfeils"
Wingutters loved the display of the World War I aircraft and figure, including a Sopwith SF.1 Dolphin, Junkers D.1, and a Halberstadt Cl.II still in development. 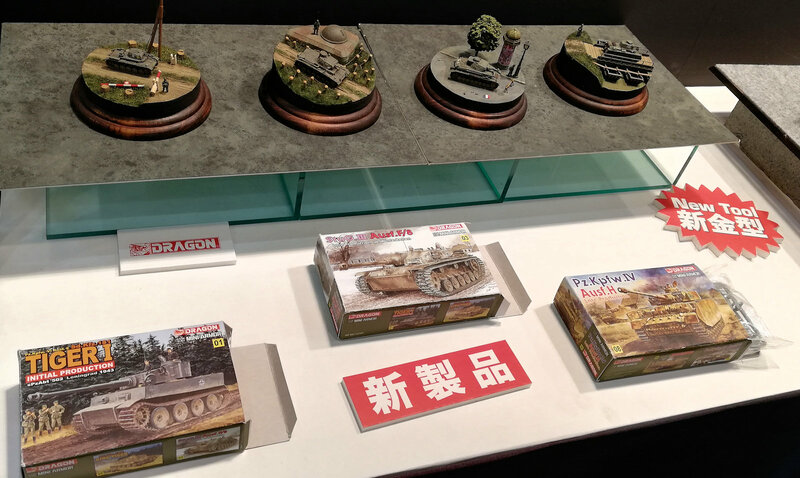 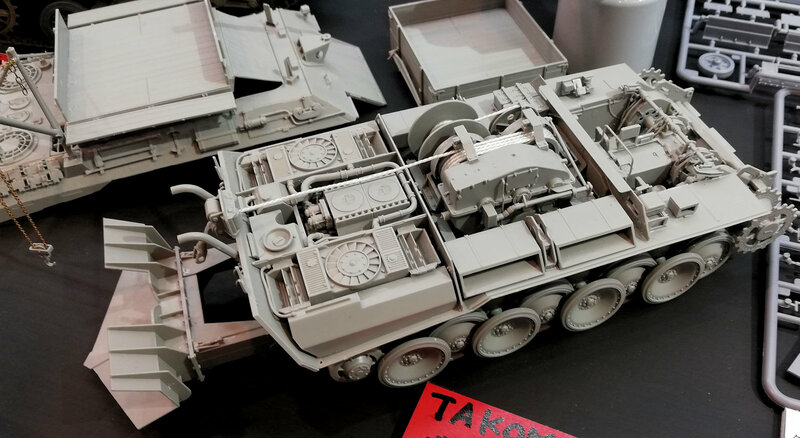 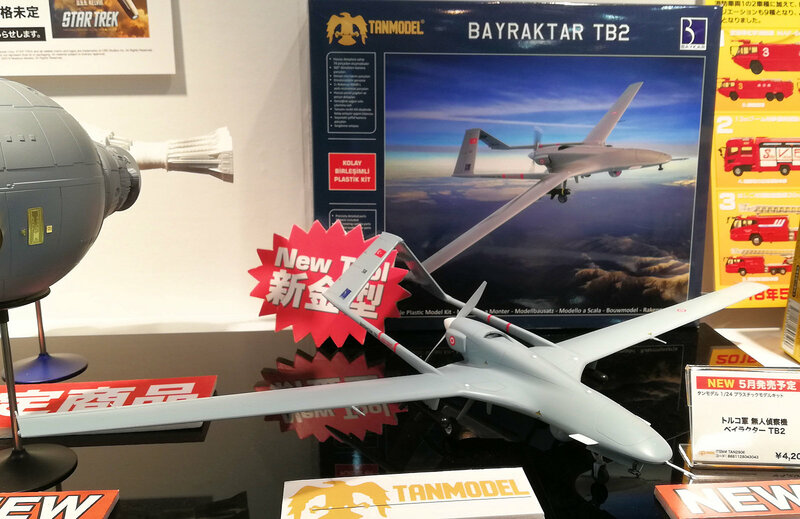 Takom had on display some interesting new kits including two that had just been announced. 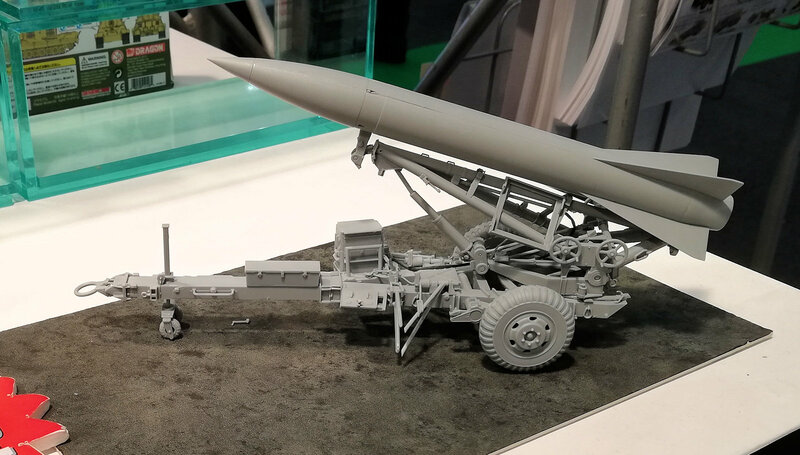 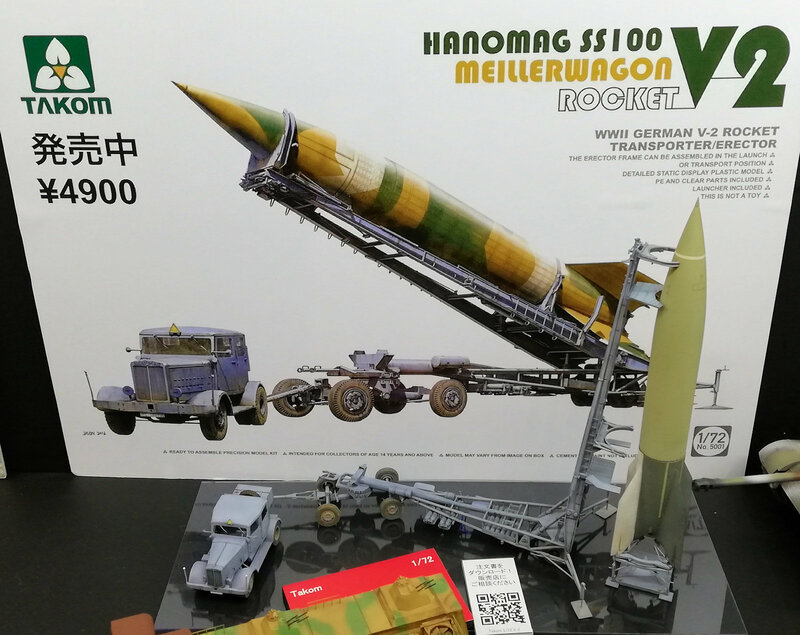 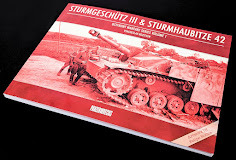 The two kits announced especially at the show were the Soviet SMK Heavy tank in 35th scale..
Also on display was the 72nd scale Hanomag SS100 Meillerwagen V2 rocket transporter and erector trailer with rocket in position to be launched right thru the Beaver stand! 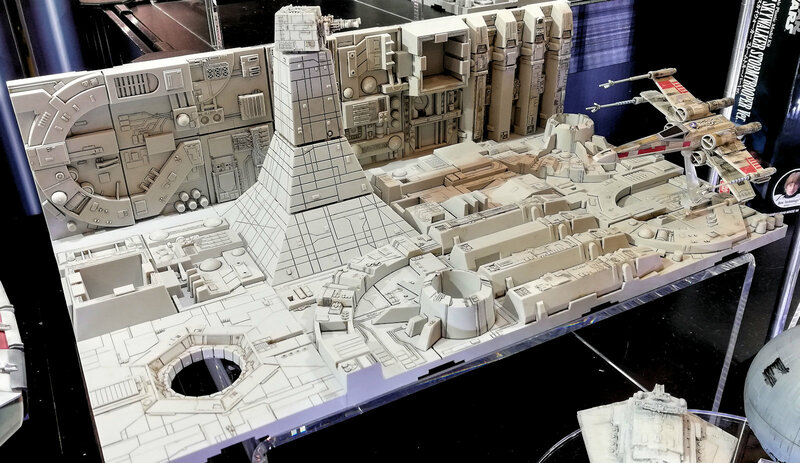 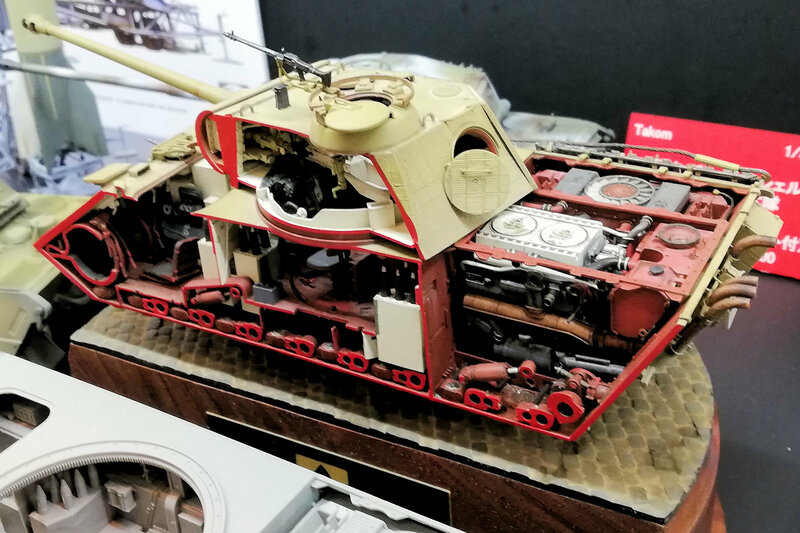 The full interior of the Bergepanther was there on display with the top and bottom halves separate - so many people were drooling over this kit it almost needed a splash guard. 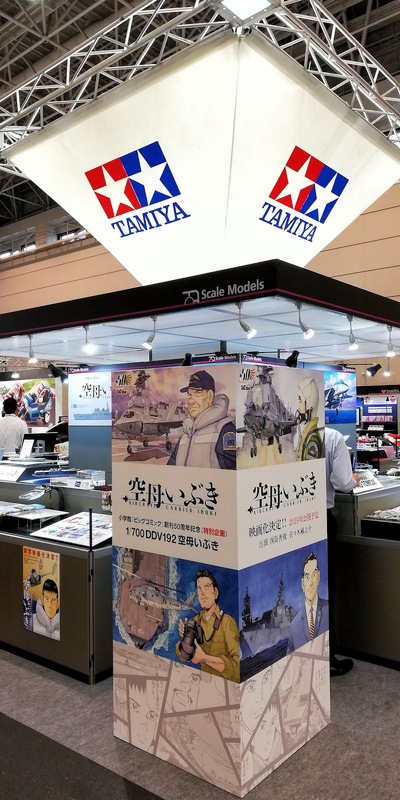 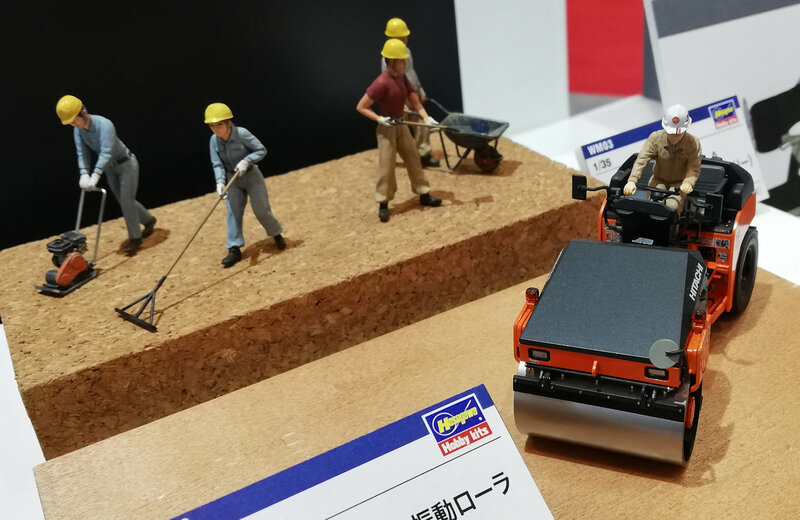 It is kind of their show in a way, and Tamiya is always a large presence at this event s- so we have left the biggest 'till last. 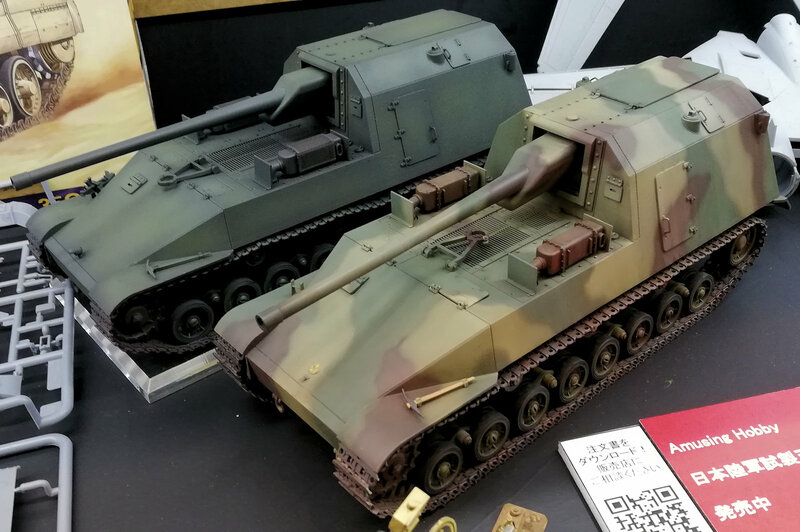 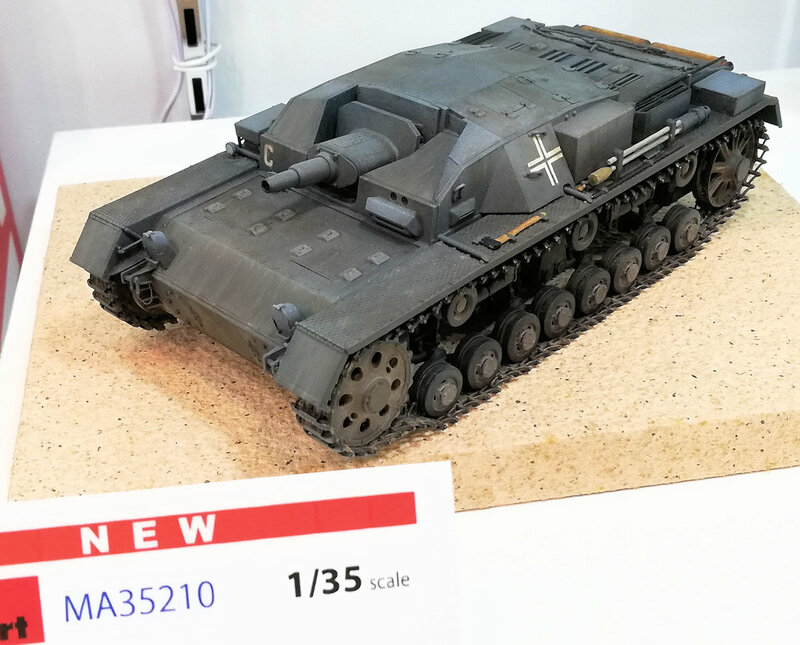 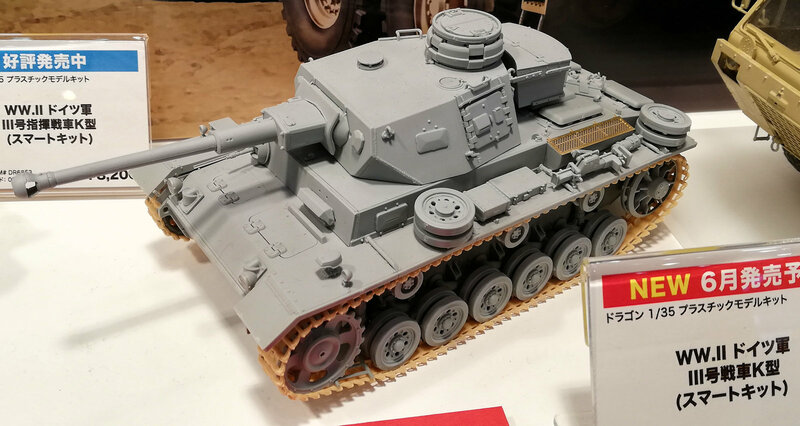 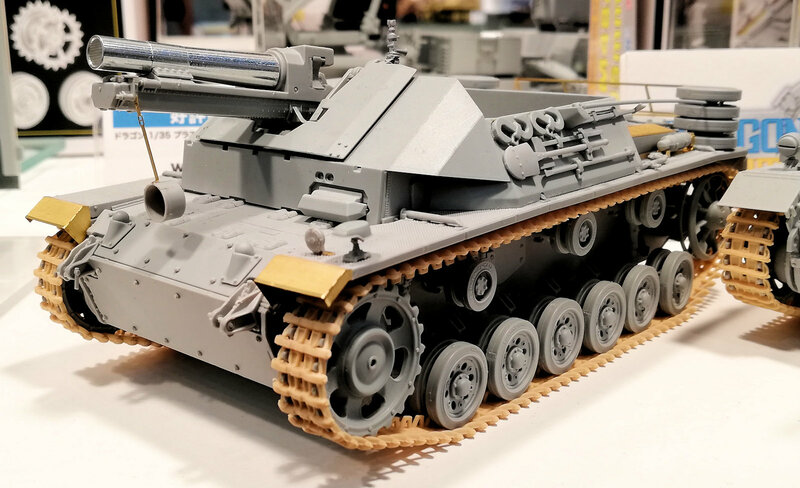 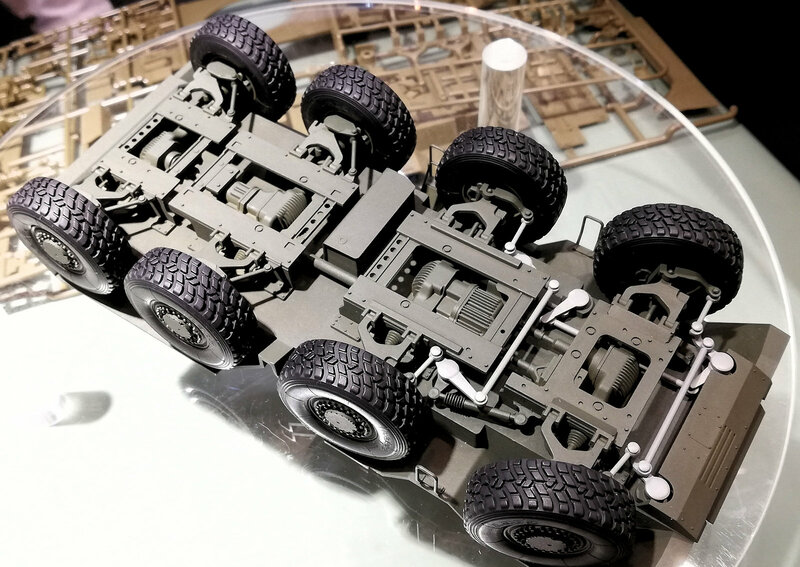 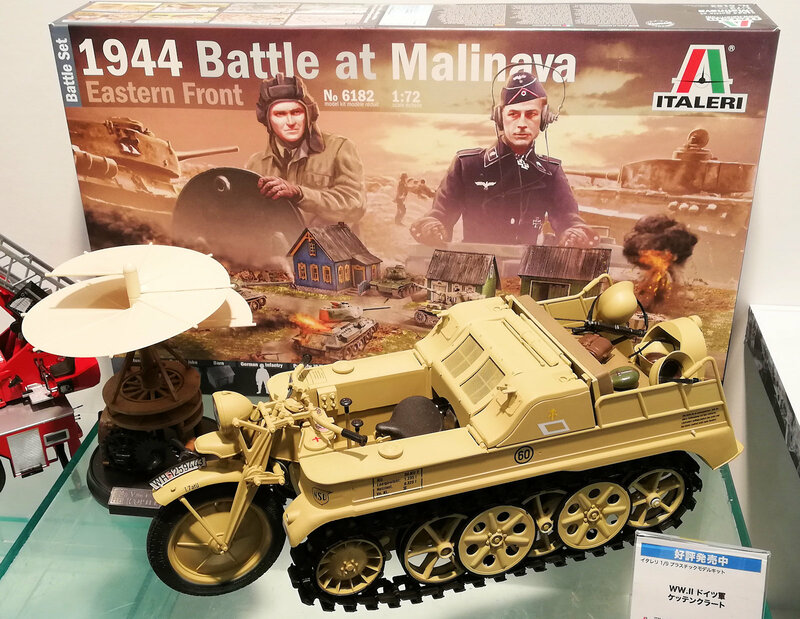 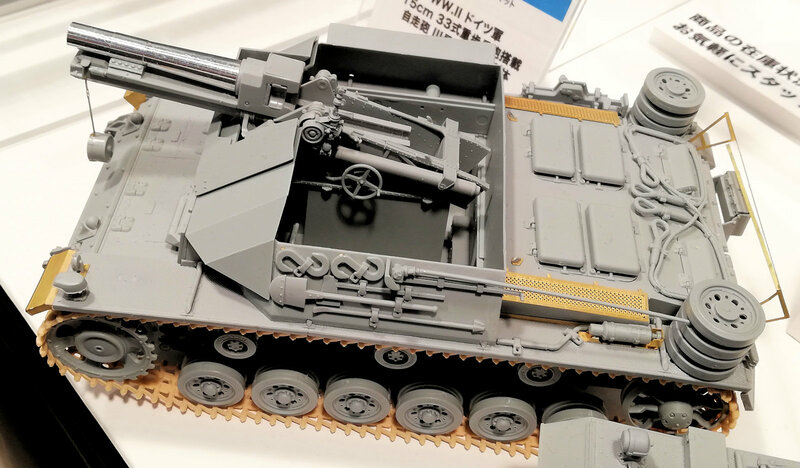 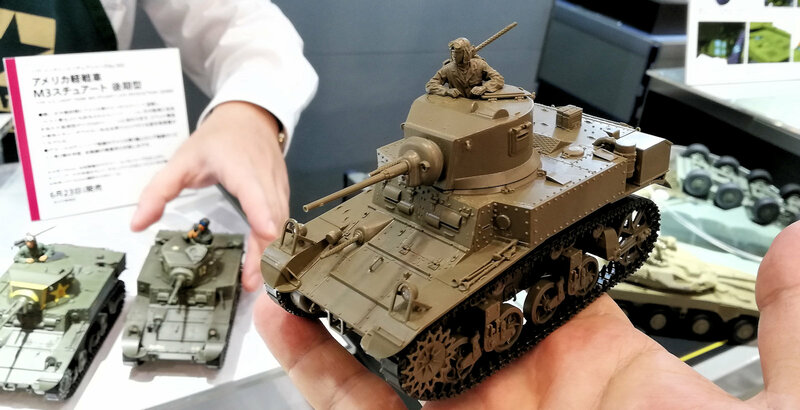 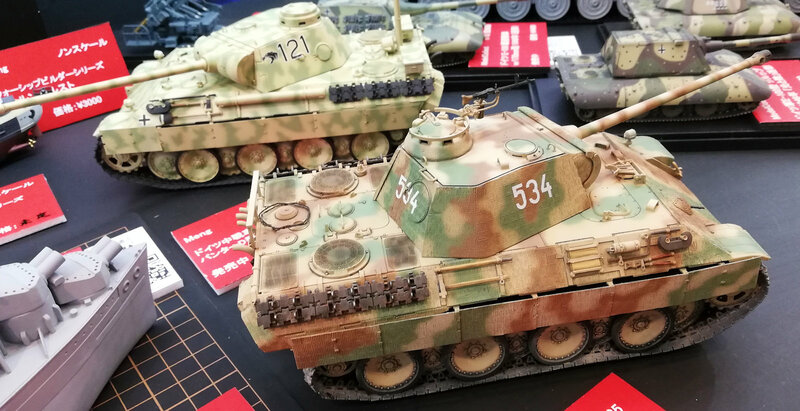 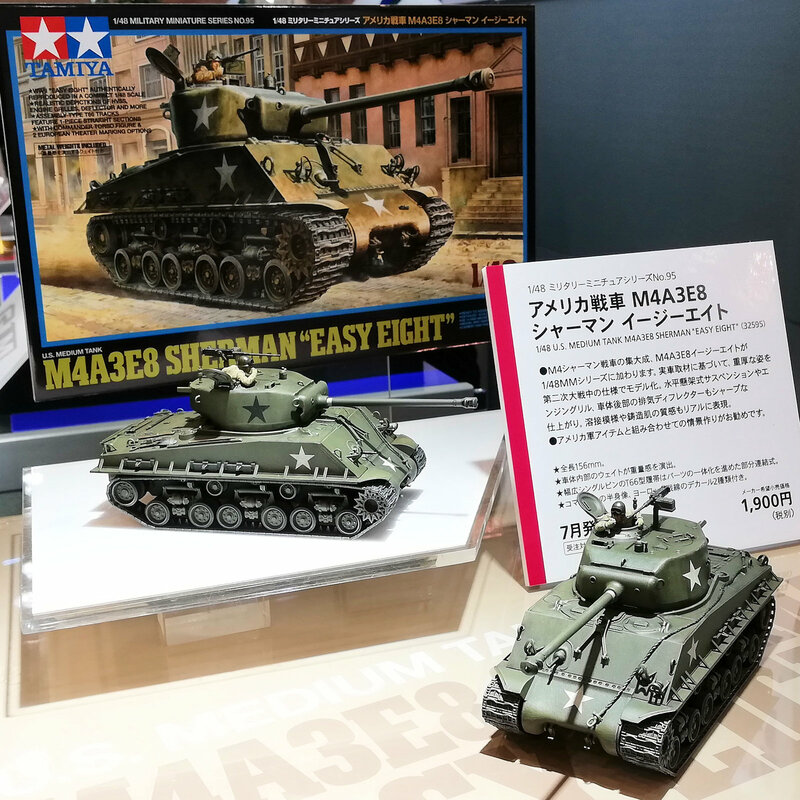 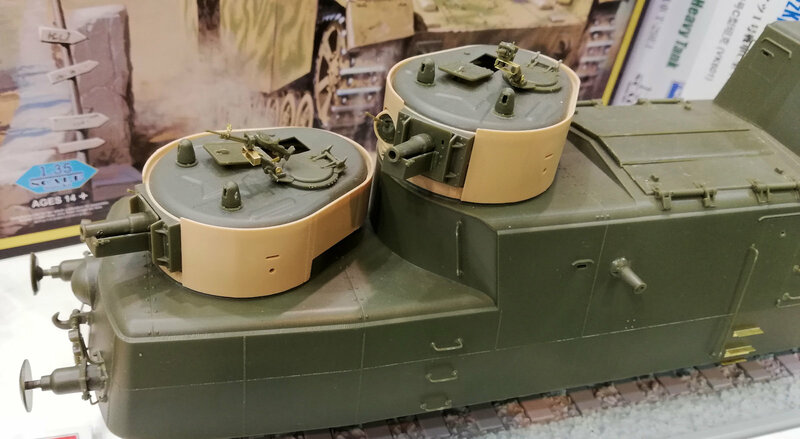 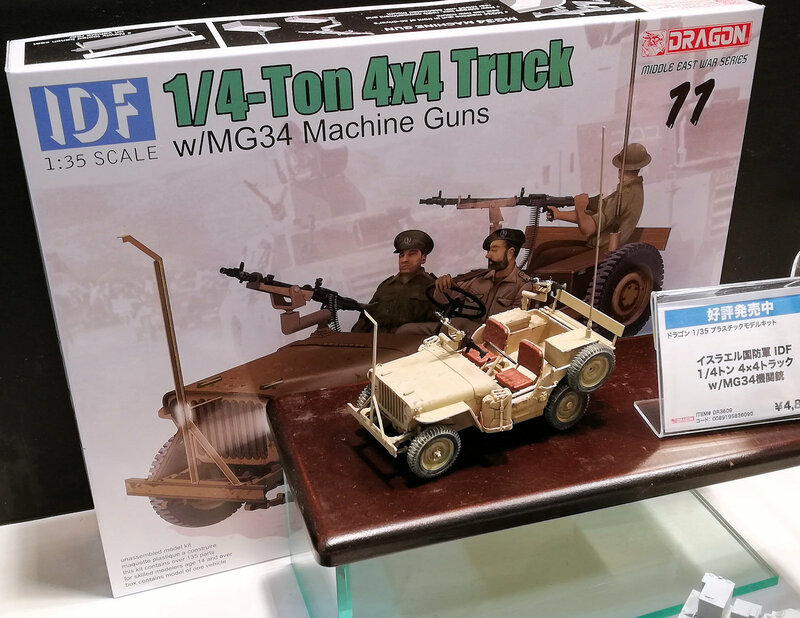 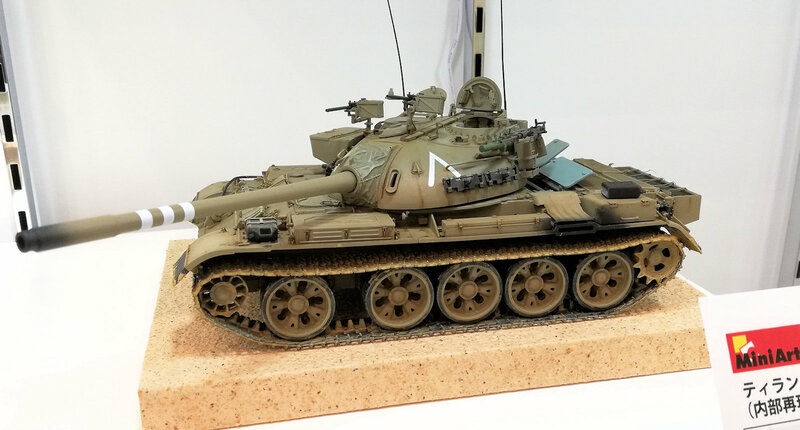 Tamiya had a lot on display at their hoe show, the new tool kit of the late-production version of the US Light Tank M3 Stuart which is an update of the nearly 45-year-old original Stuart kit. 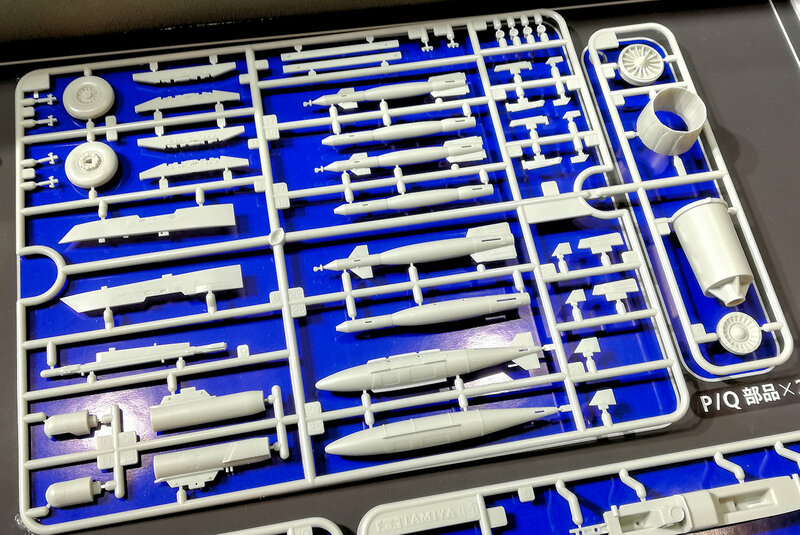 This new tool kit in 1/35th scale has new decals and it looks nicely executed. 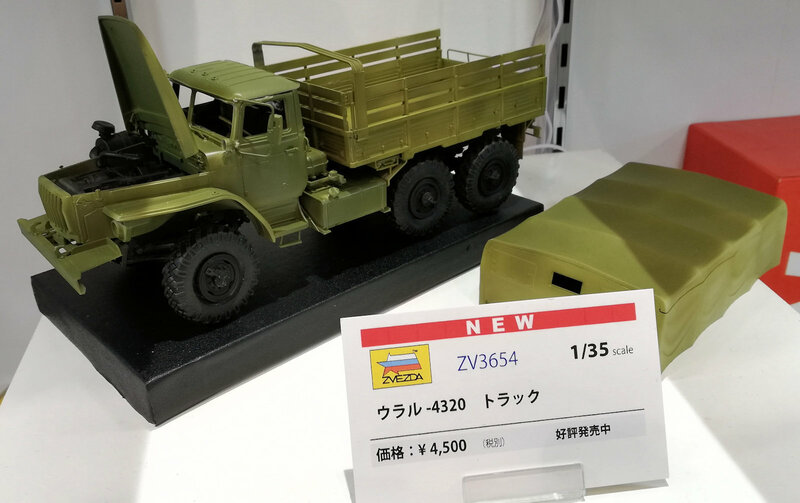 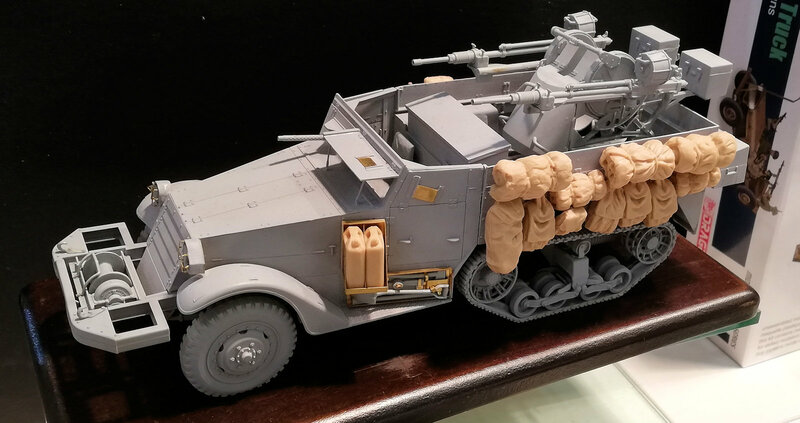 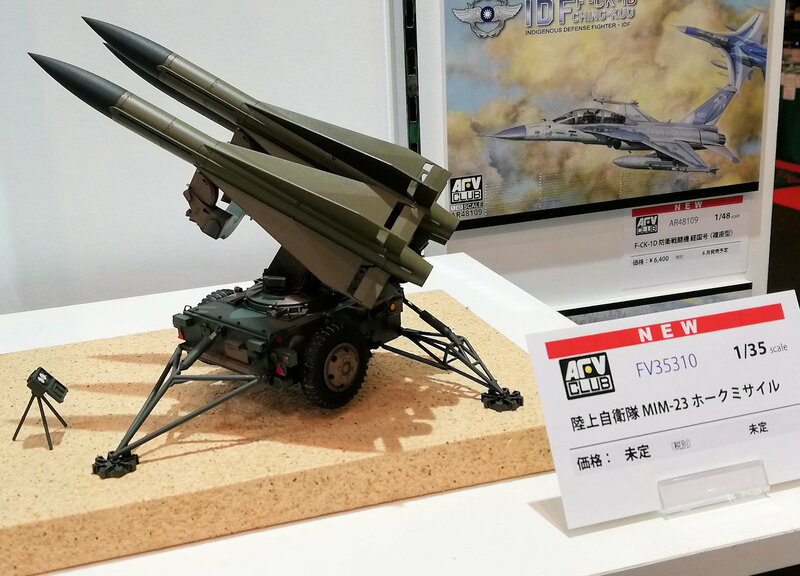 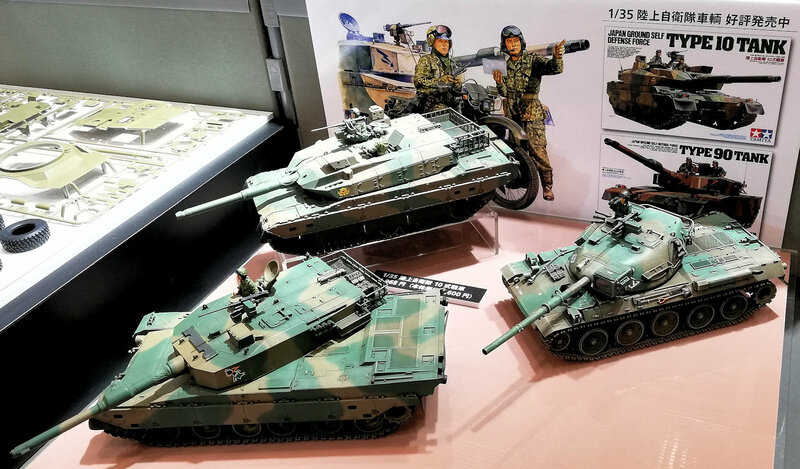 Also at the show the Japan Ground Self Defense Force MCV Type 16 kit no# 35361 in 1/35th scale (Estimated Arrival: August 20) was on display. 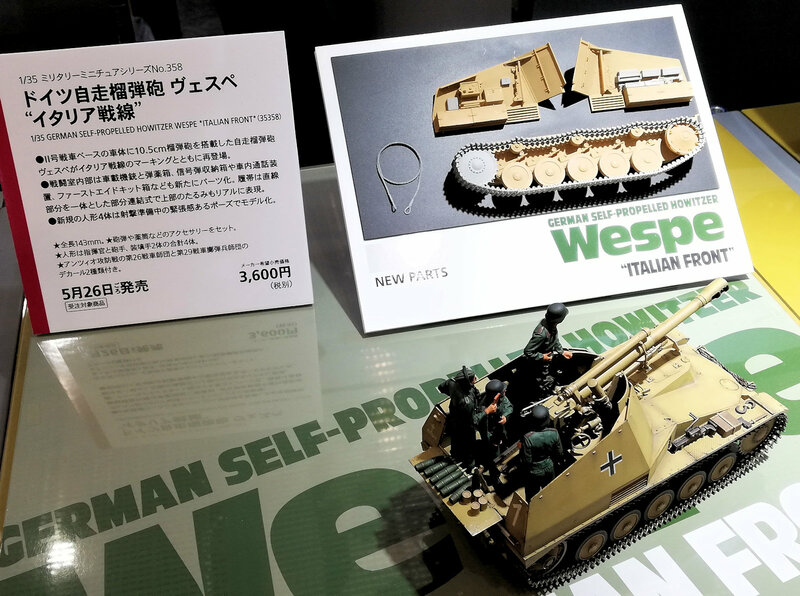 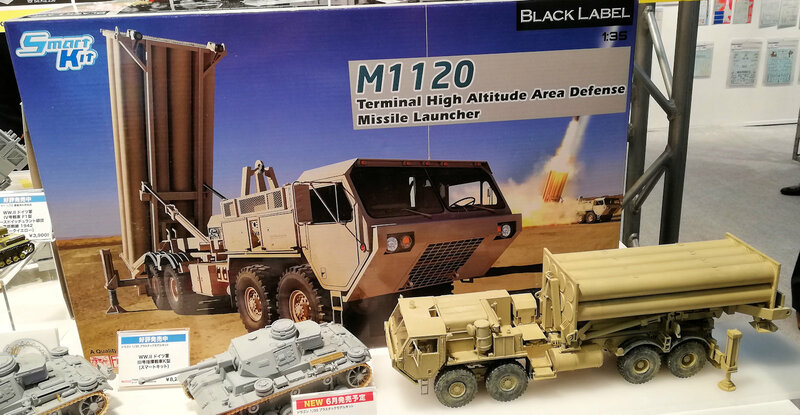 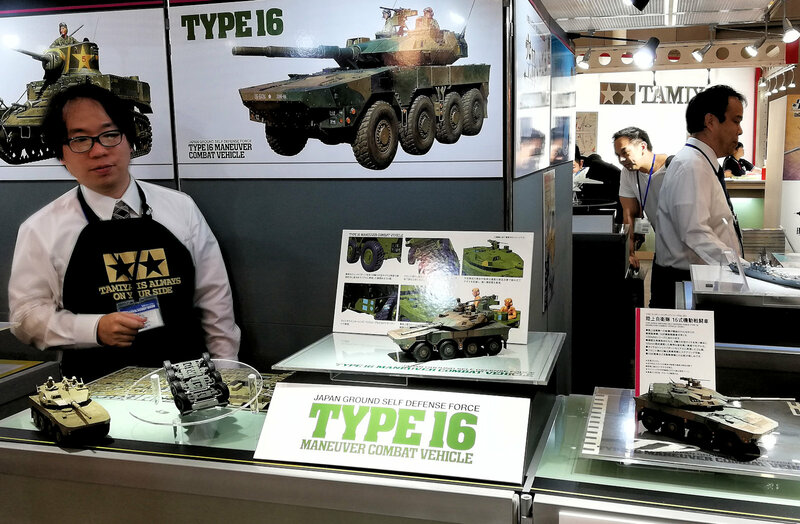 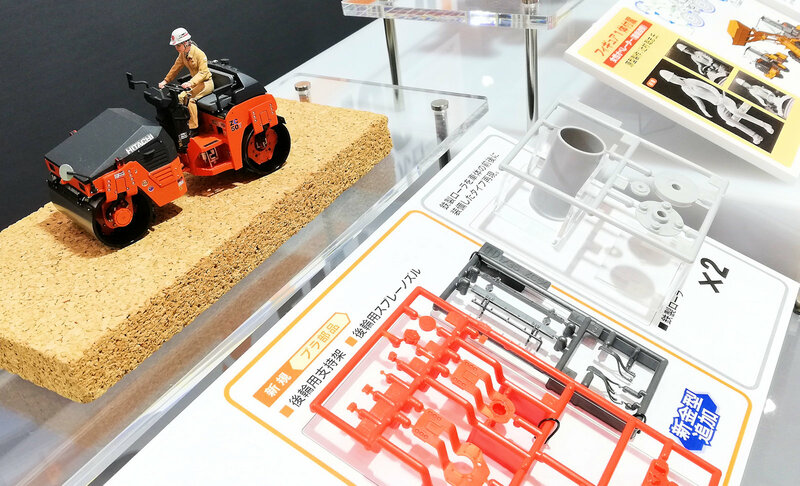 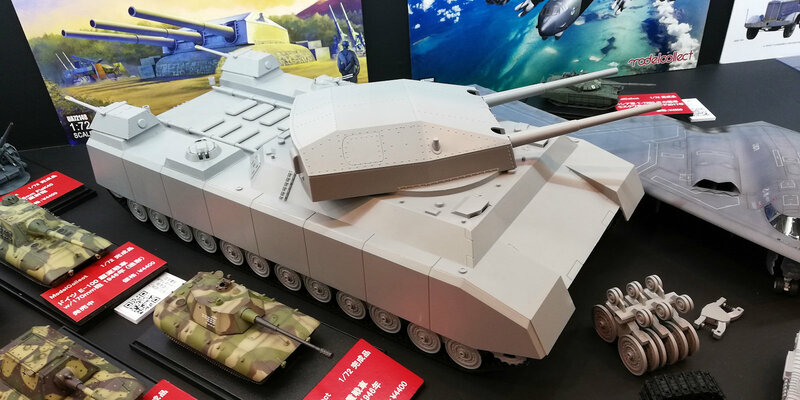 This scale model assembly kit recreates the Japan Ground Self Defense Force (JGSDF) Type 16, which reached units beginning in 2017. 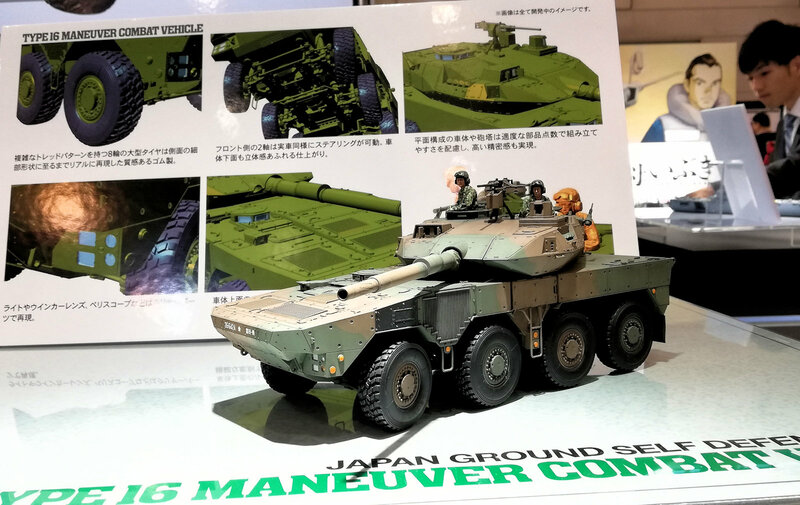 An 8-wheel vehicle, the JGSDF classify it as a Maneuver Combat Vehicle (MCV), a highly mobile and well-armed vehicle intended to provide supporting fire and take on enemy armor as a part of rapid response units. 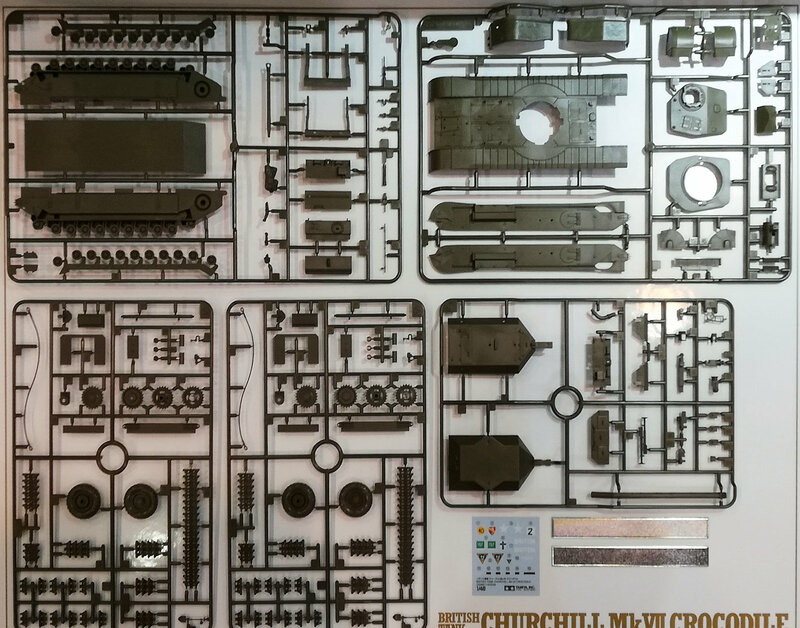 Also on display was the 1/48th-scale new British Churchill Mk.VII Crocodile. 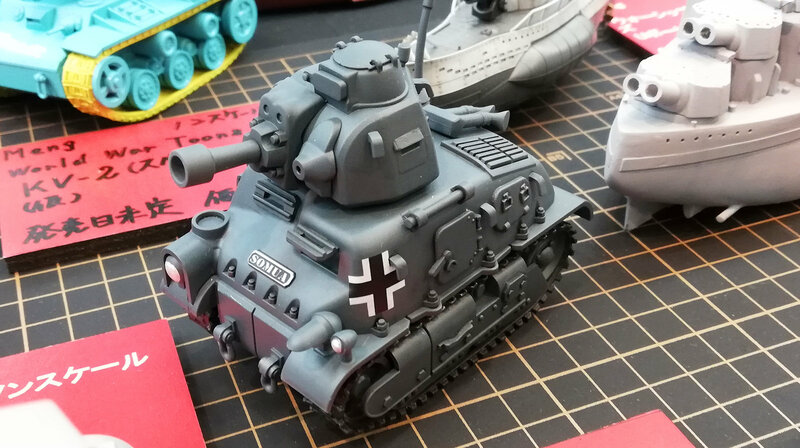 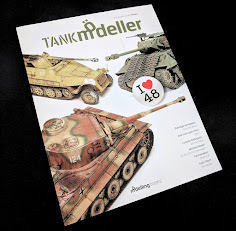 This tank has been available as a 1/35th-scale kit for a while, but now it has been scaled down to 1/48th scale. 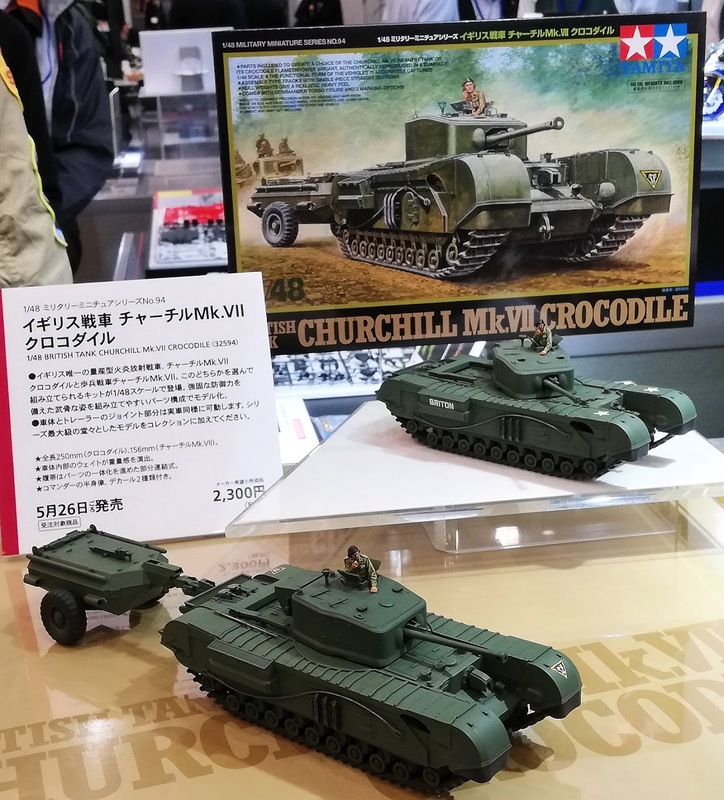 The Crocodile variant of the Churchill is notable for replacing the machine gun with a flamethrower, and adding a trailer to hold the fuel for the flamethrower. 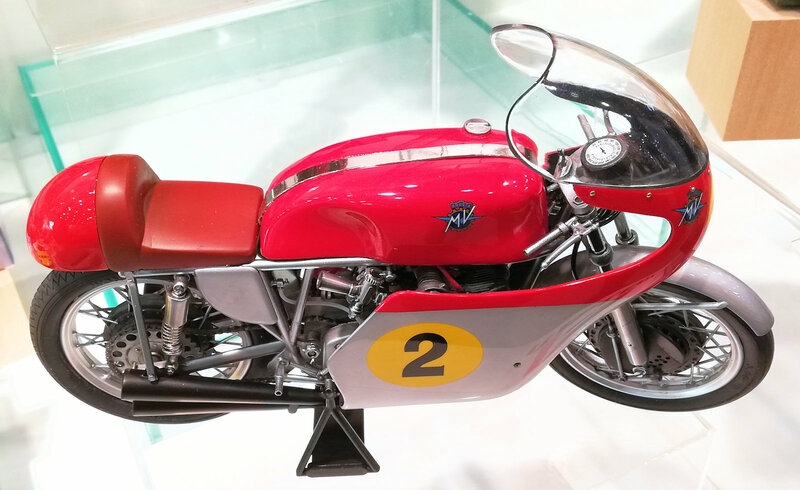 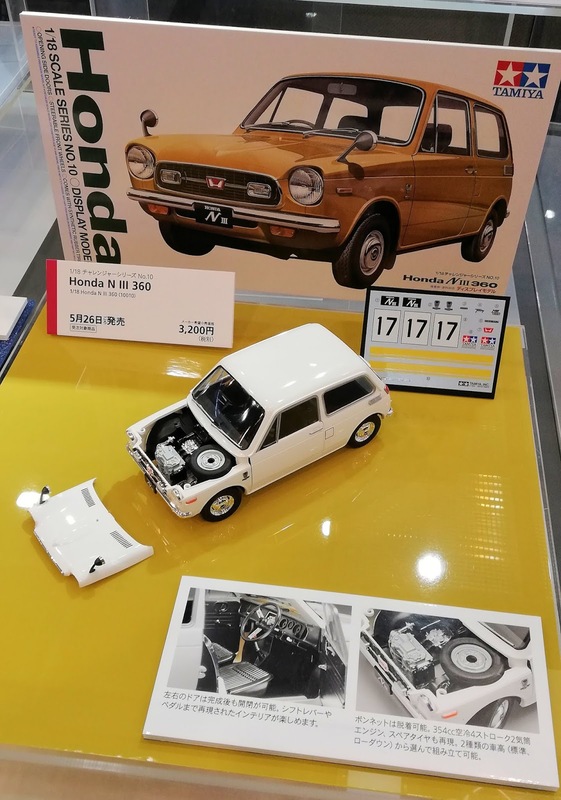 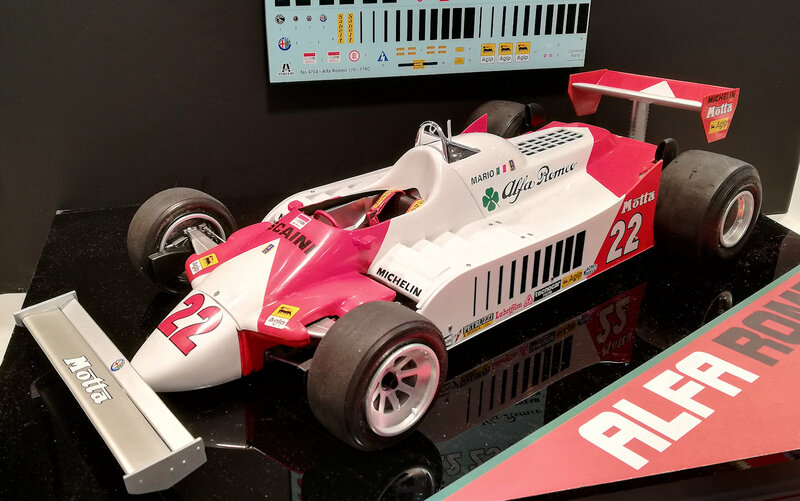 The Honda 1/18th scale N III 360 was there. 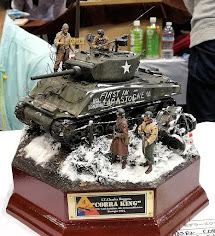 Another 48th scale kit on display was the M4A3E8 Sherman, due to be popular in this ever increasing range of scaled kits. 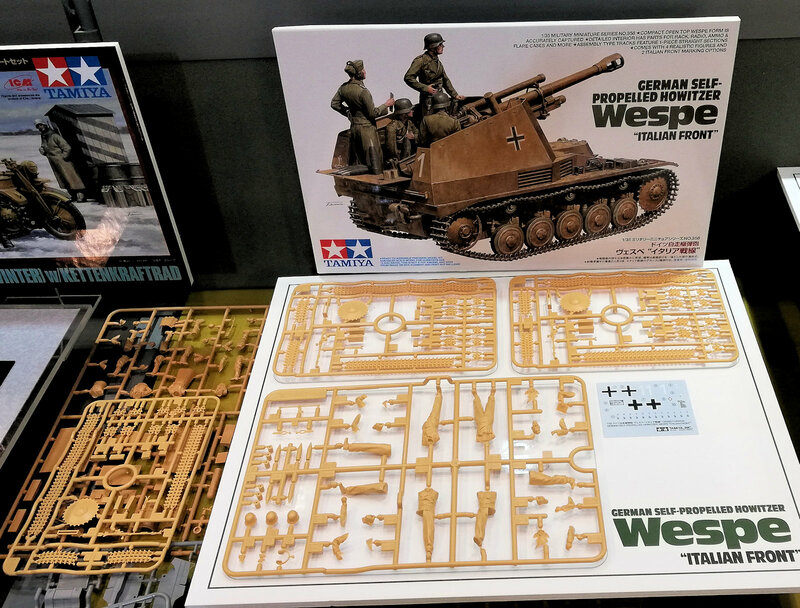 A nicely displayed 35th scale Wespe SPG looked like a simple but easy kit to make and the crew look very nice - recognize any faces in there? 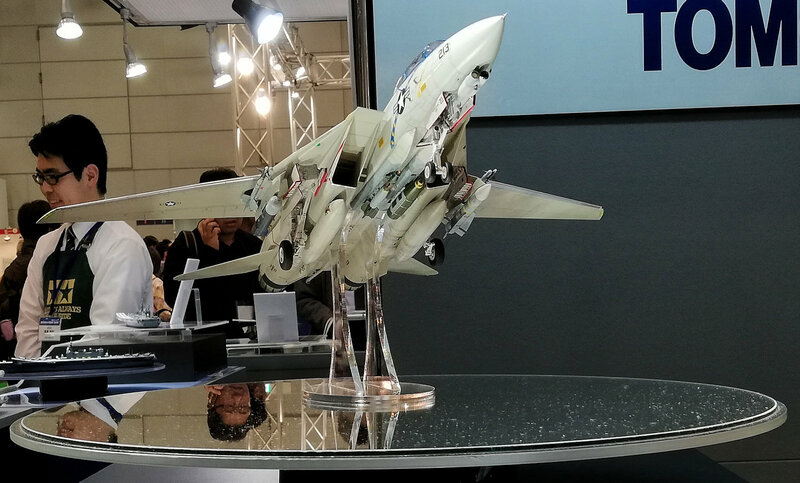 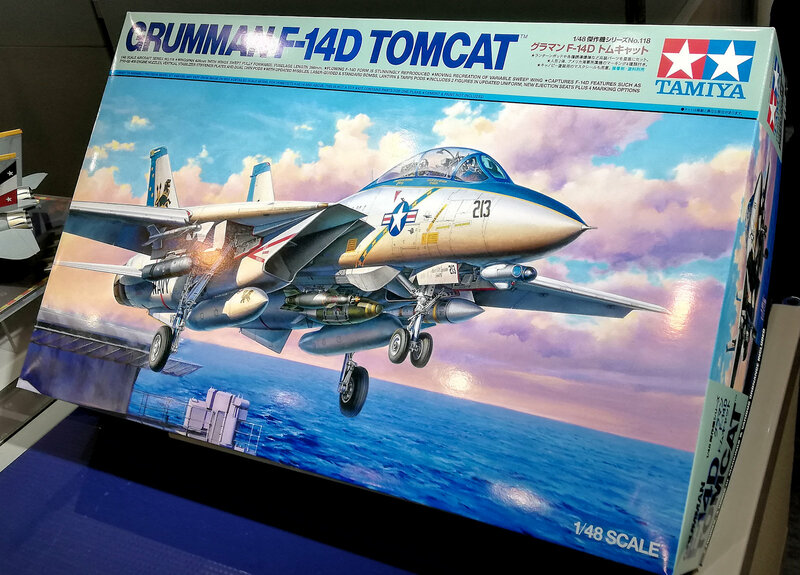 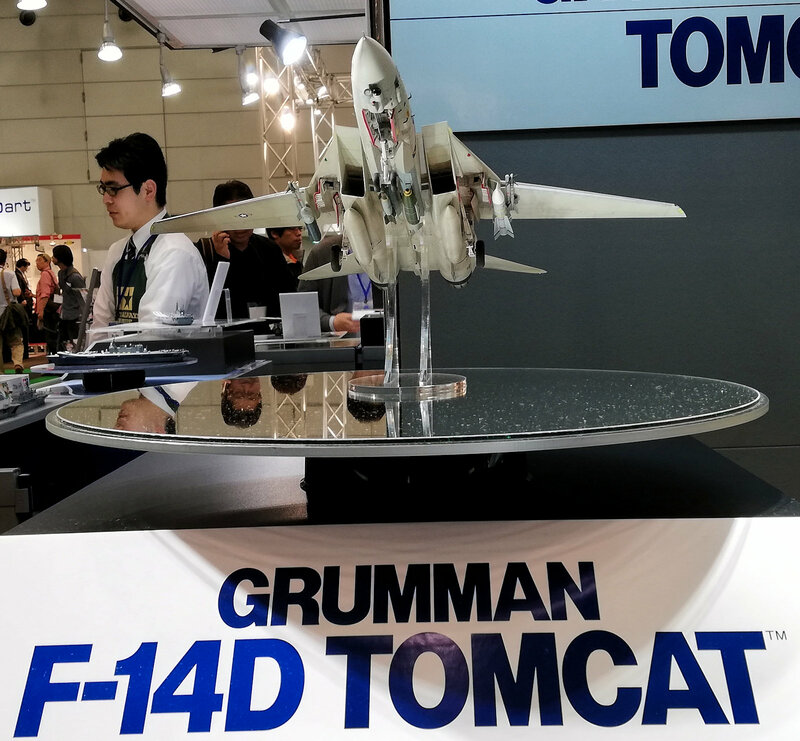 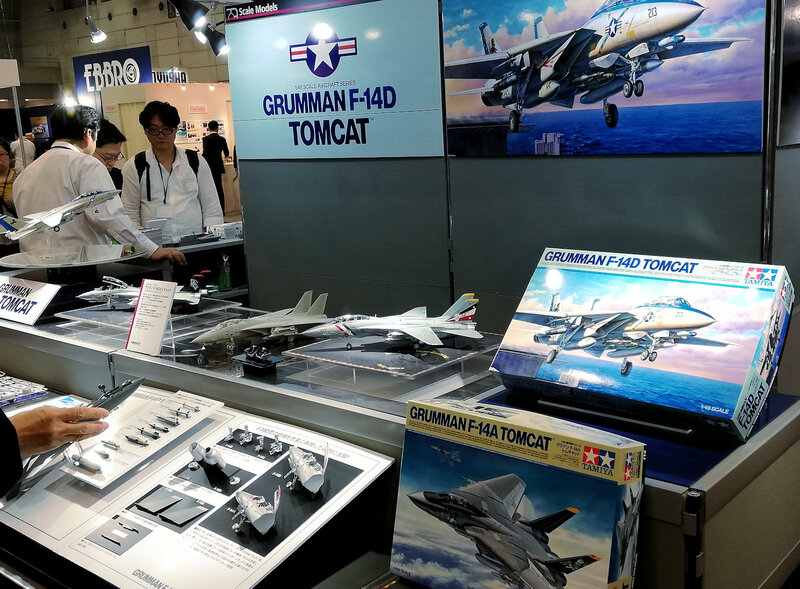 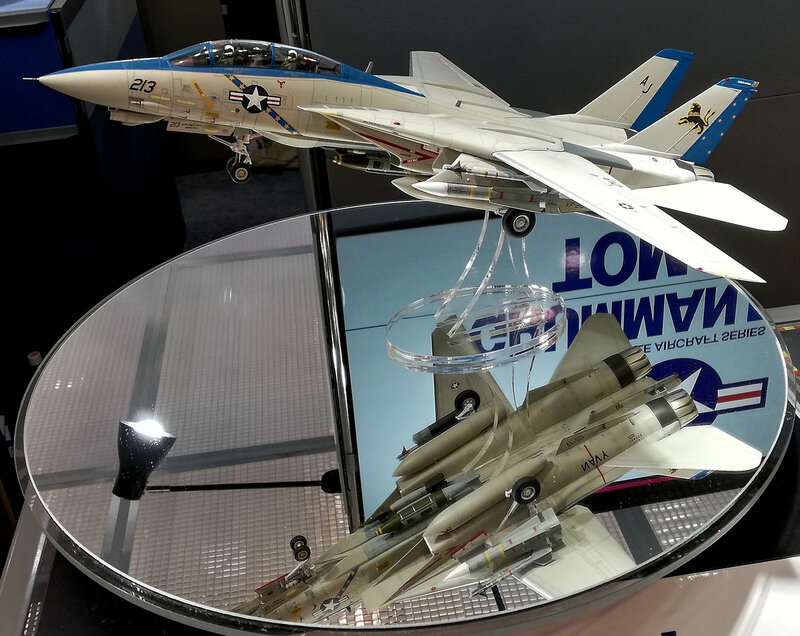 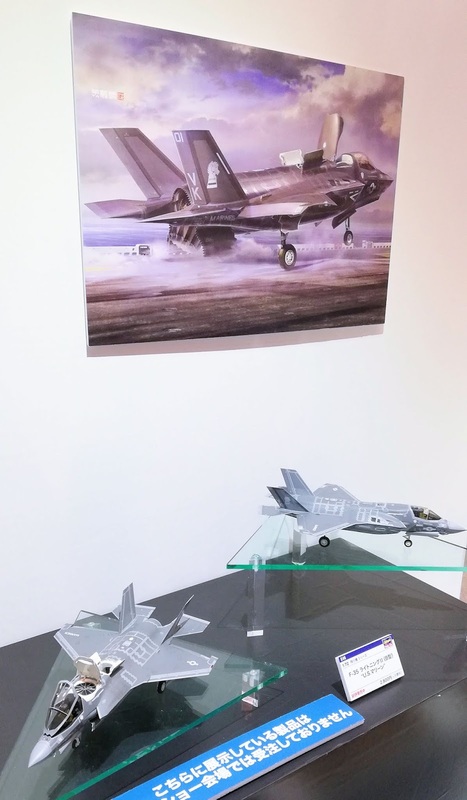 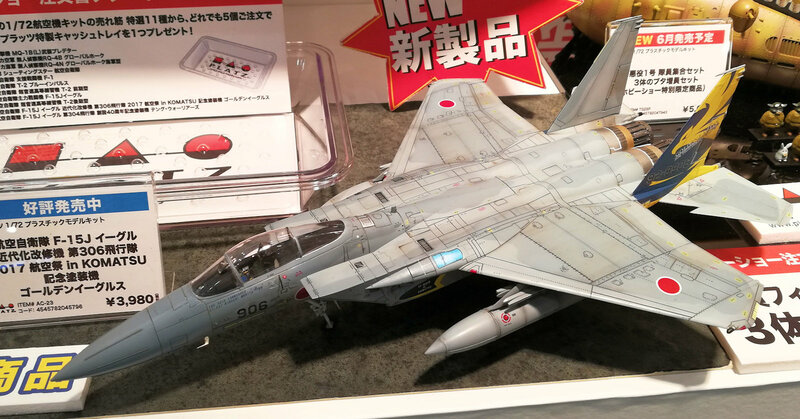 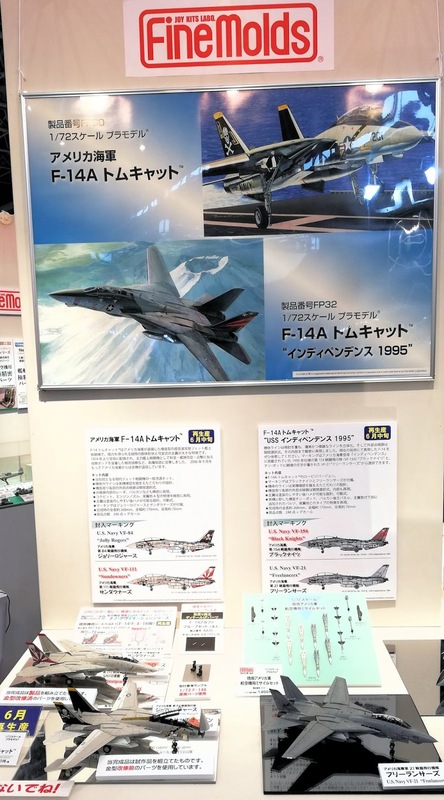 Lastly, interested in it or not was the star of the show, the new Grumman F-14D Tomcat in 1/48th scale item:#61118was also shown on display, featuring a wide variety of missiles and decals, as well as new parts highlighted. 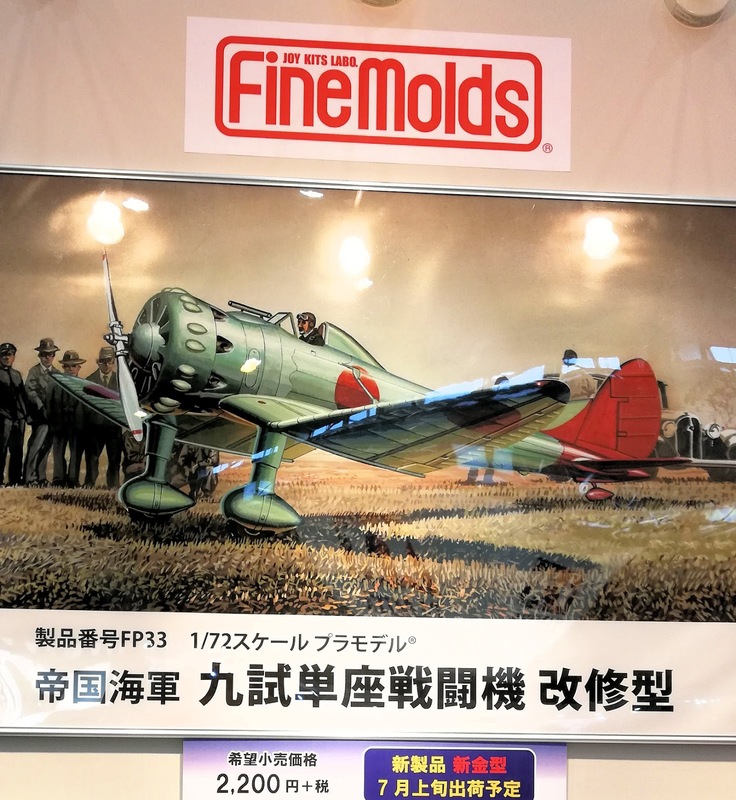 The box art for this kit is really beautiful, as nice as the A model we saw at this show for the first time two years ago. 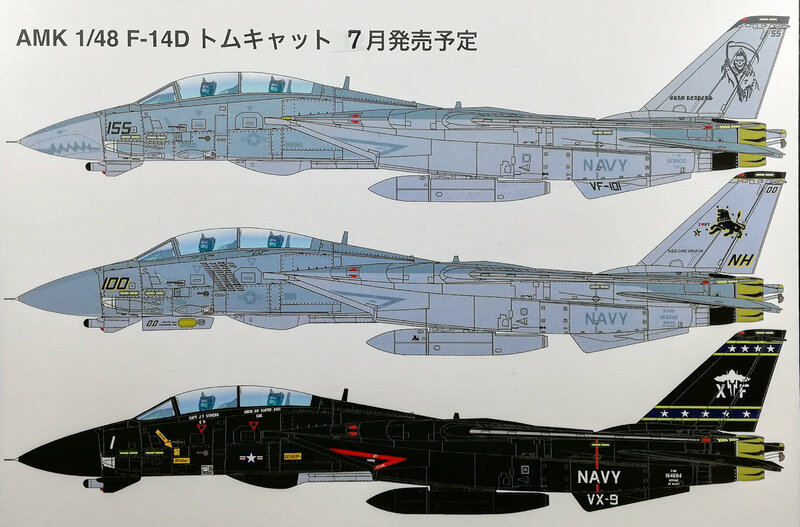 New decals for three Tomcats were on show. 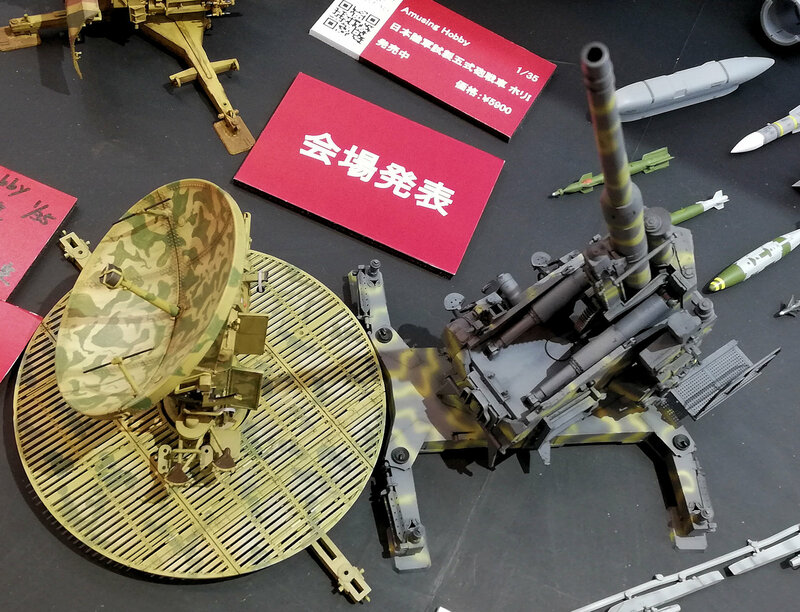 Some of the made up features of the kit shown off at the event.